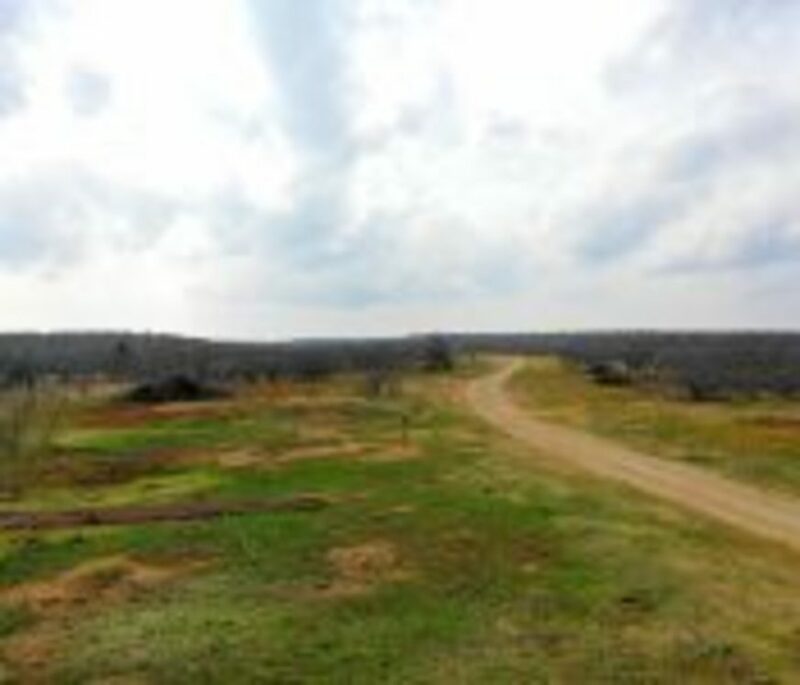 COME LIVE or COME PLAY! 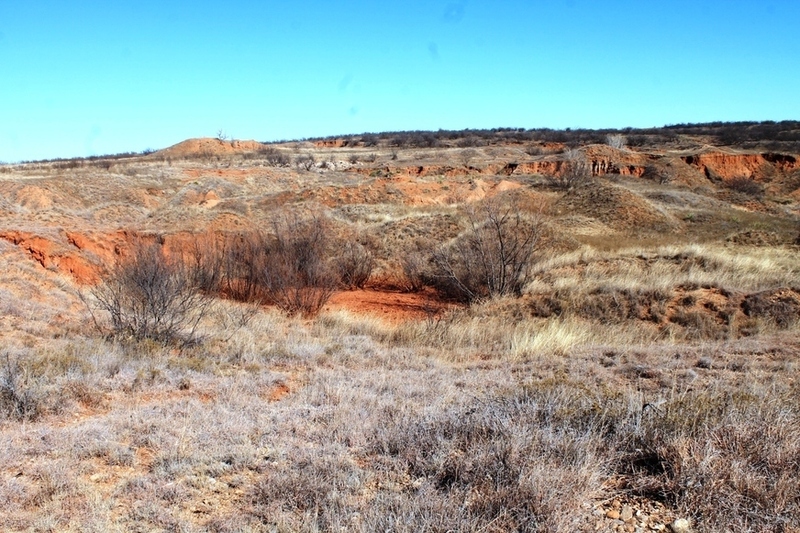 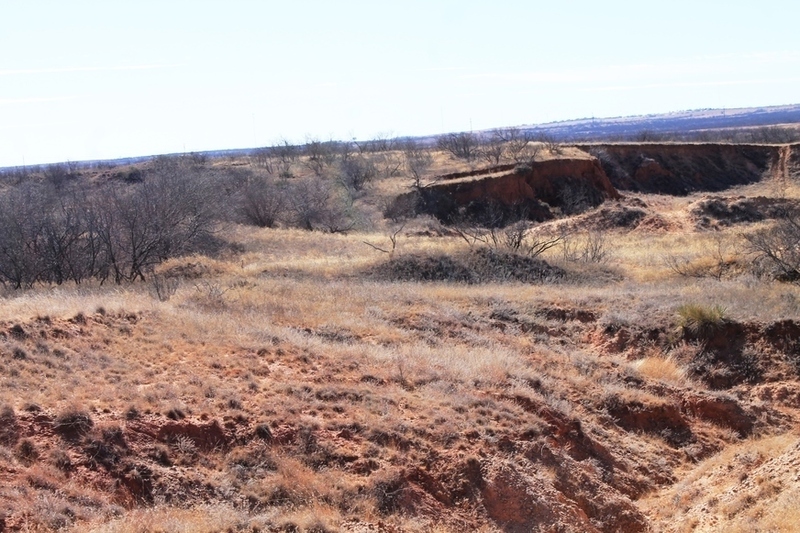 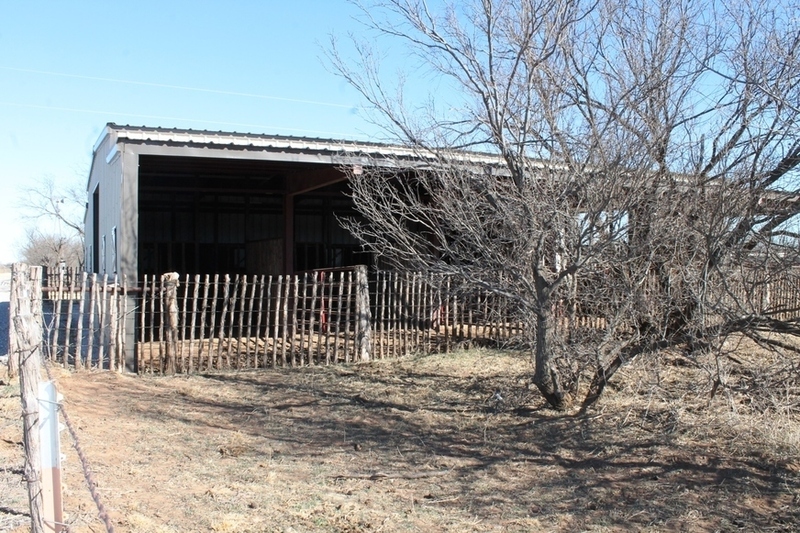 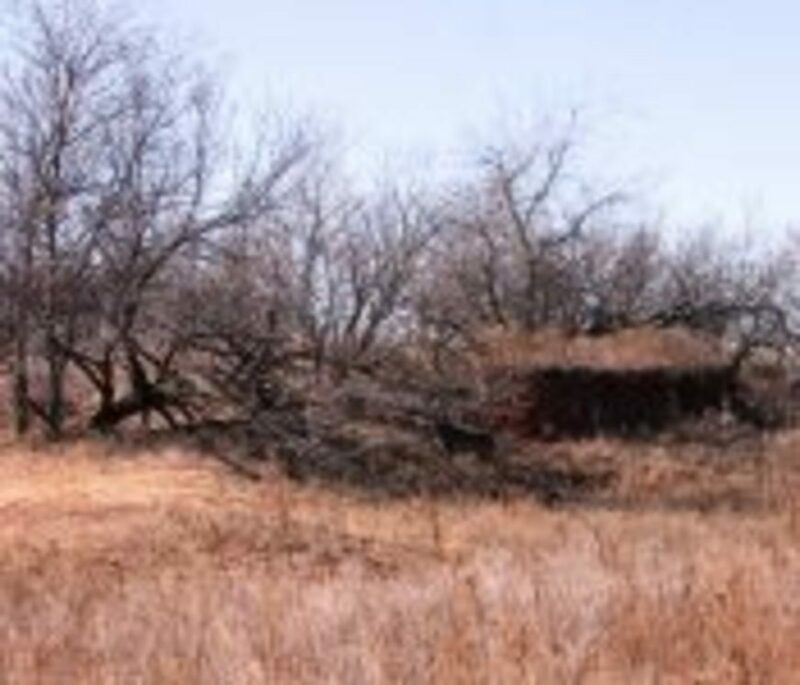 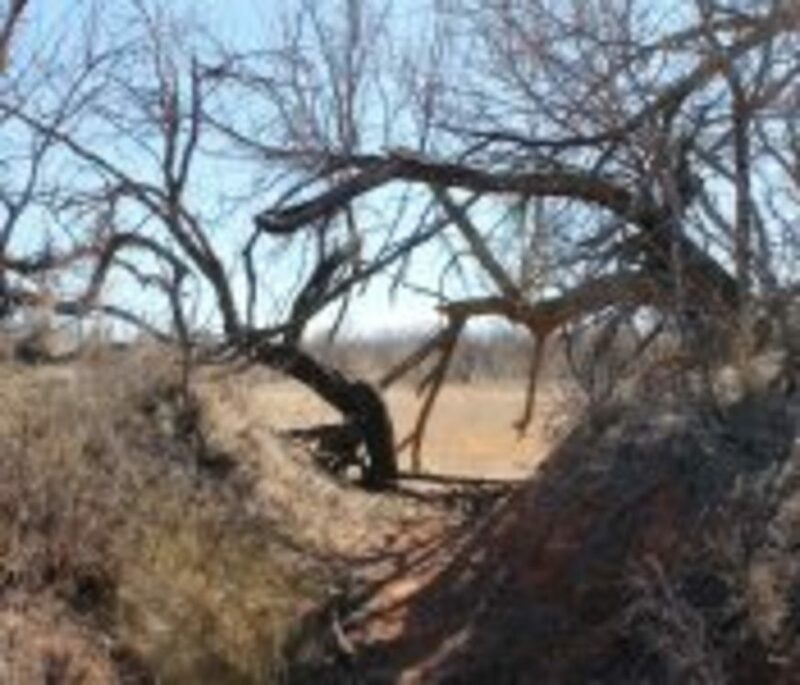 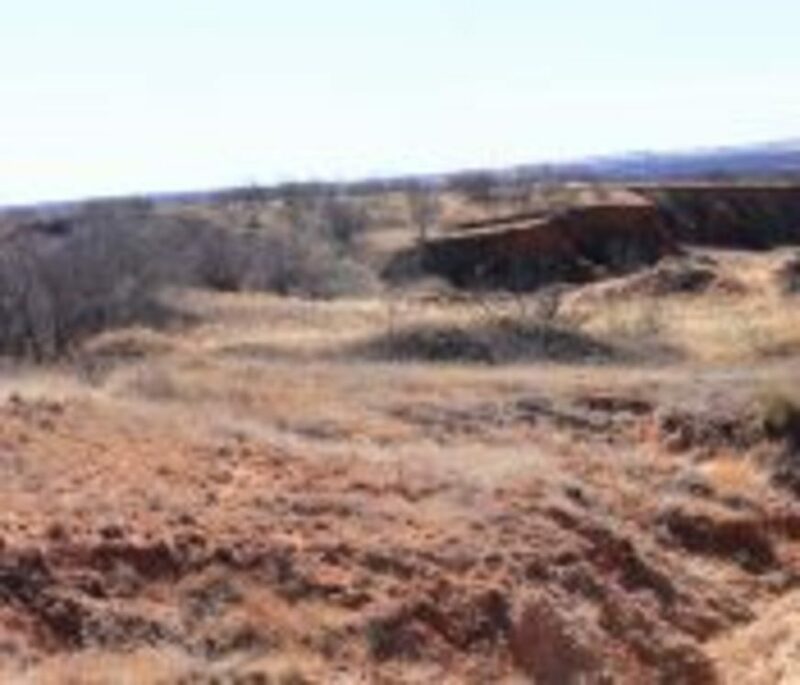 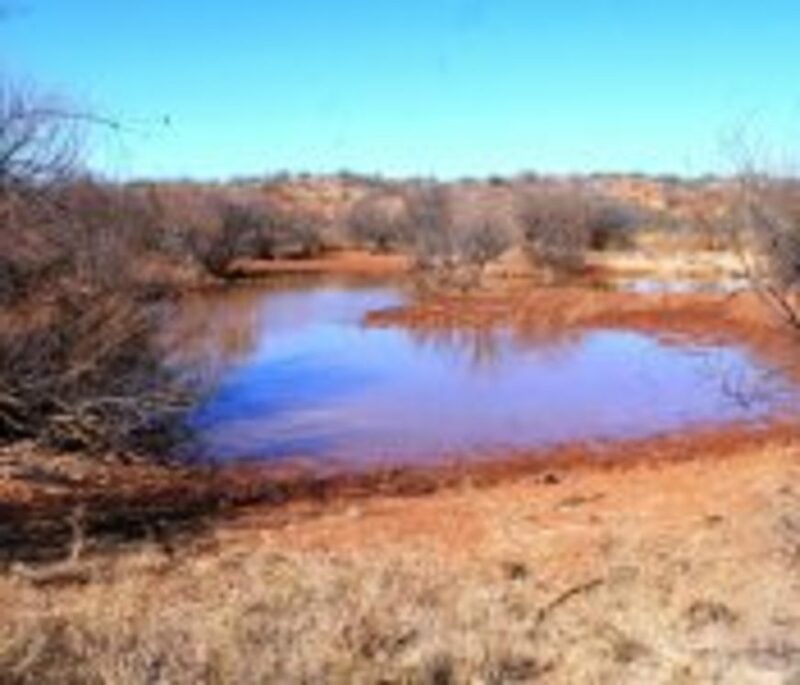 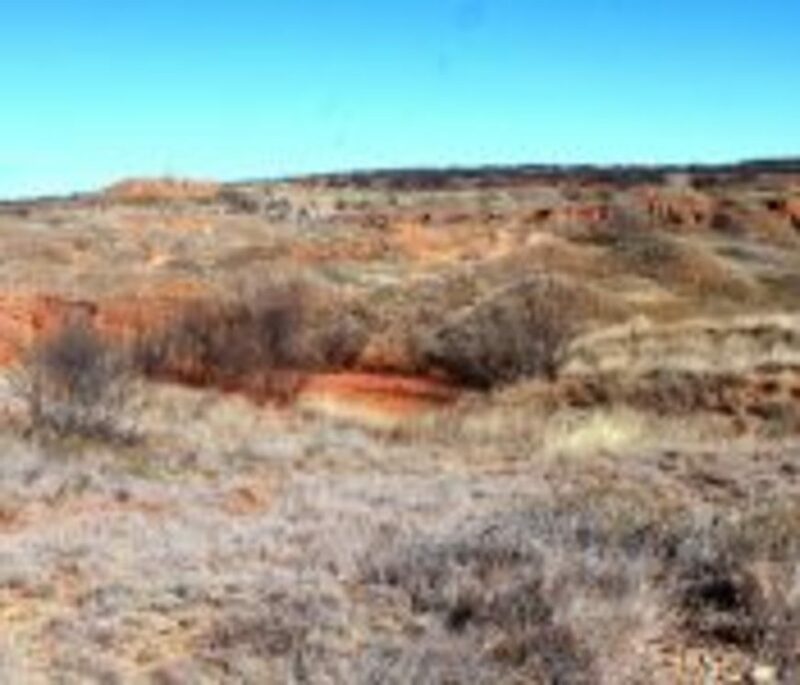 This unique property is just 5 miles north of Childress on Hwy 83. 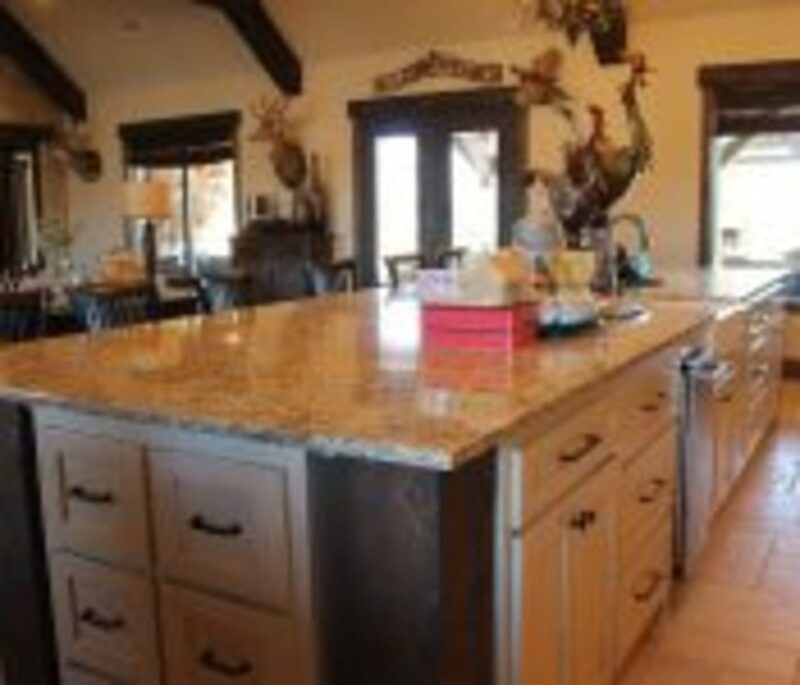 It has it all! 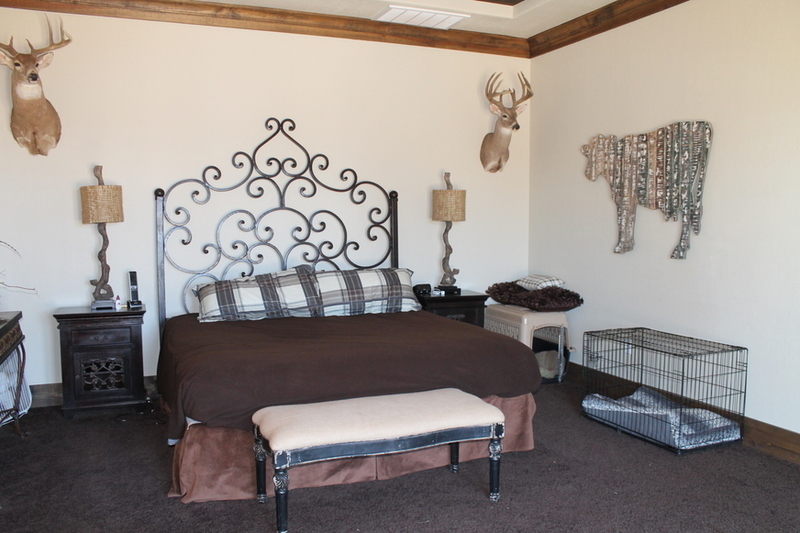 It’s a HUNTERS DREAM! 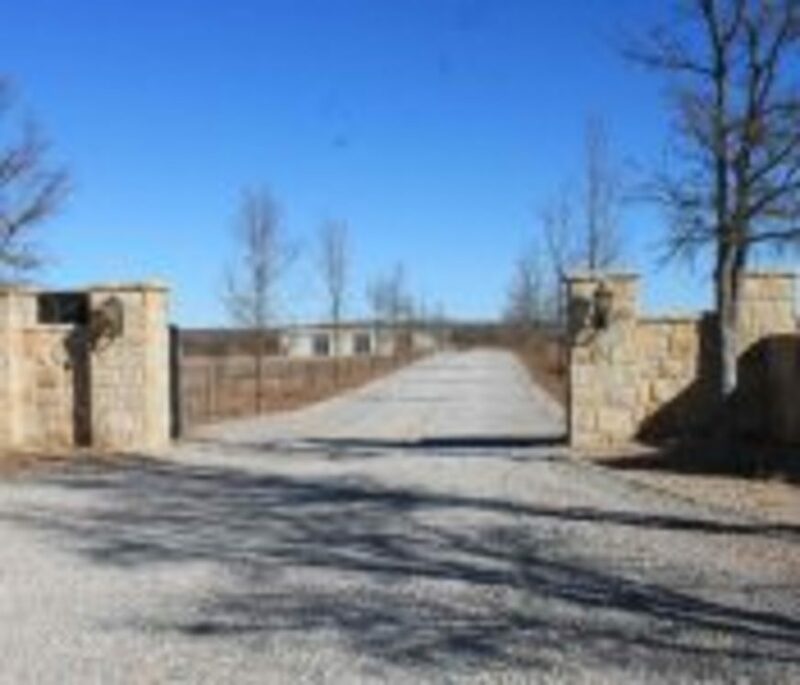 Access off Hwy 83 through a beautiful stone entryway lined with trees, comes complete with electronic gate. 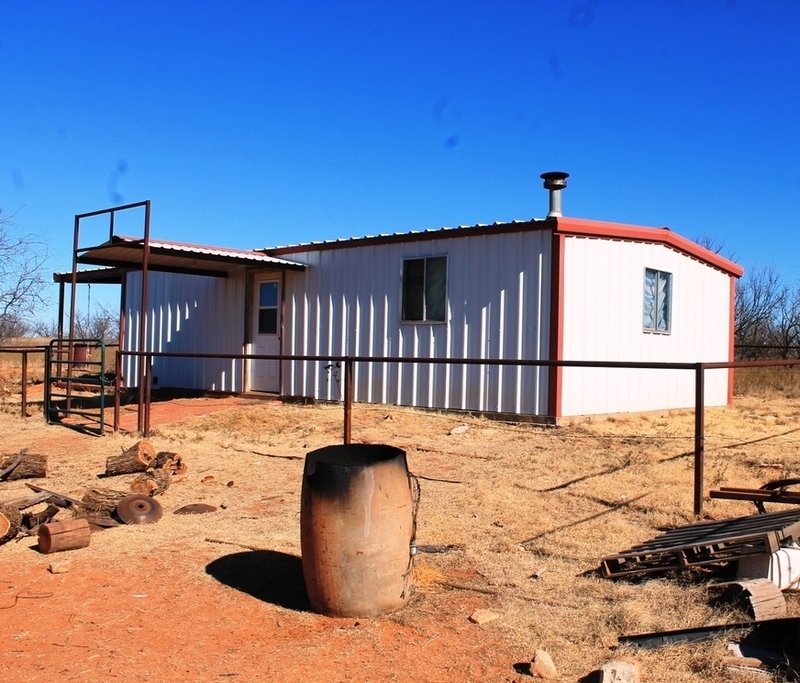 You drive past two metal shops and horse barn to the house. 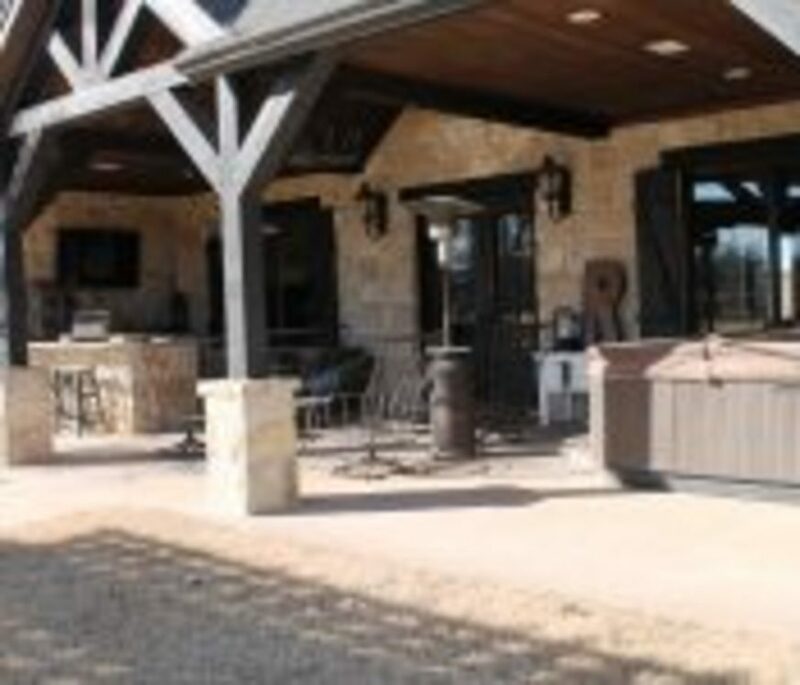 A security system is in place. 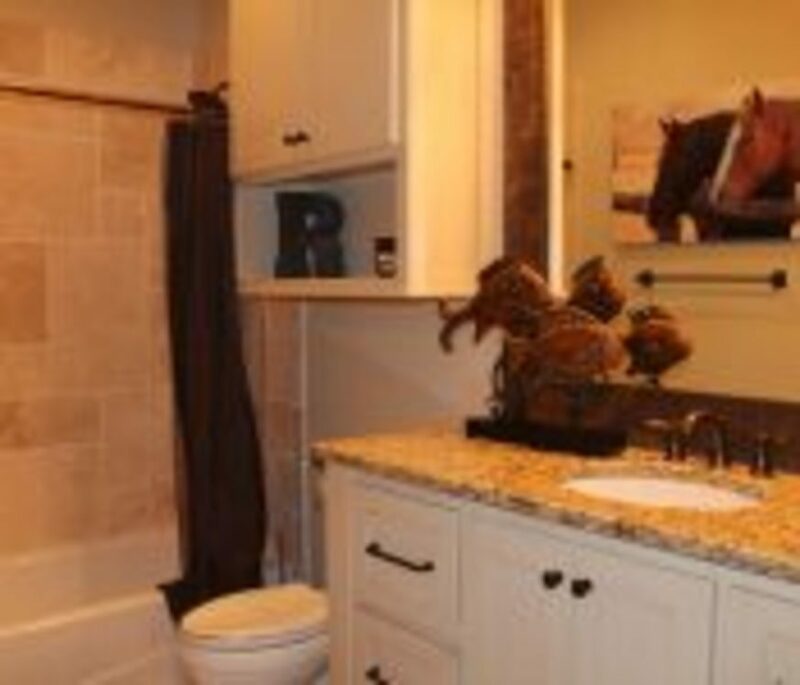 Amenities include a beautiful 3600 sq. 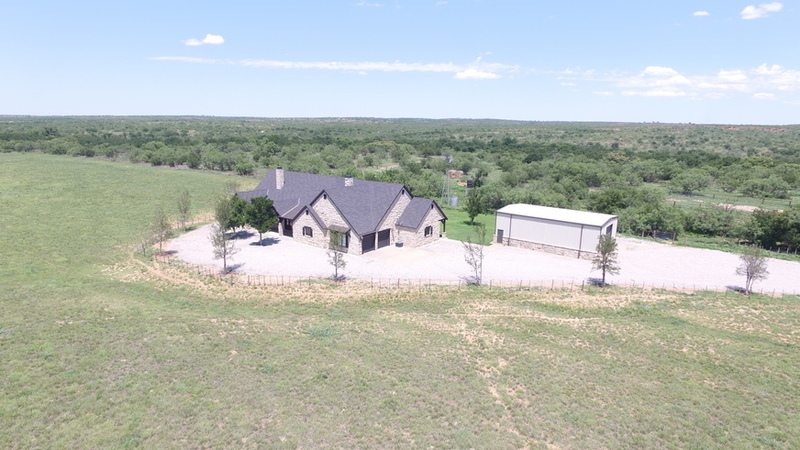 ft. custom built rock home, 1500 sq. 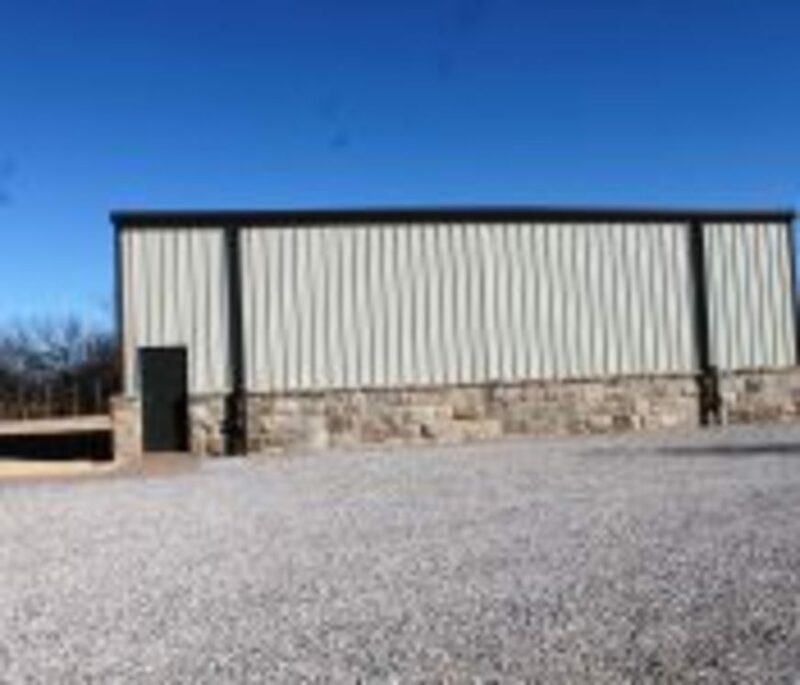 ft. shop, 3600 sq. 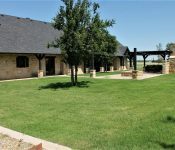 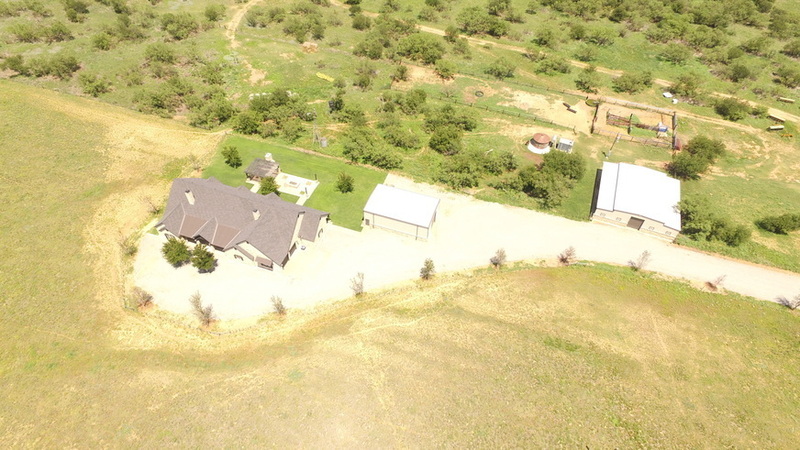 ft. horse barn, 7200 sq. 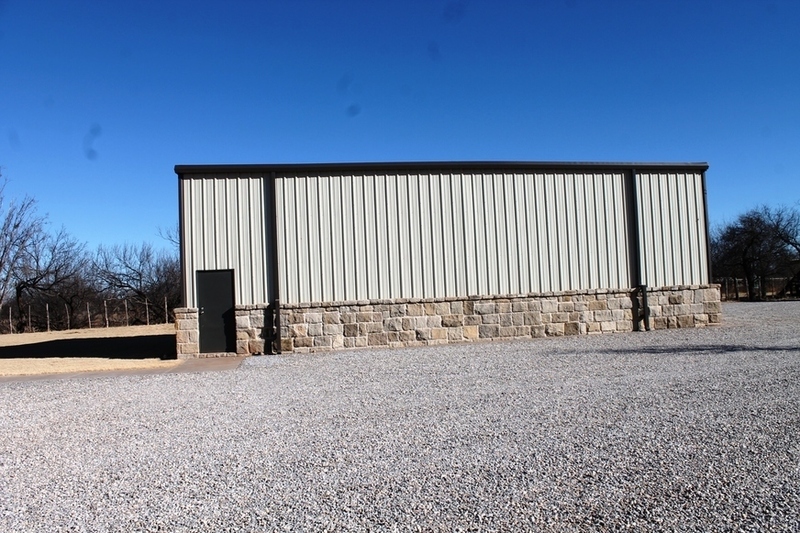 ft. main shop with storm shelter/bathroom, 740 sq. 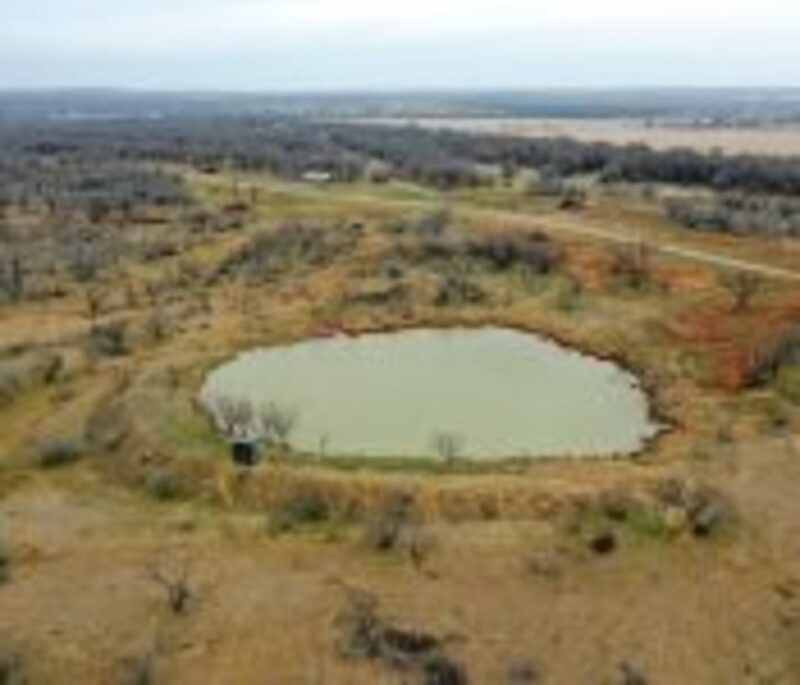 ft. hunters cabin, pond, and some of the BEST HUNTING you can find in North Texas. 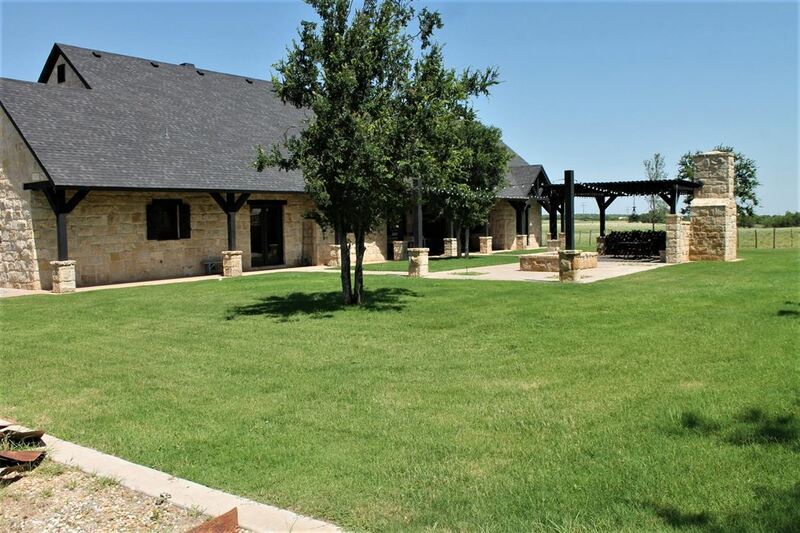 The 4 bedroom, 4 baths well-appointed home has a vaulted ceiling that provides a spacious open environment. 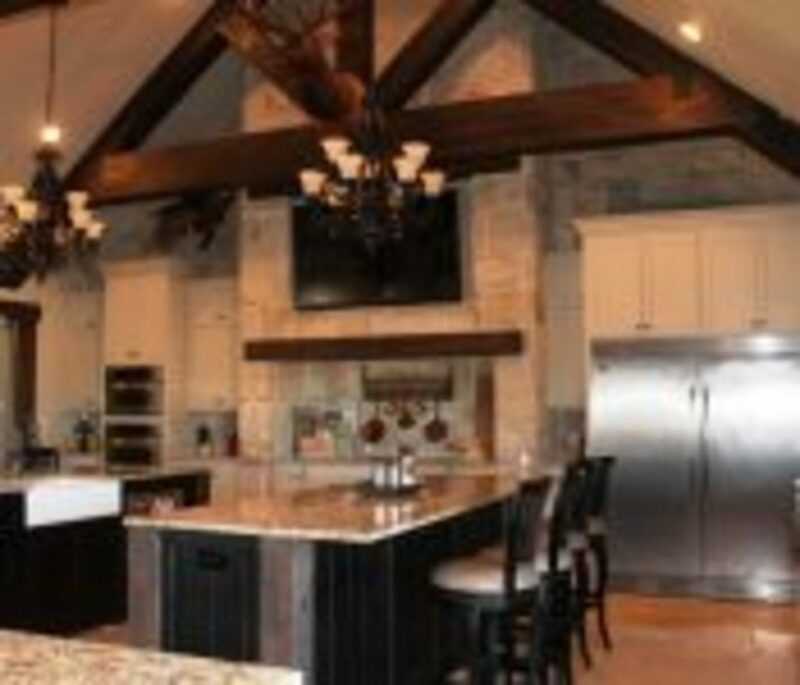 Ladies, the modern kitchen has beautiful cabinetry with granite counter tops, large stainless built-in refrigerator plus other built-in appliances including ice machine and wine cooler. 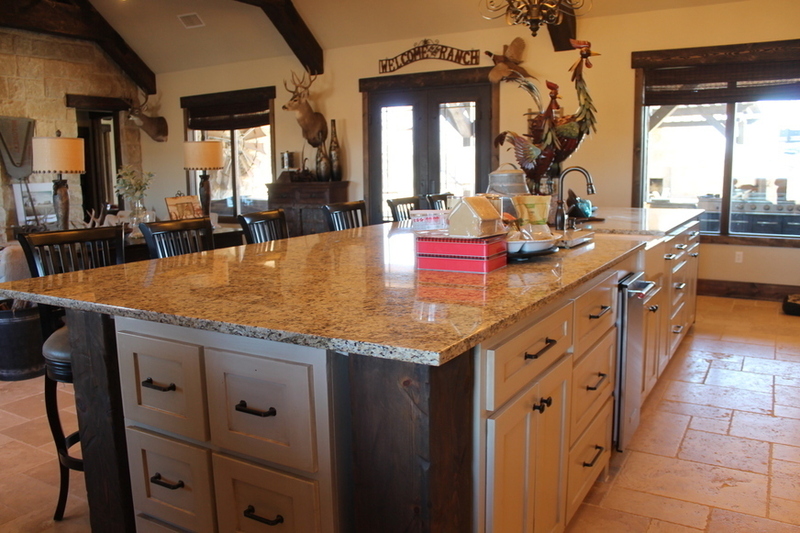 Two islands compliment the kitchen. 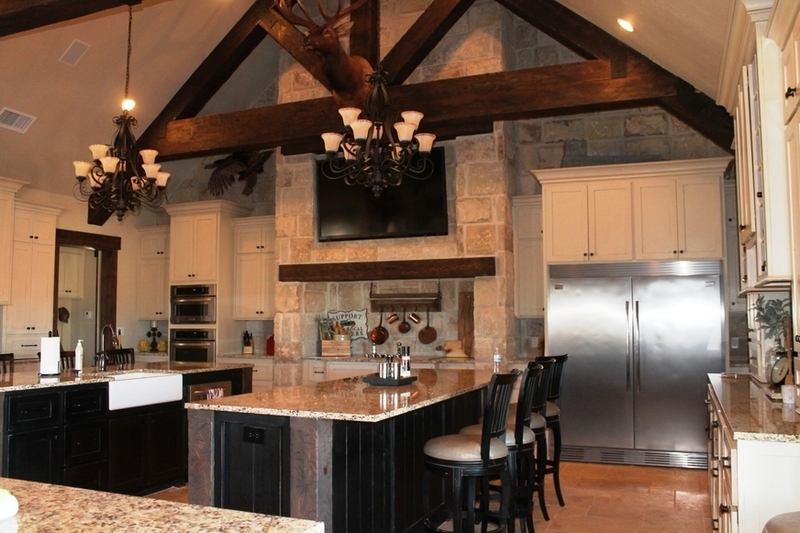 An oversized bar separates the kitchen from the living area. 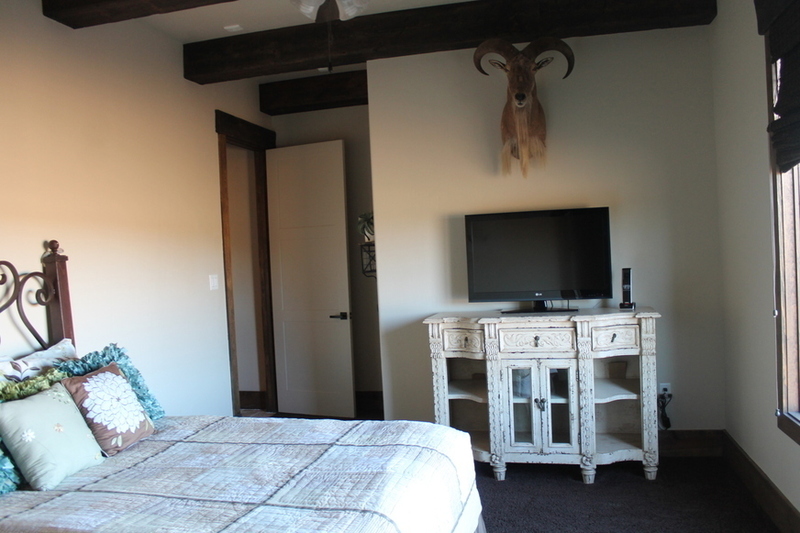 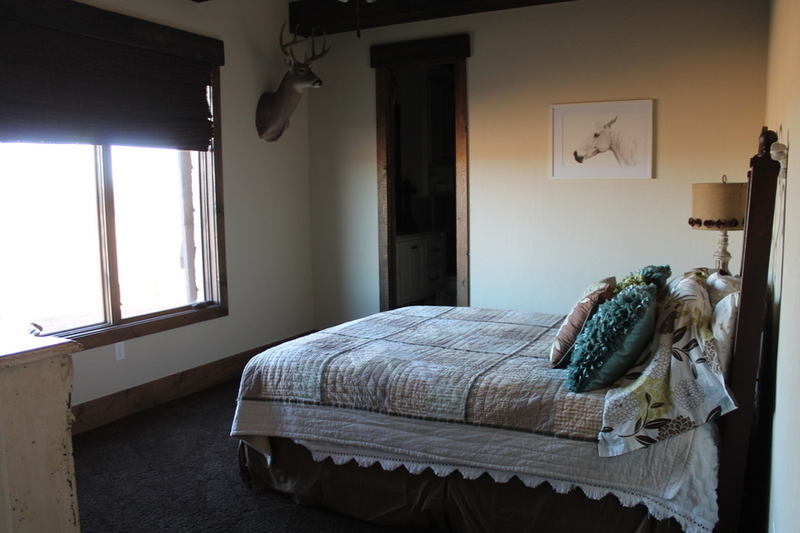 The master bedroom is spacious with double doors that open to the outdoors. 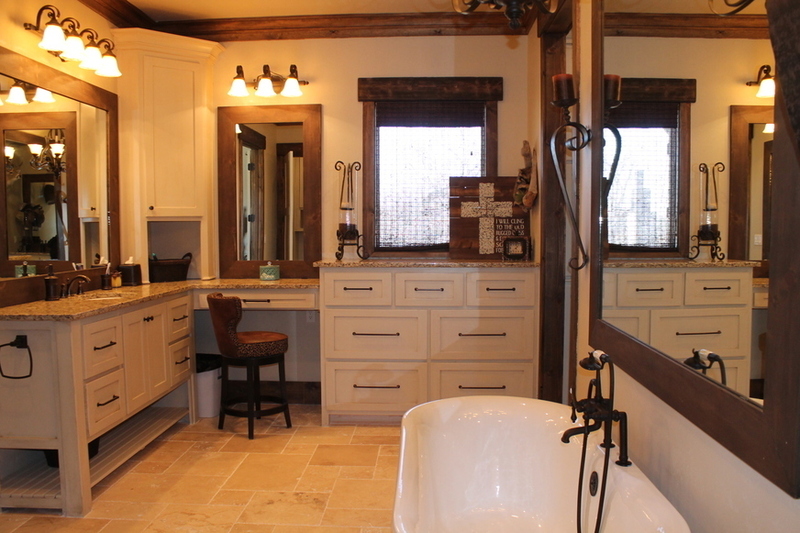 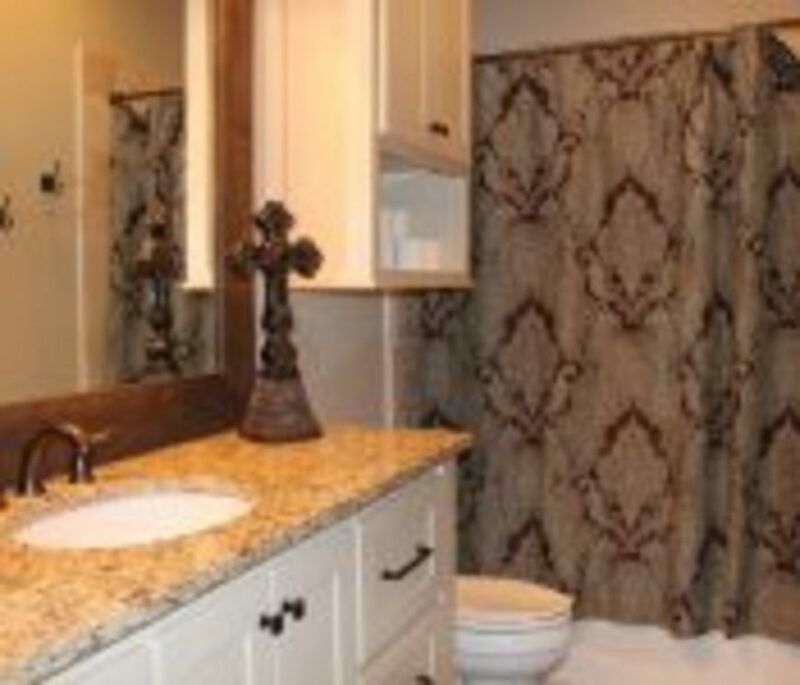 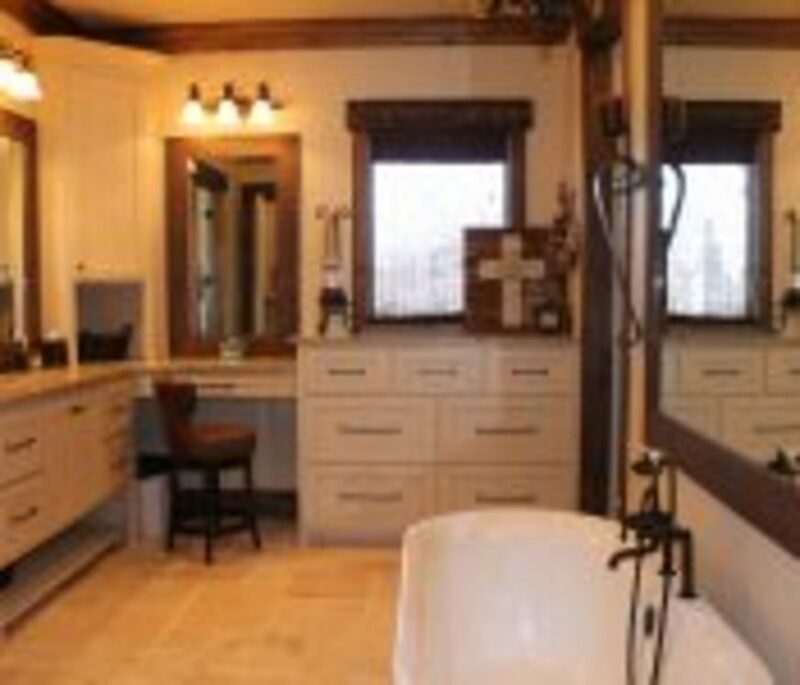 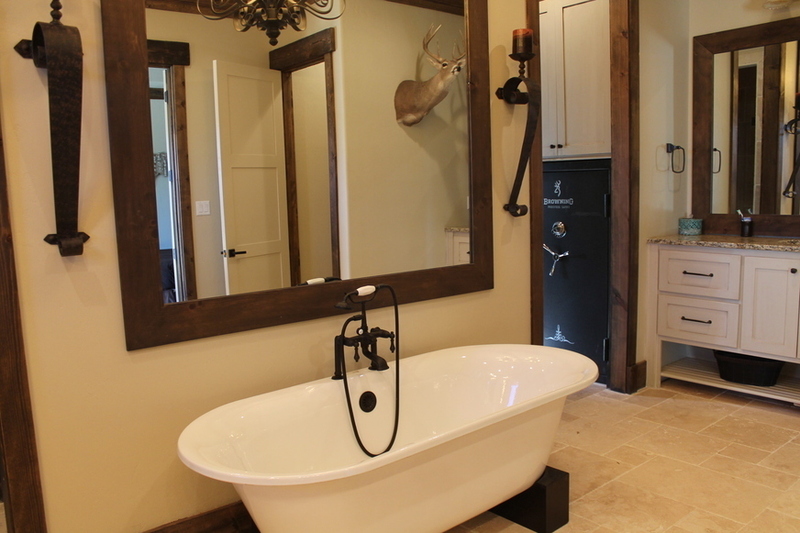 Its large master bath has a free-standing tub and his and her vanities. 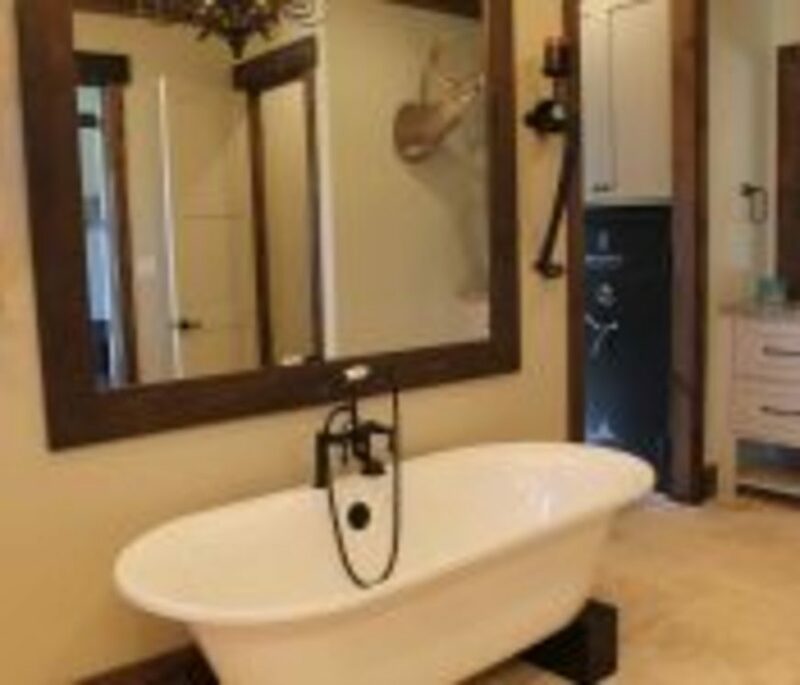 The double shower is very spacious. 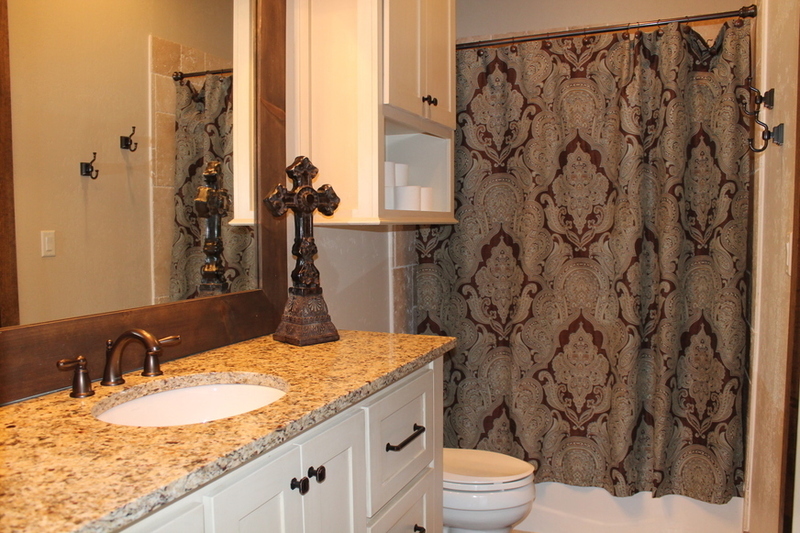 A walk thru closet wraps around for easy access from both sides of the bathroom. 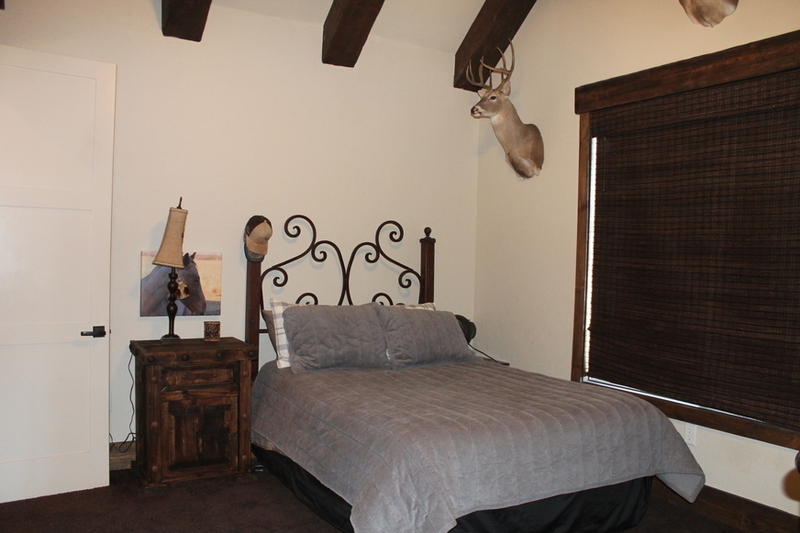 Each of the other 3 bedrooms has full baths. 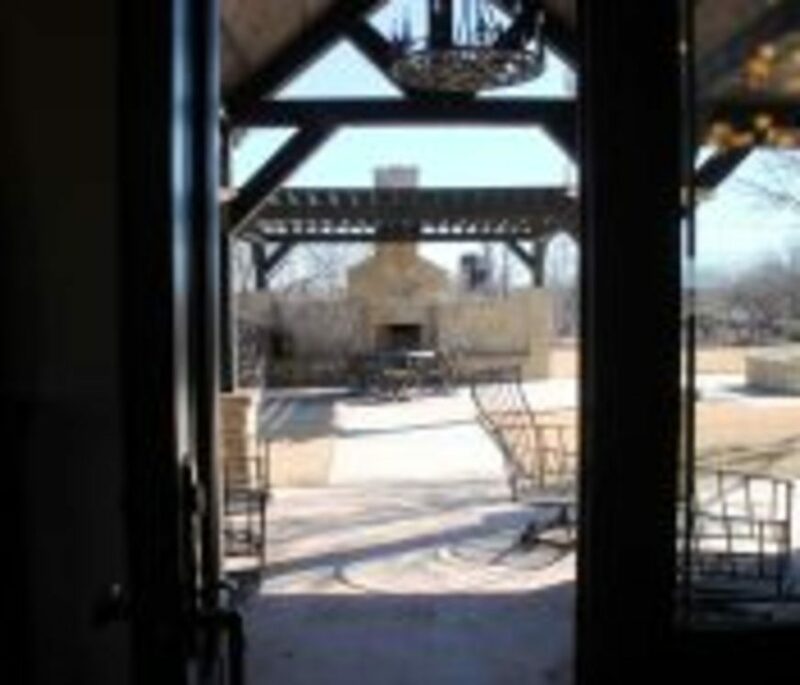 One bedroom off the porch area also has double doors. 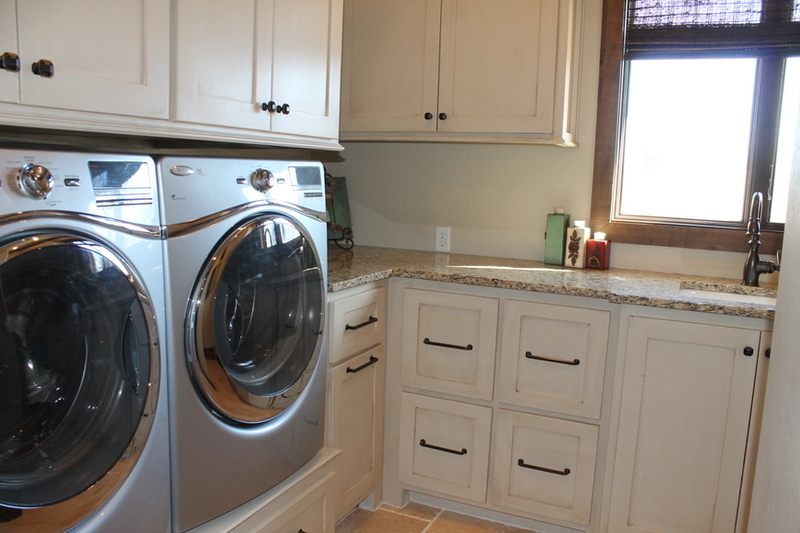 Near the master bedroom is the utility room with plenty of cabinets and countertop. 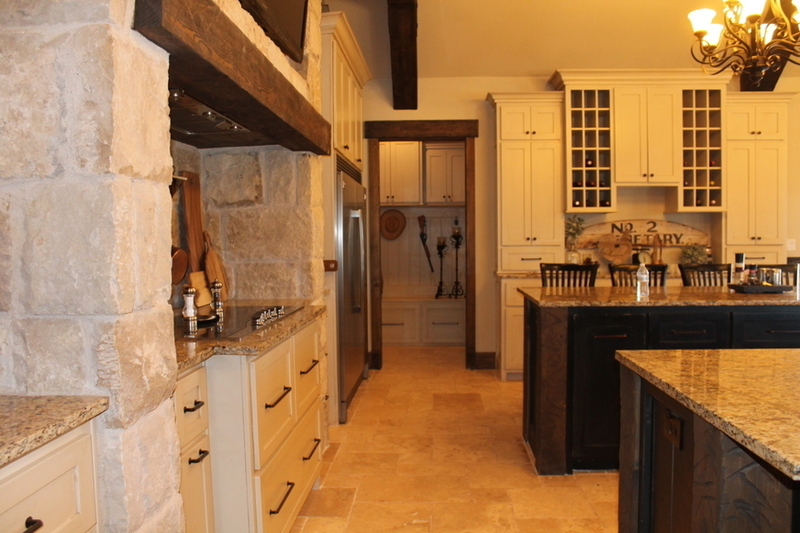 As you step in from the double car garage, you will find a mud room and then a pantry that is amazing. 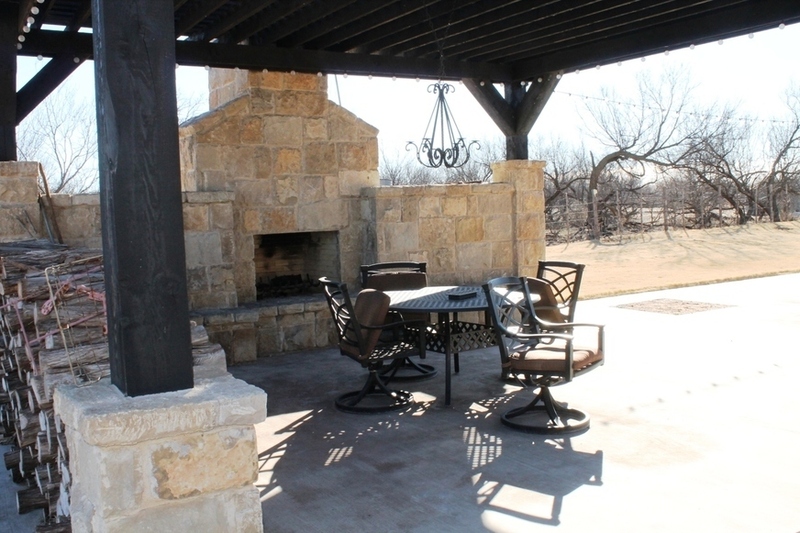 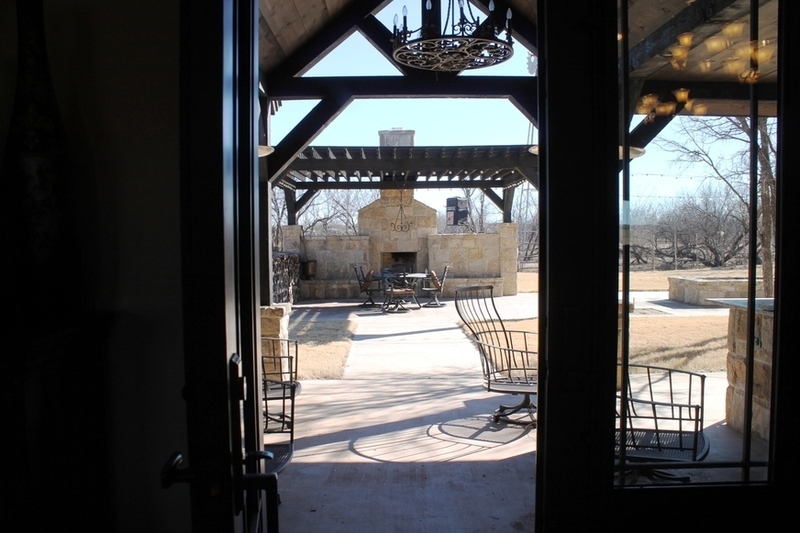 Entertain your guests at the outdoor kitchen, patio, hot tub, fire pit or the fireplace. 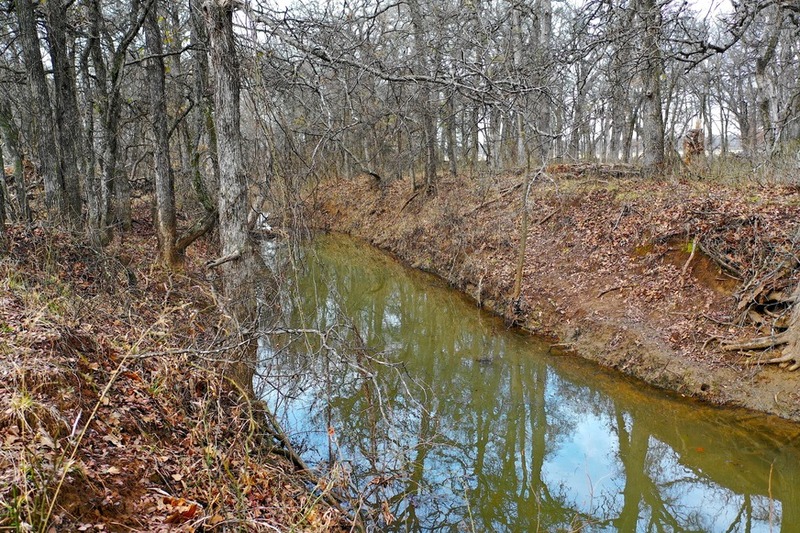 A seasonal creek runs just behind the house also lined with trees. 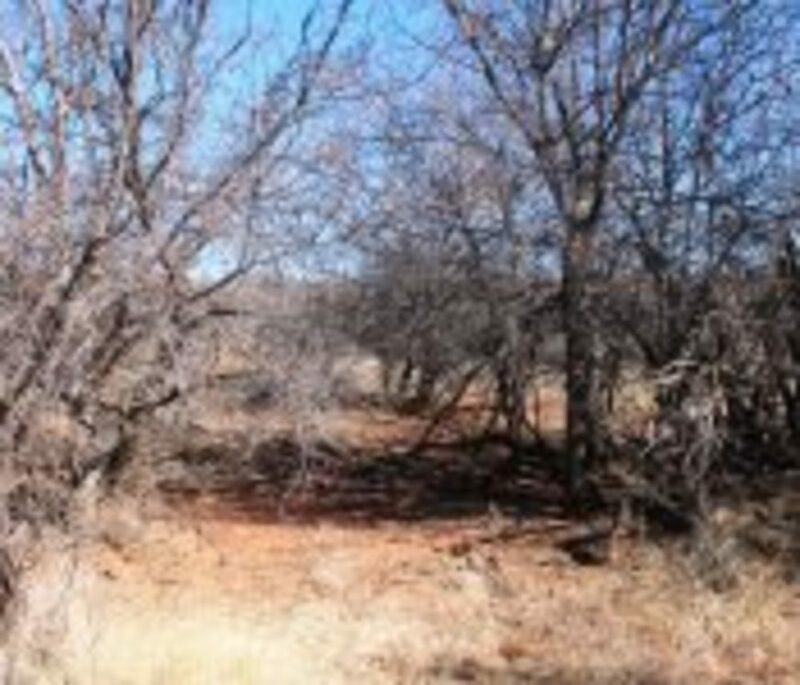 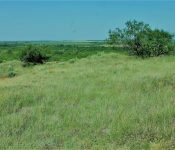 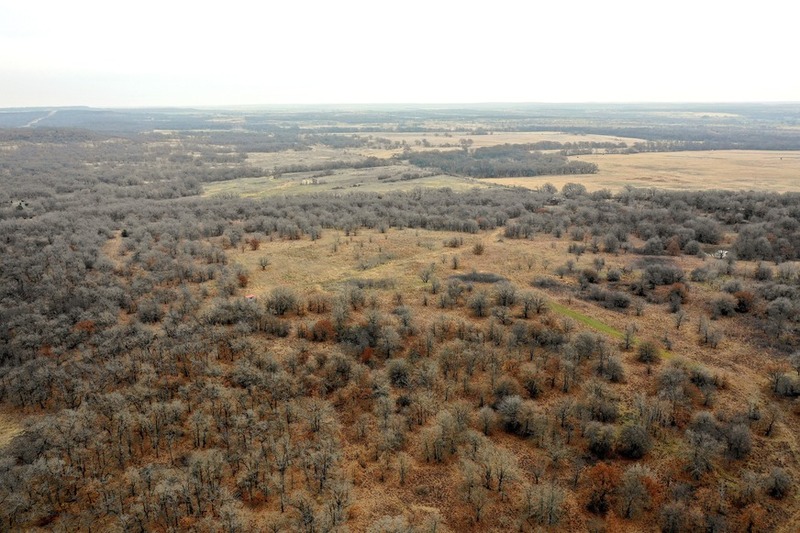 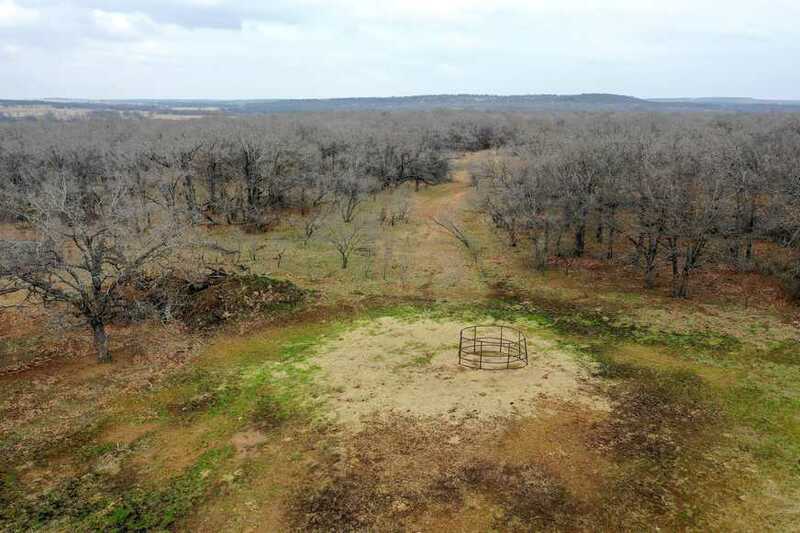 To make this property even more appealing is whitetail deer, turkey, dove, hogs, quail, and other wildlife abound. 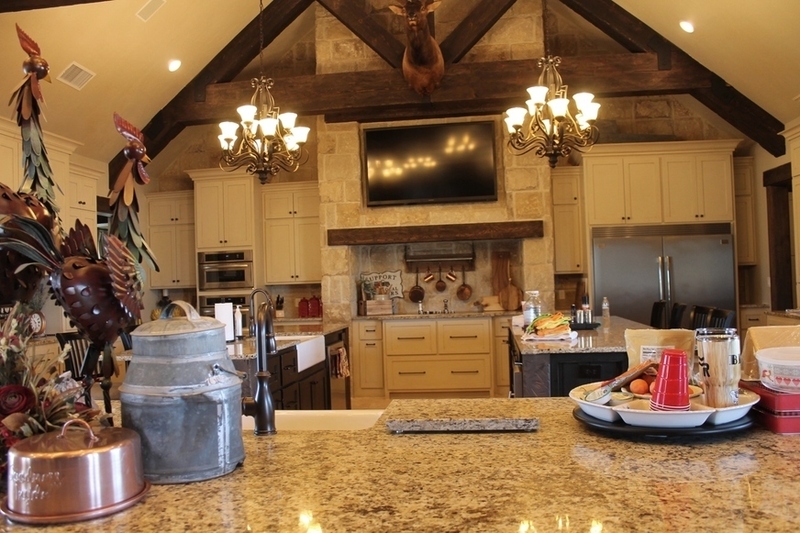 This ranch is hunted lightly, only by family members. 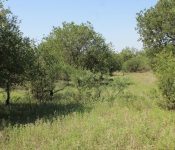 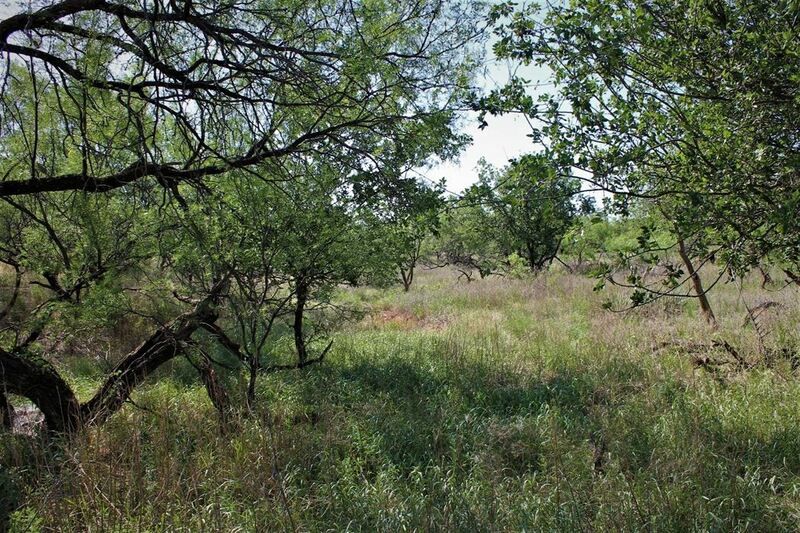 1459 (more or less) acres are native pasture supporting mesquite, soapberry, hackberry, cedar, and blue brush. 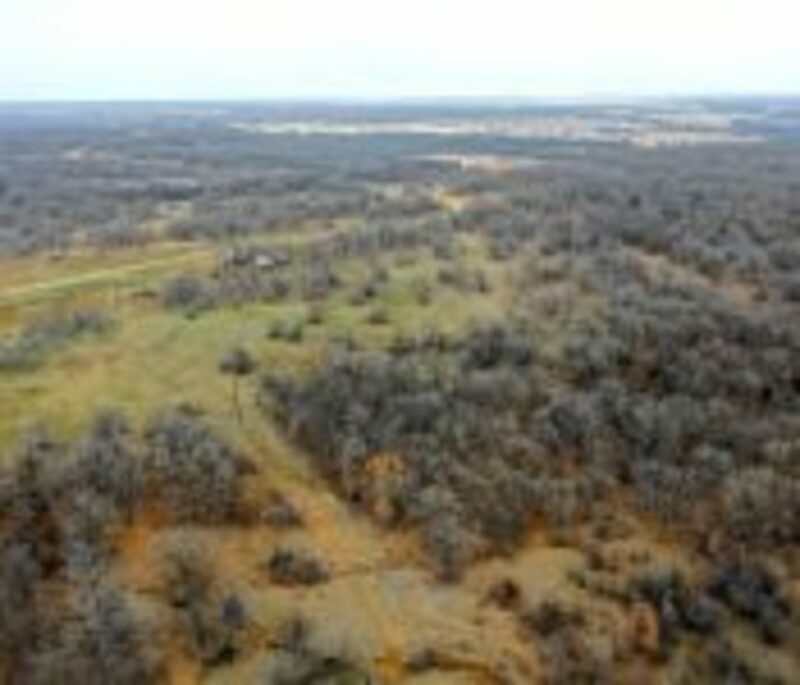 Approximately 31 acres of cropland is currently planted in wheat. 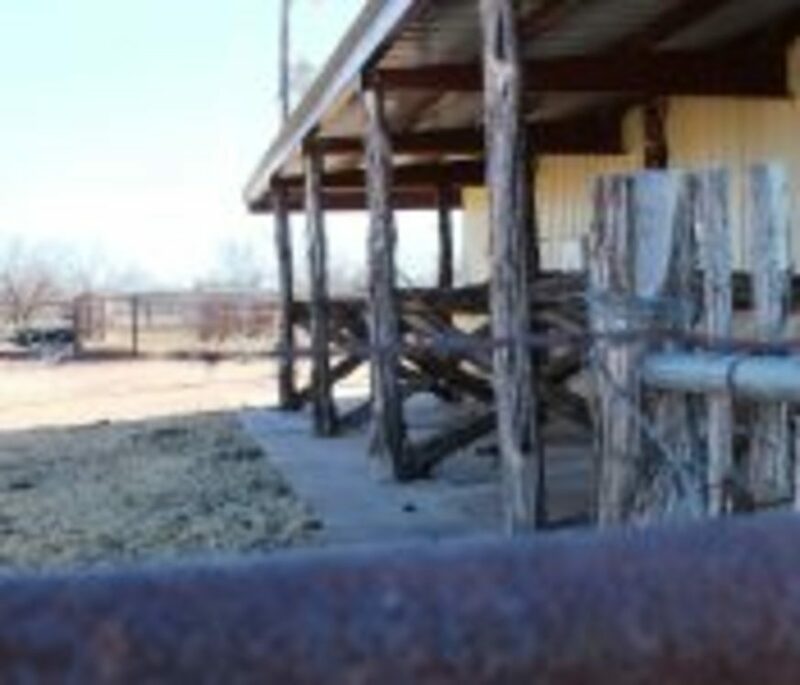 There are 2 sets of corrals. 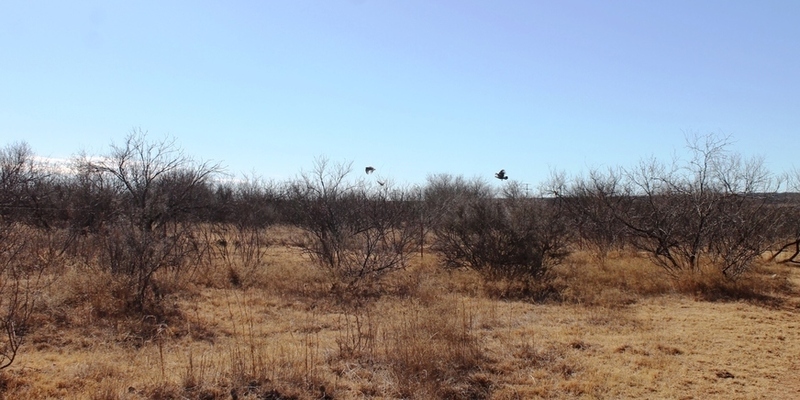 42 acres of a native mix of grasses lay along the highway at the front of the property. 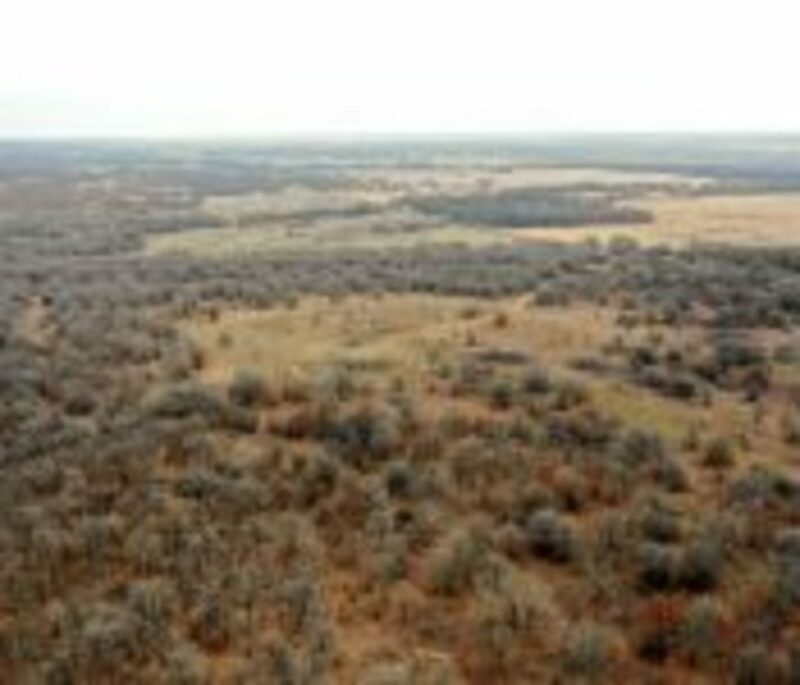 Topography is sloping to rolling hills. 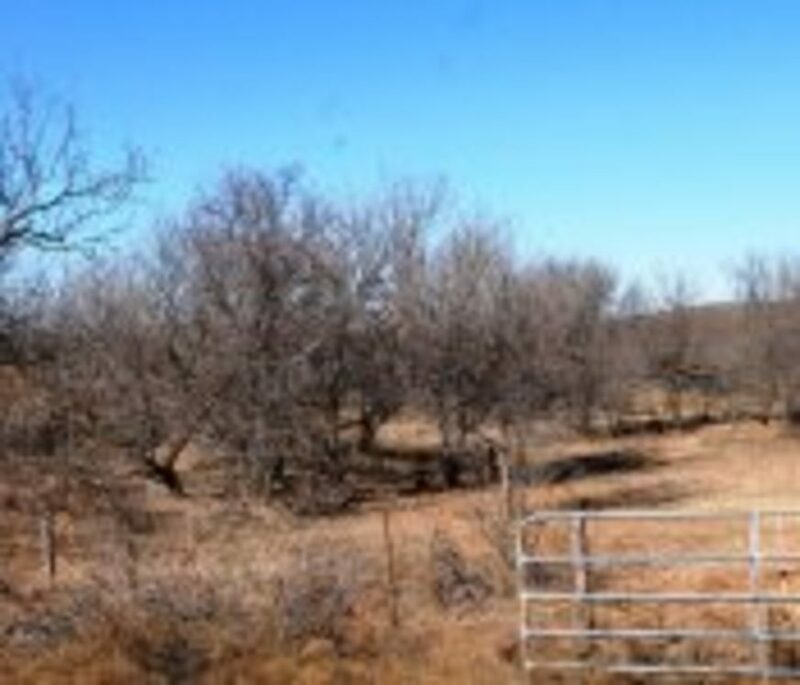 Every pasture has either well water, rural water, or both with excellent fencing. 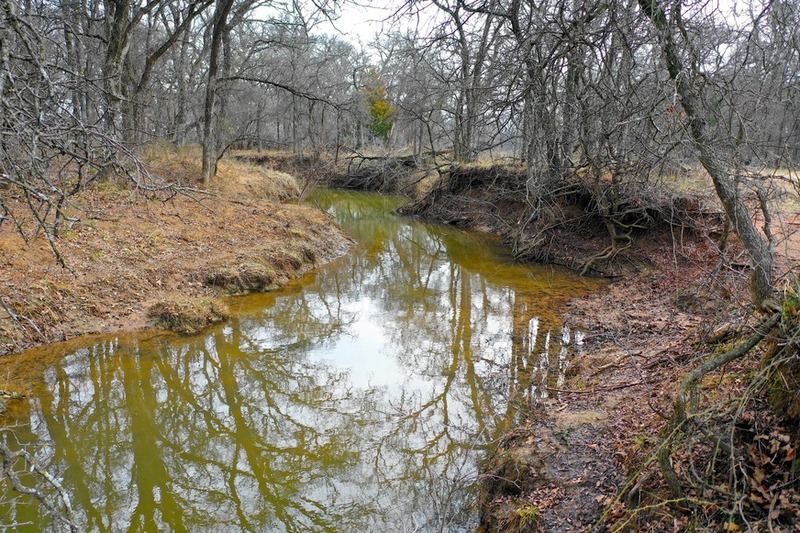 Trees, draws, and wet weather creeks make for good wildlife cover. 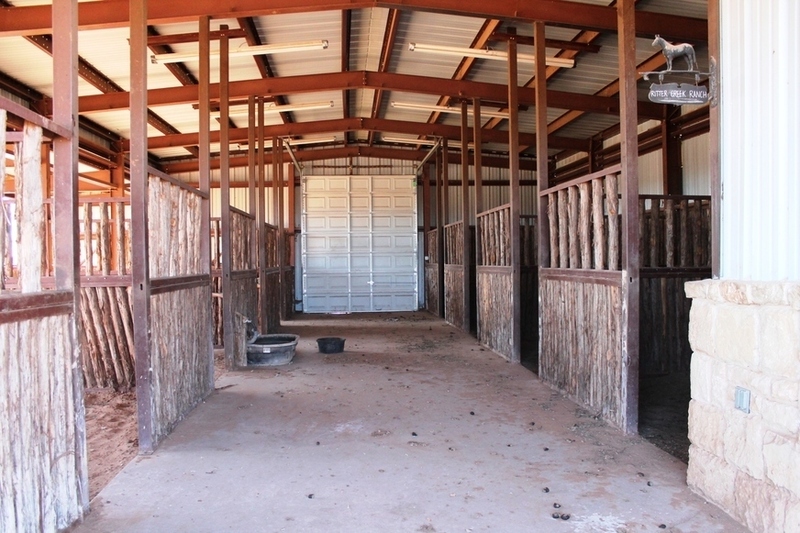 Other improvements include a horse barn consisting of 9 stalls with tack room. 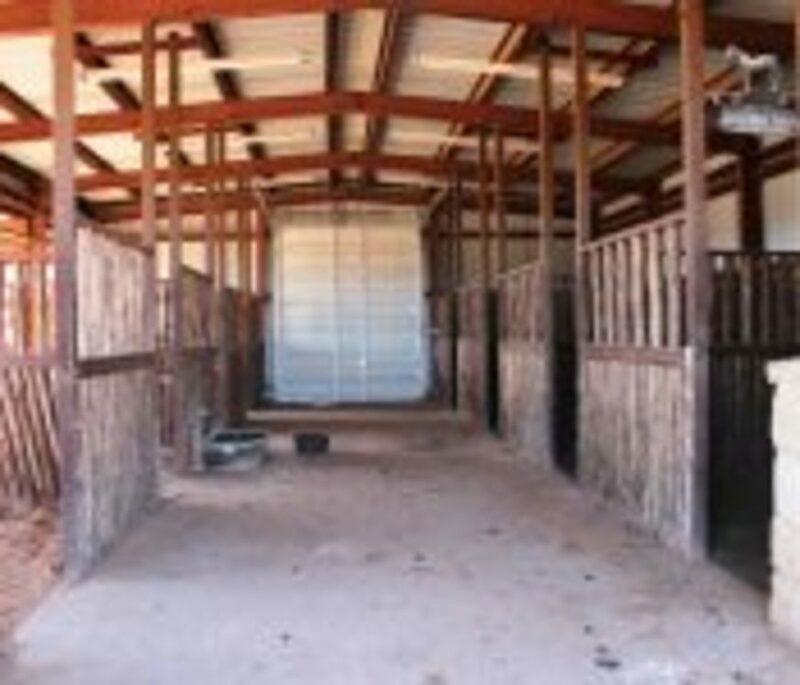 5 stalls on the south side have runs. 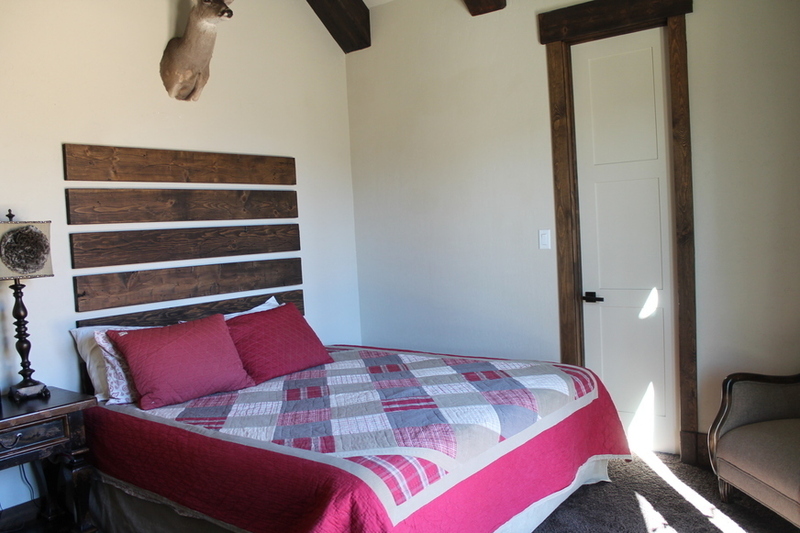 All are made with metal and cedar posts. 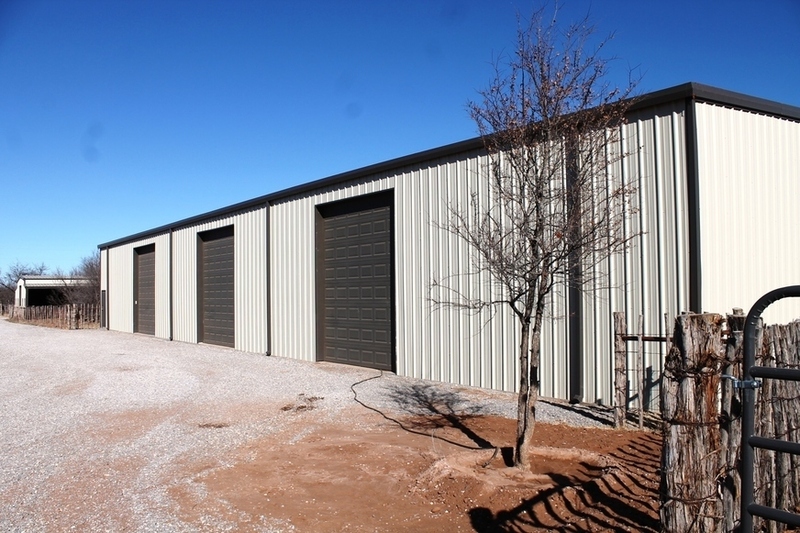 Three large electric doors open into the 7200 sq. 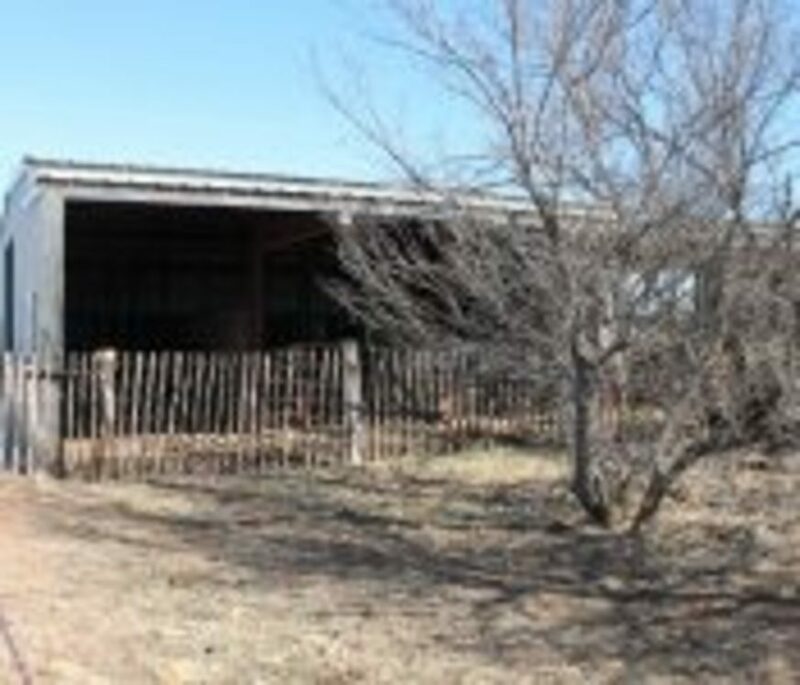 ft. shop on the west, with one large door on the east. 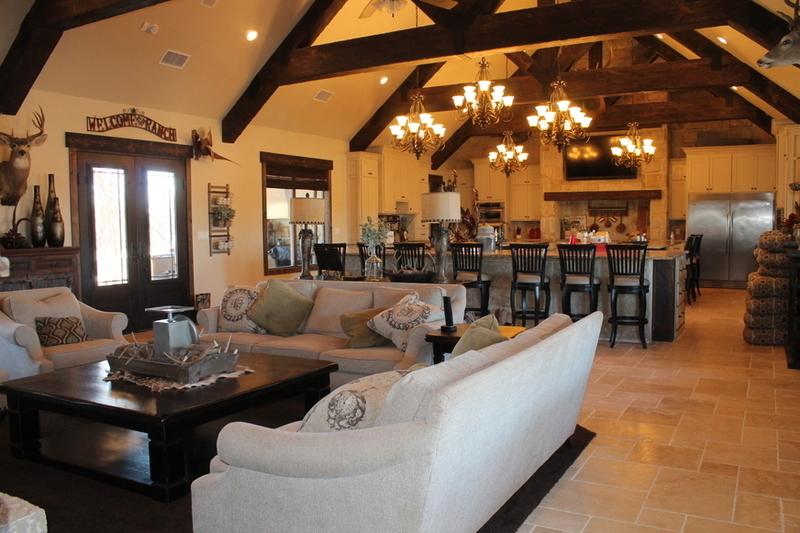 The 1500 sq. 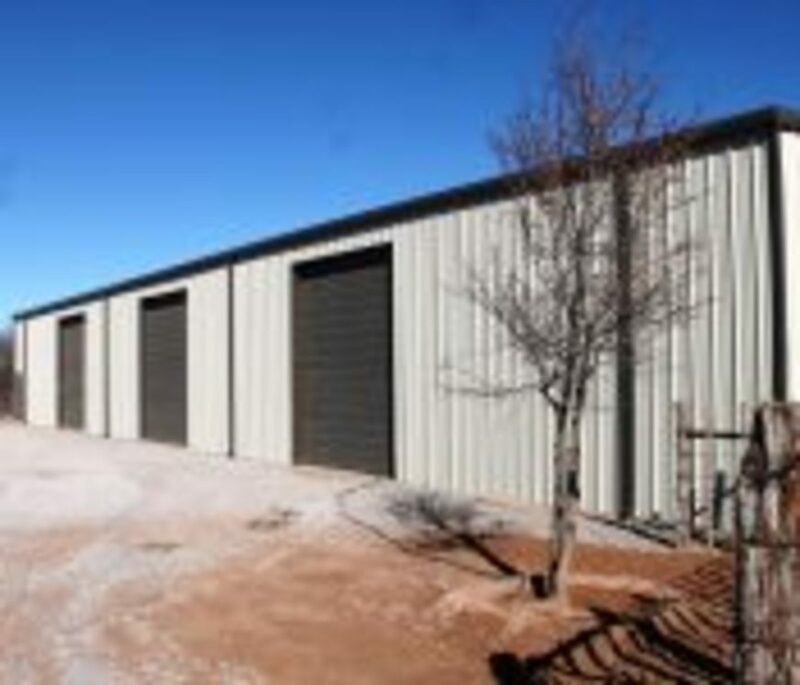 ft. shop is great for all your other needs, including ATVs or other vehicles. 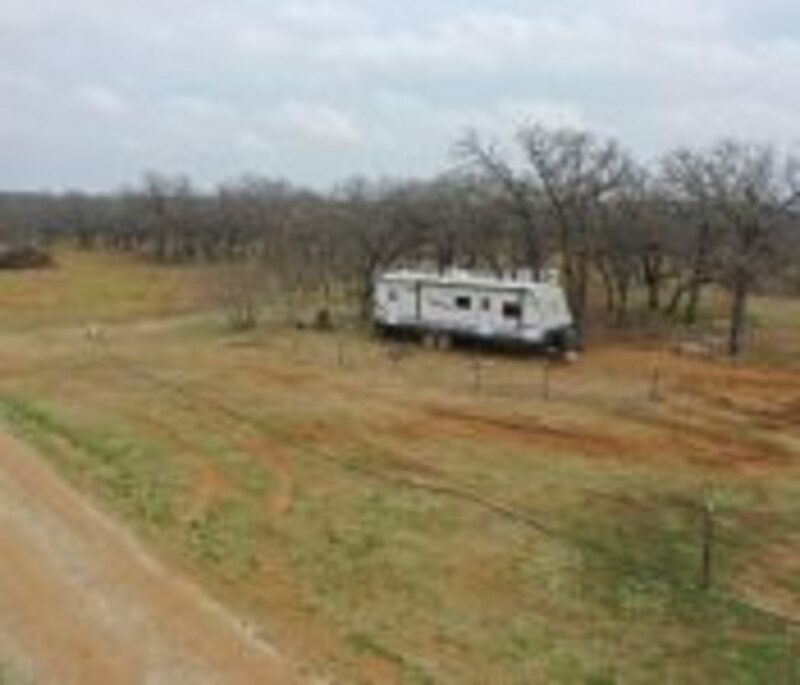 Sitting near the far, east boundary line is a metal hunters cabin has open kitchen and living area plus bedroom that have new carpet and tile. 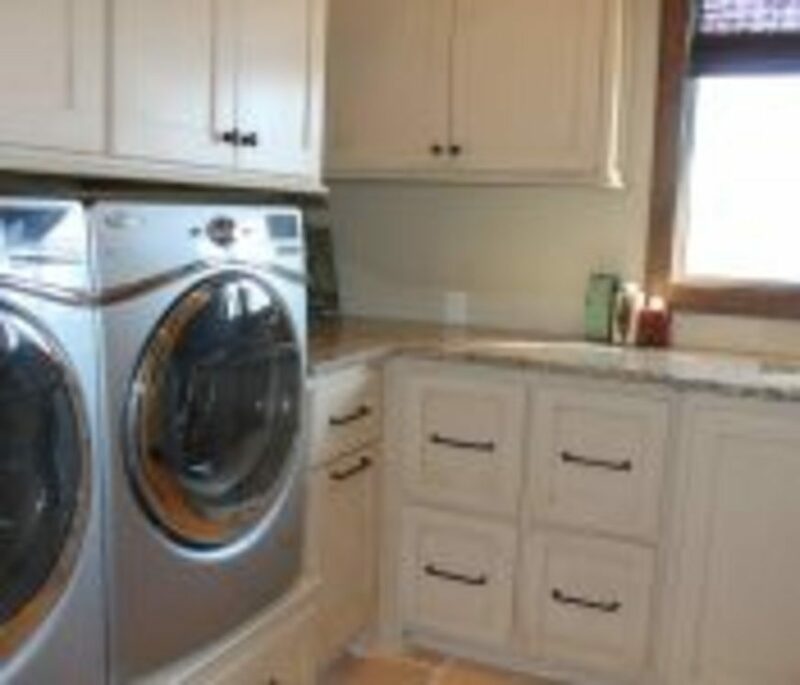 Also there is a bath with washer dryer hookups. 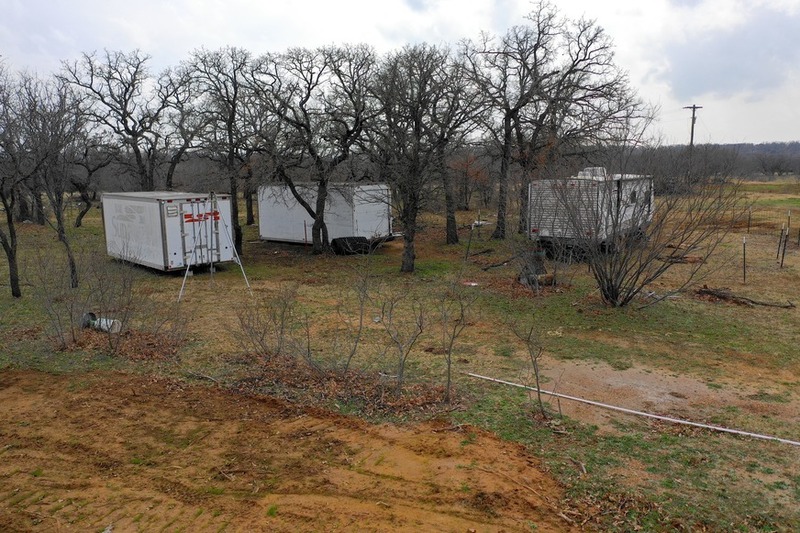 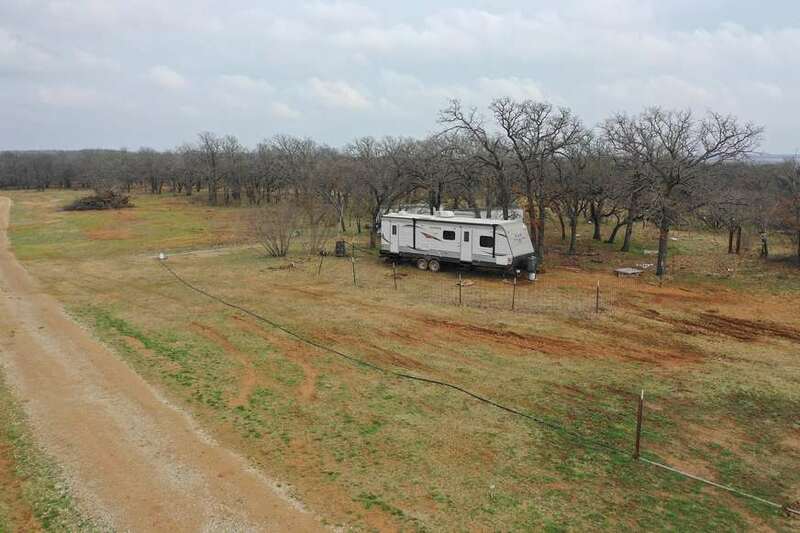 On top of that, off Hwy 83 are 5 RV spaces each with individual electrical, water and septic hookups. 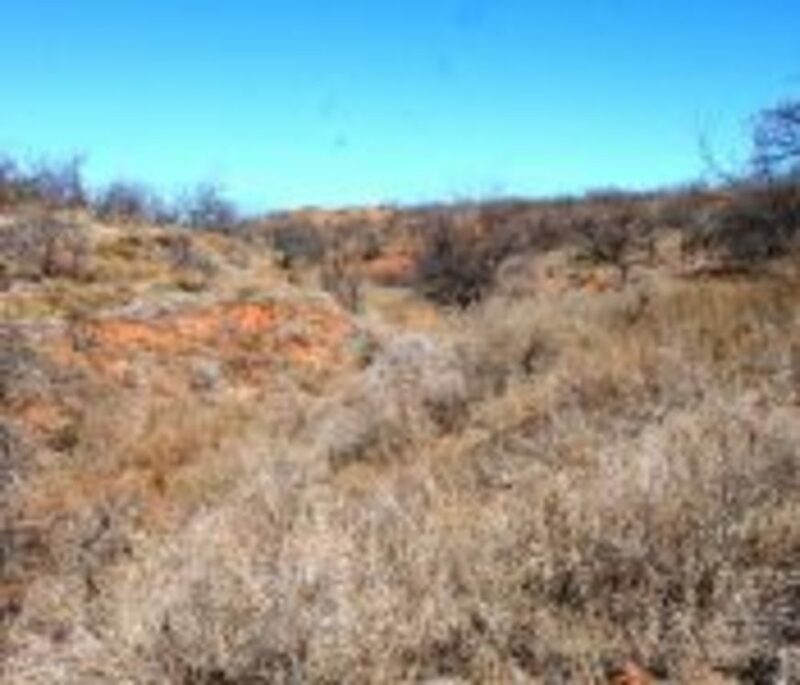 All areas of the property are accessible by atv and most by truck. 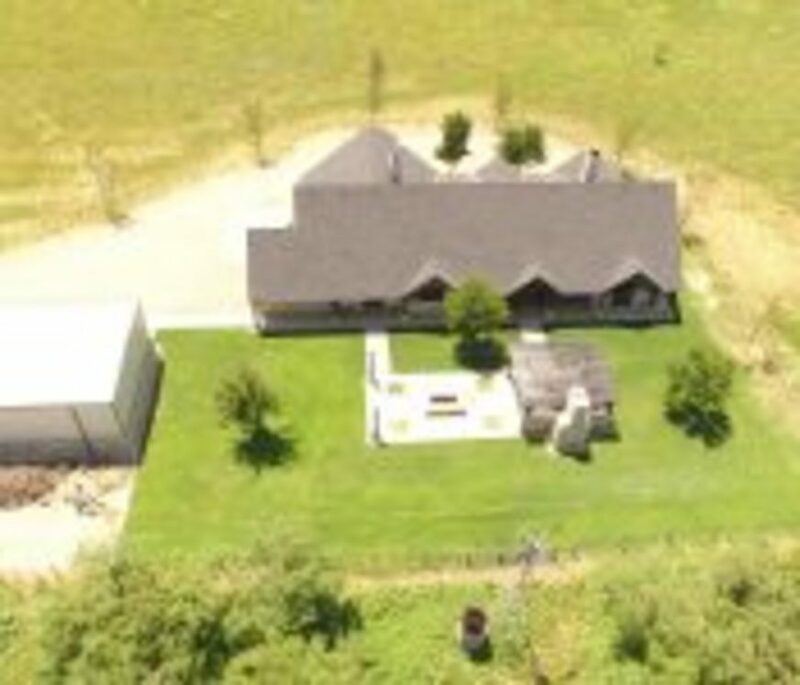 The owner has spared no expense of making this a truly unique property. 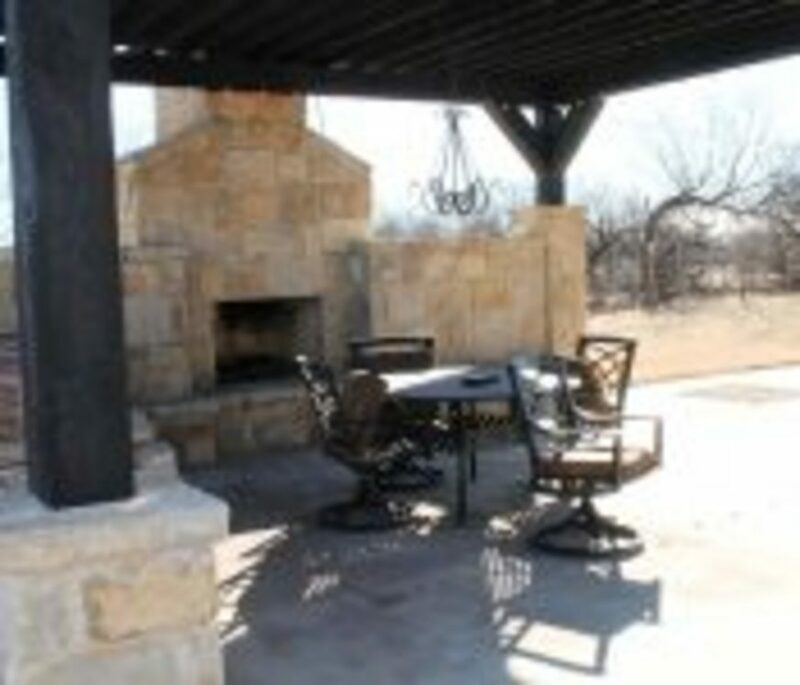 So run cattle, hunt, explore, fish, entertain, or just relax. 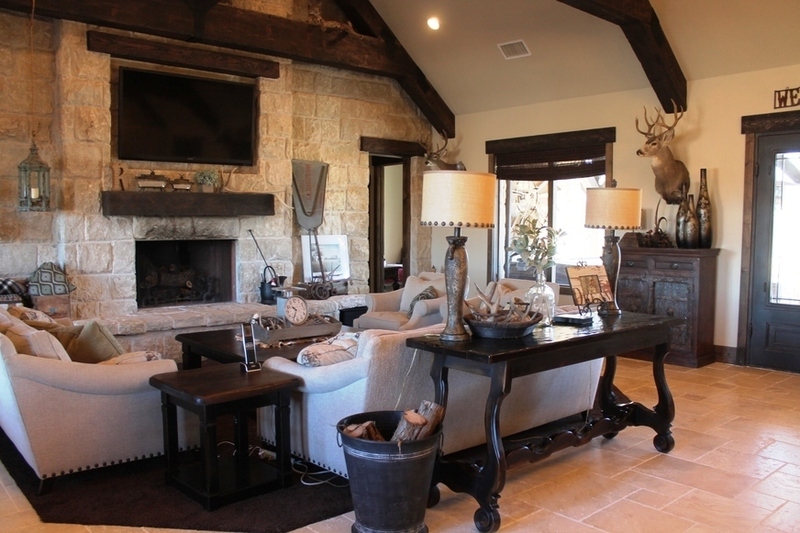 It’s living at its finest indoors and out! 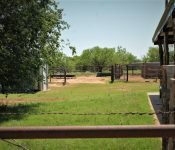 This entry was posted in Featured - Top, Ranches on February 15, 2018 . 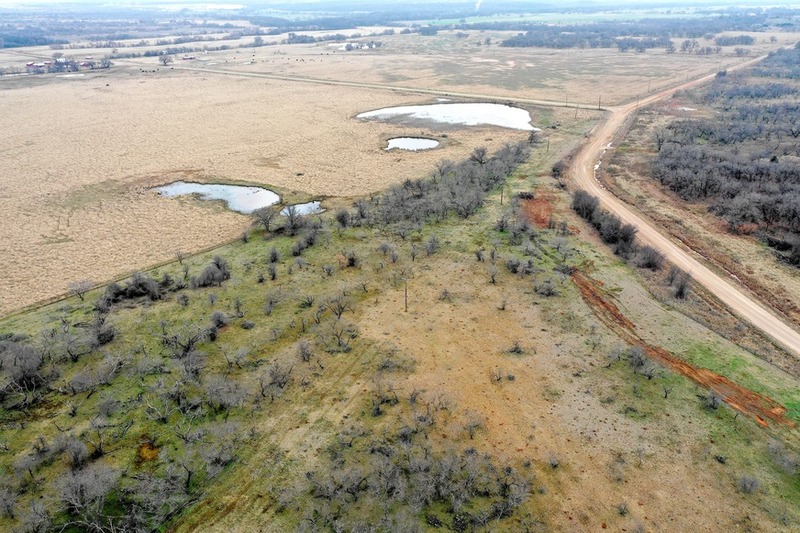 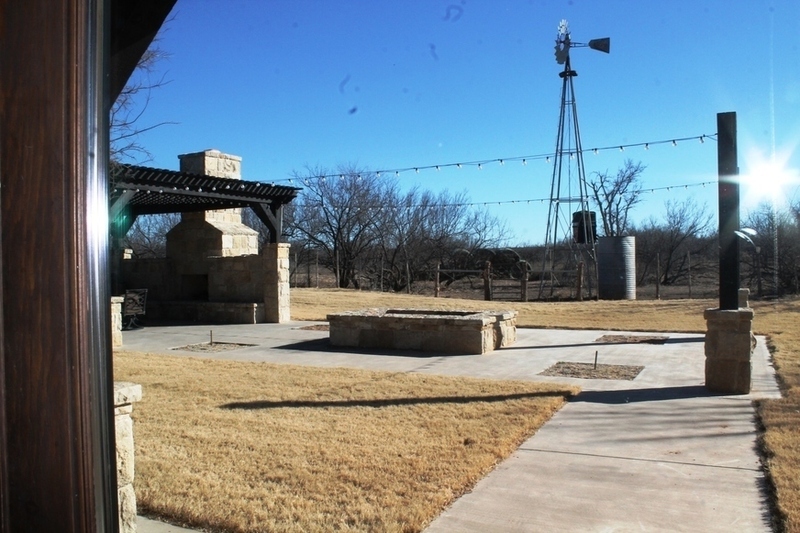 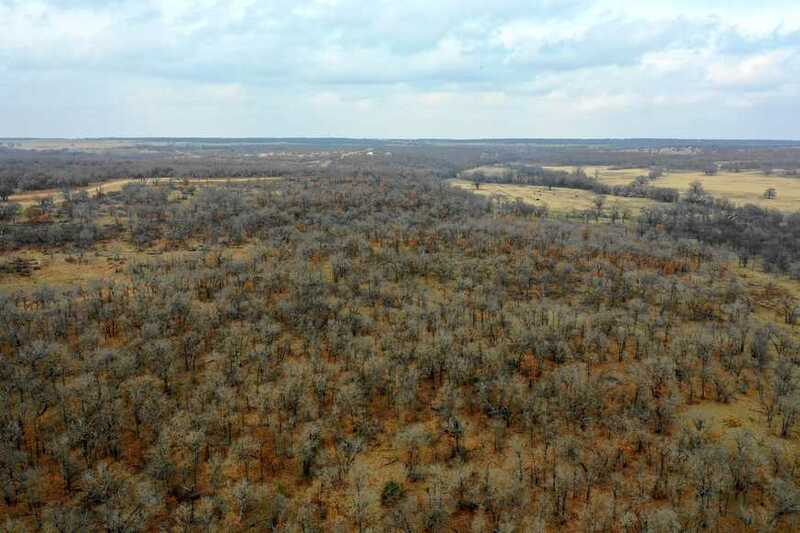 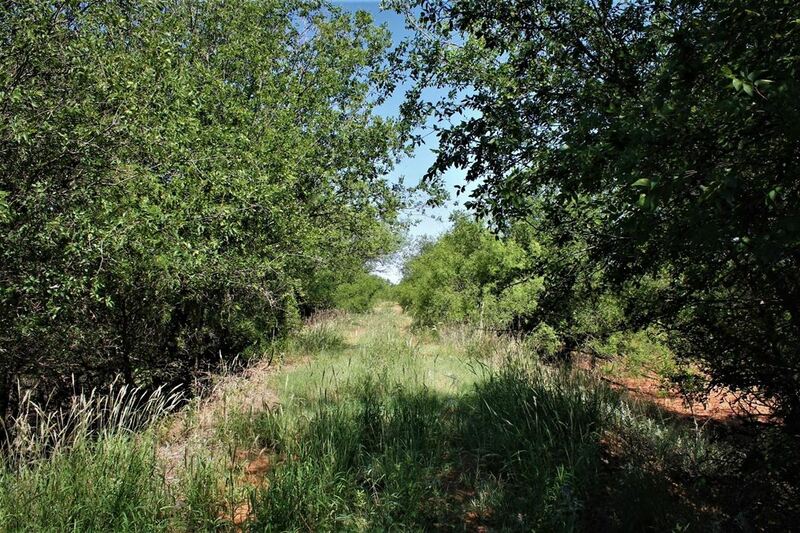 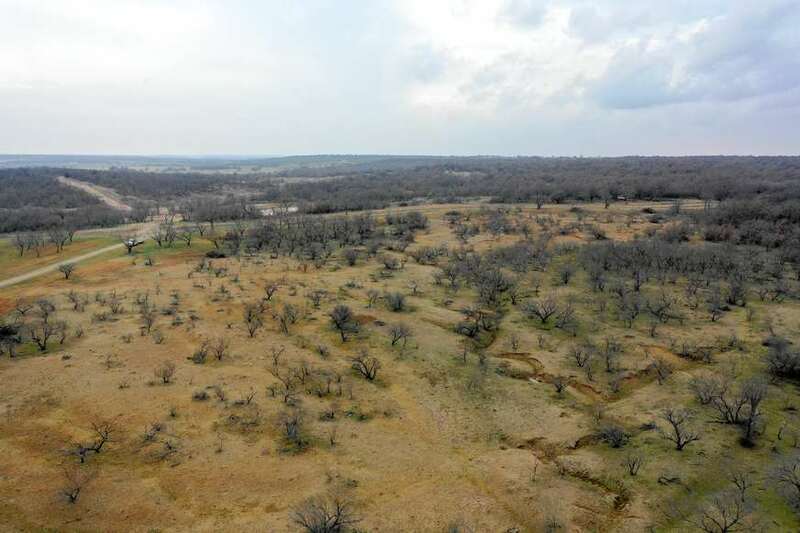 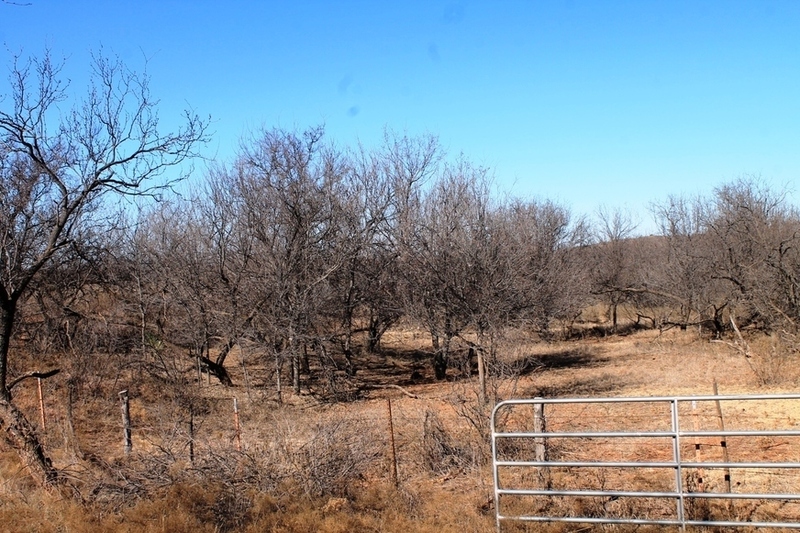 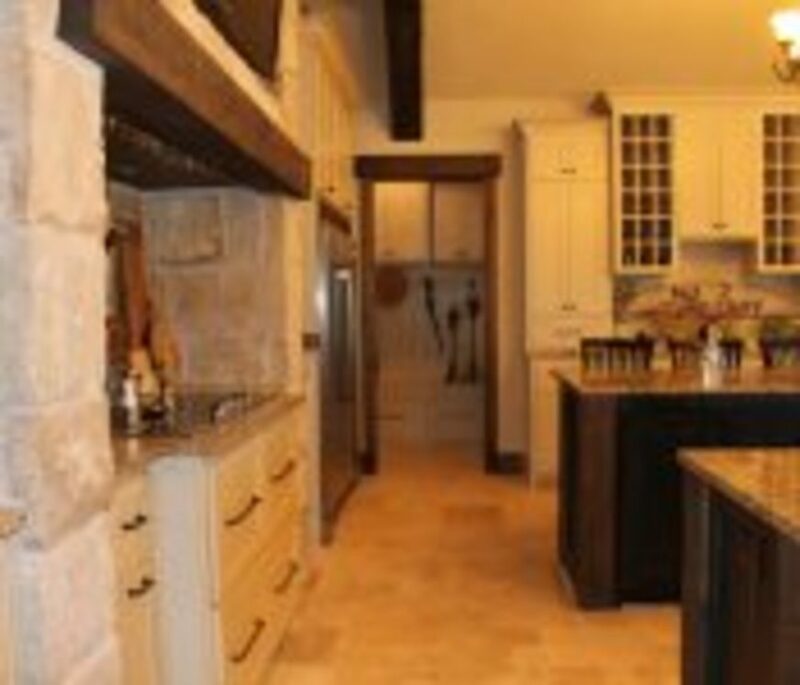 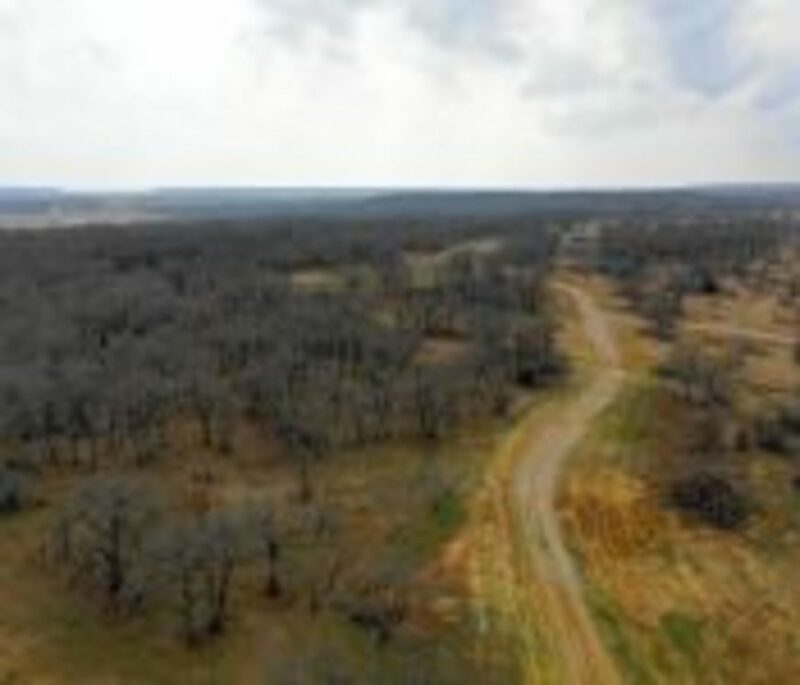 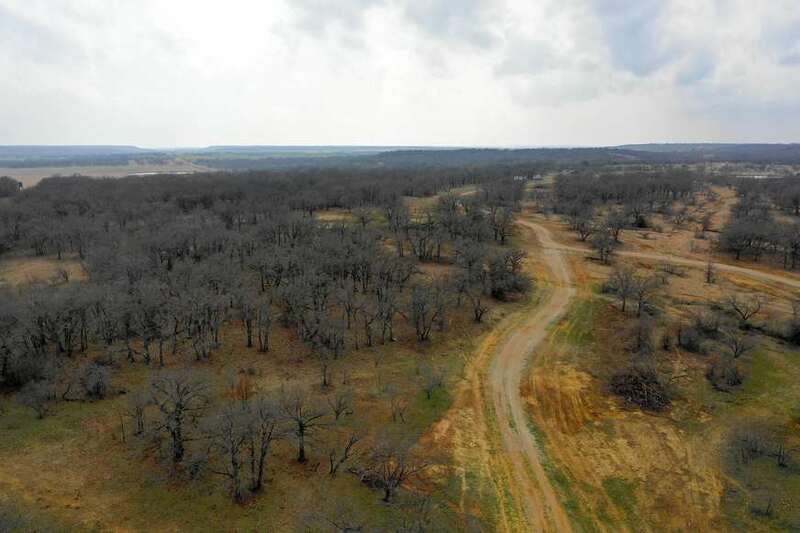 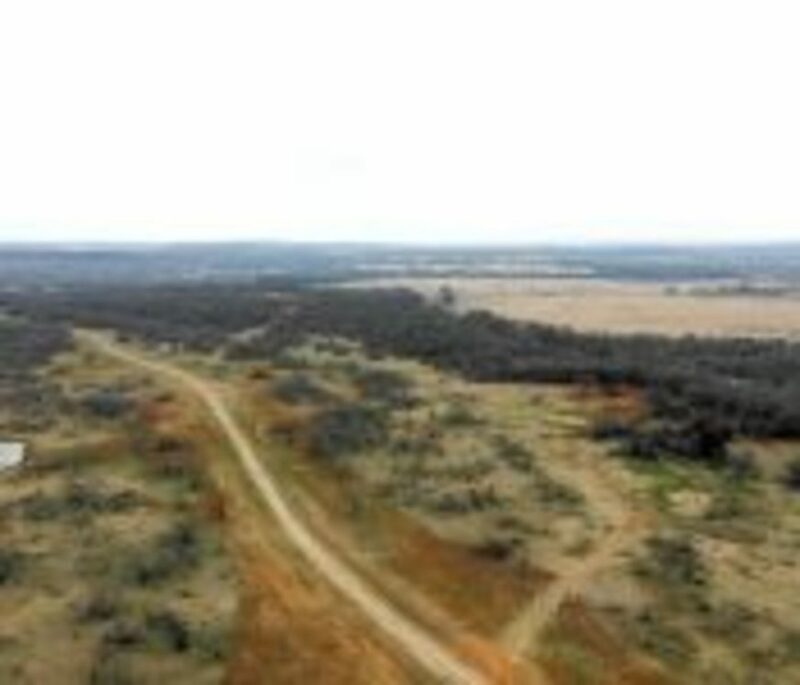 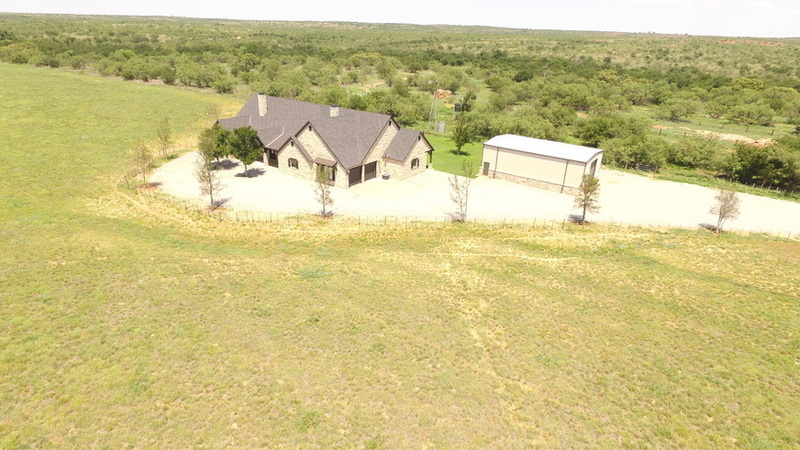 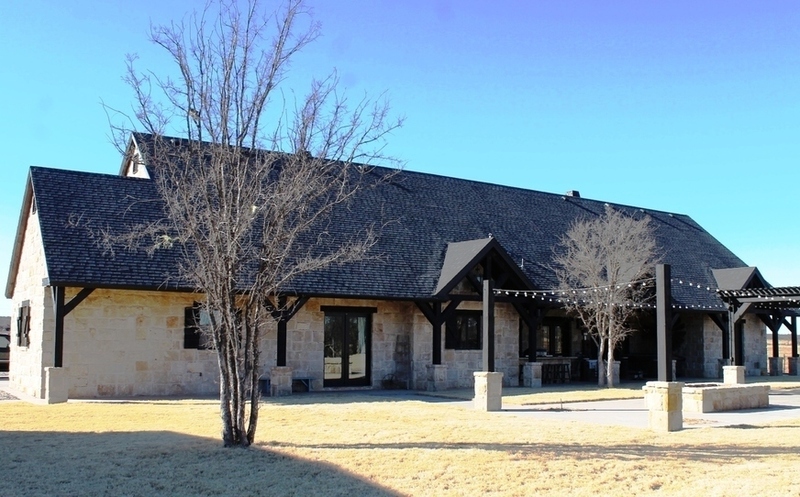 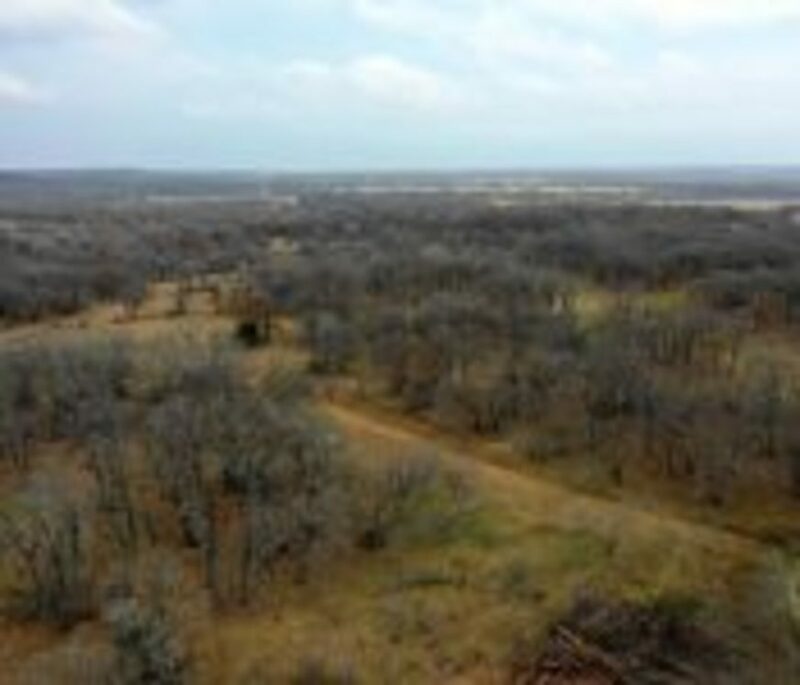 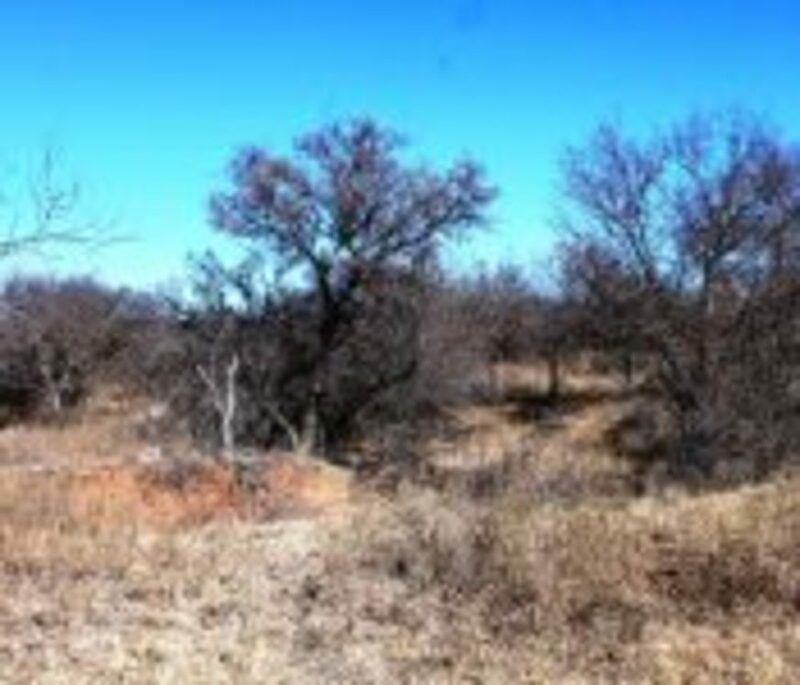 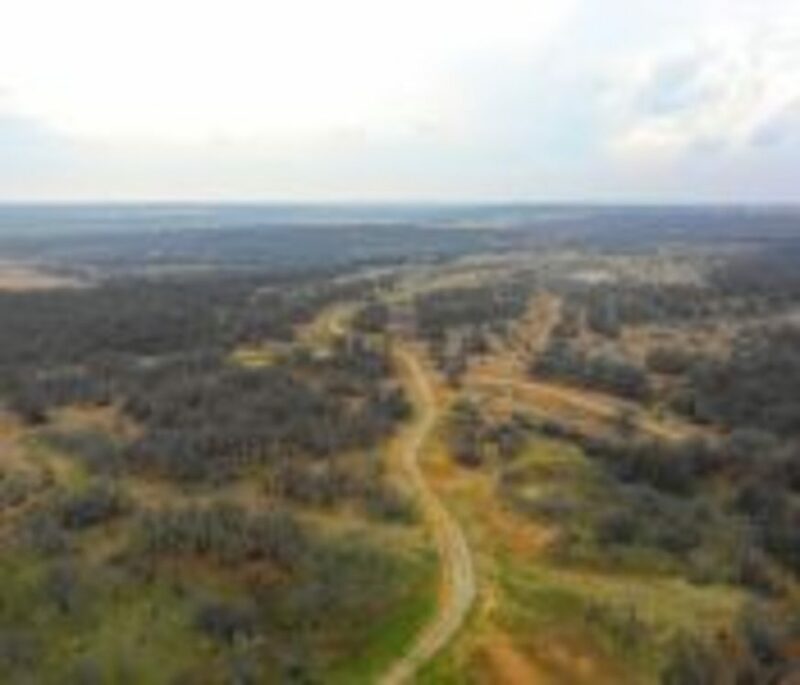 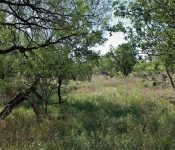 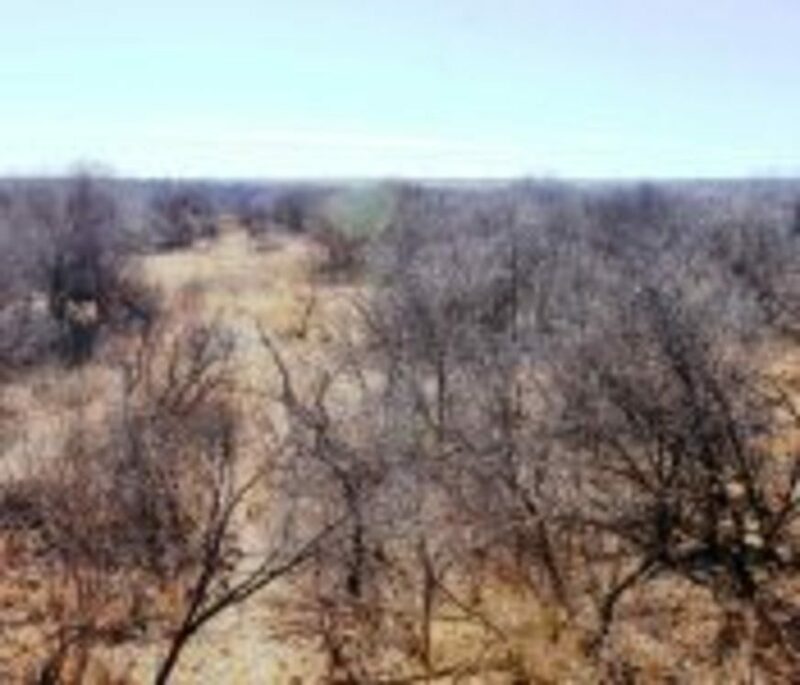 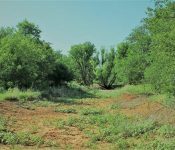 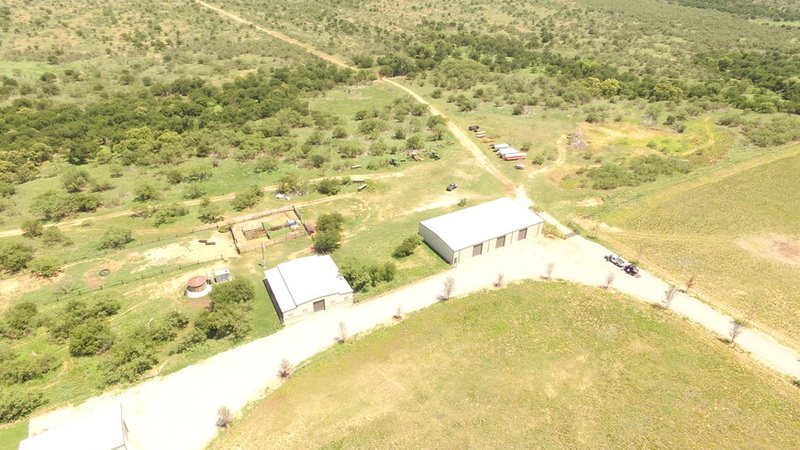 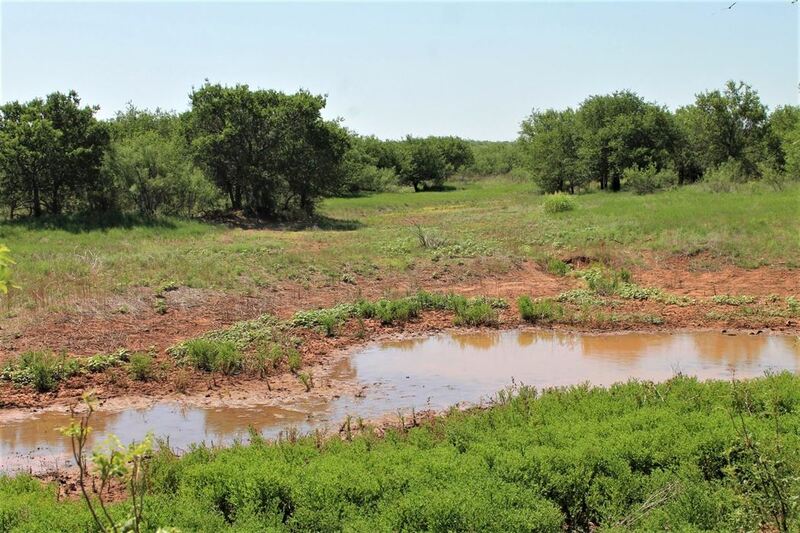 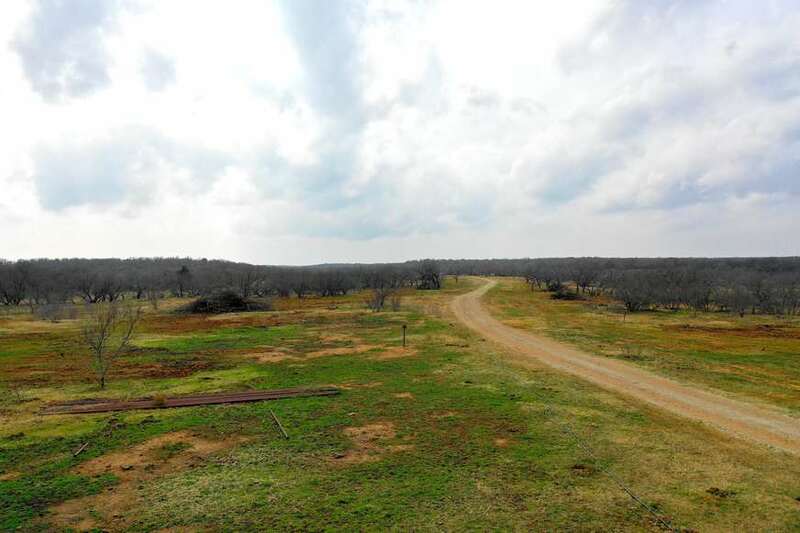 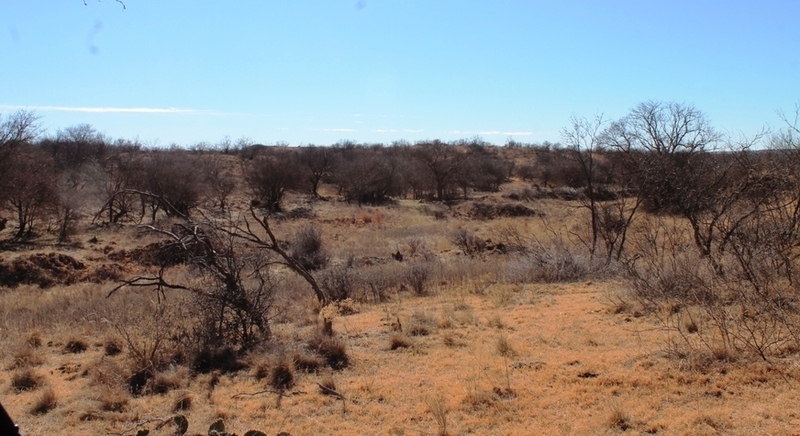 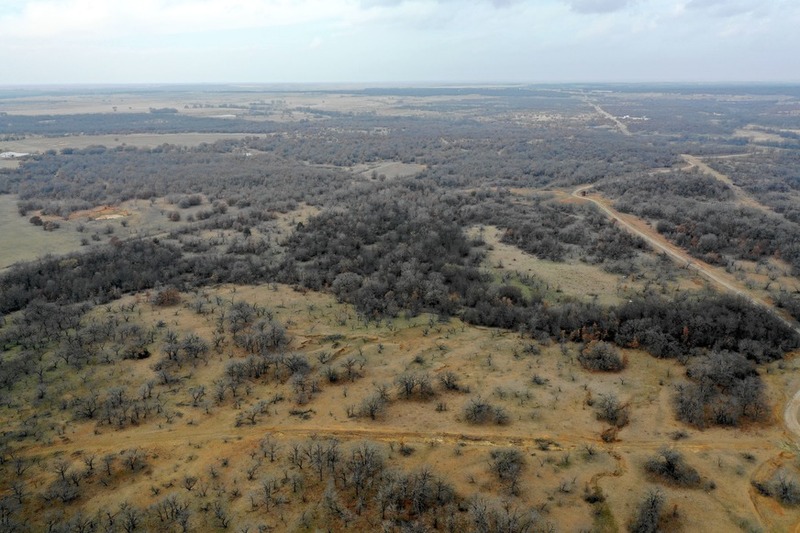 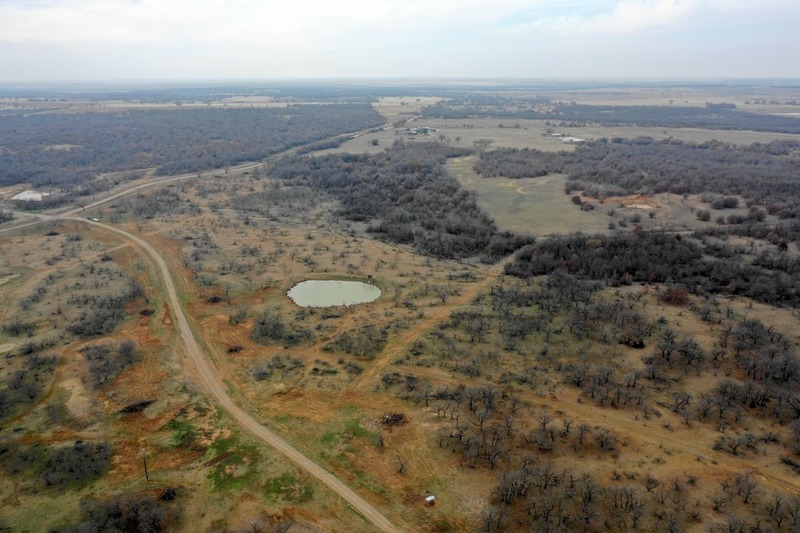 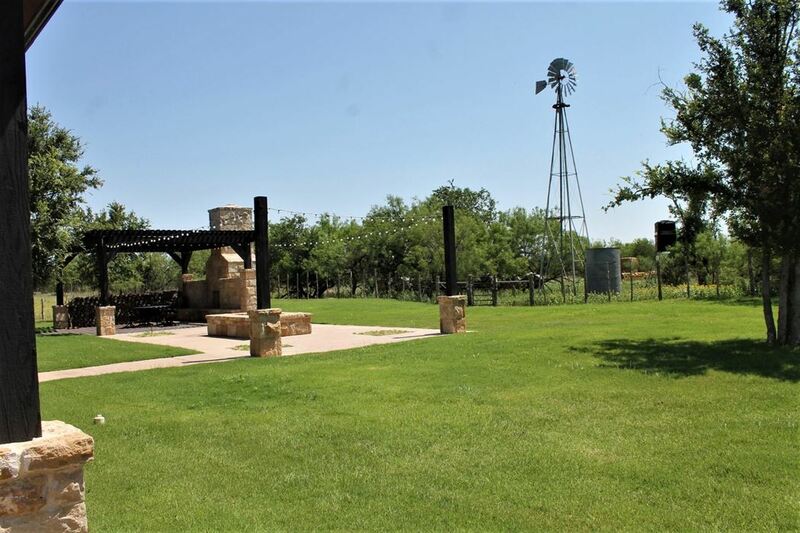 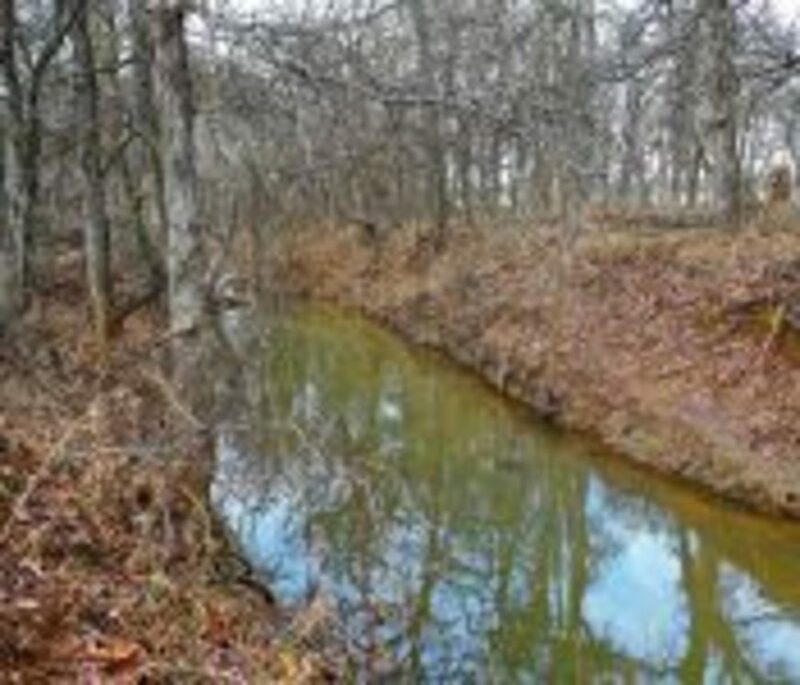 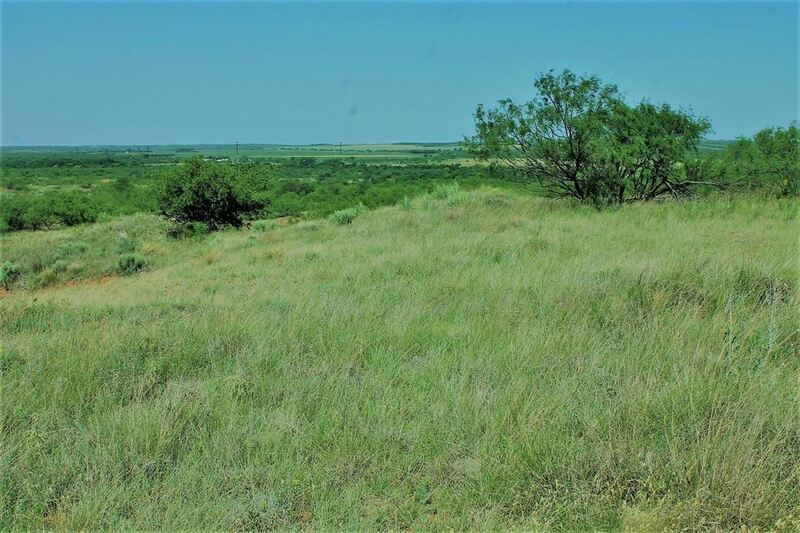 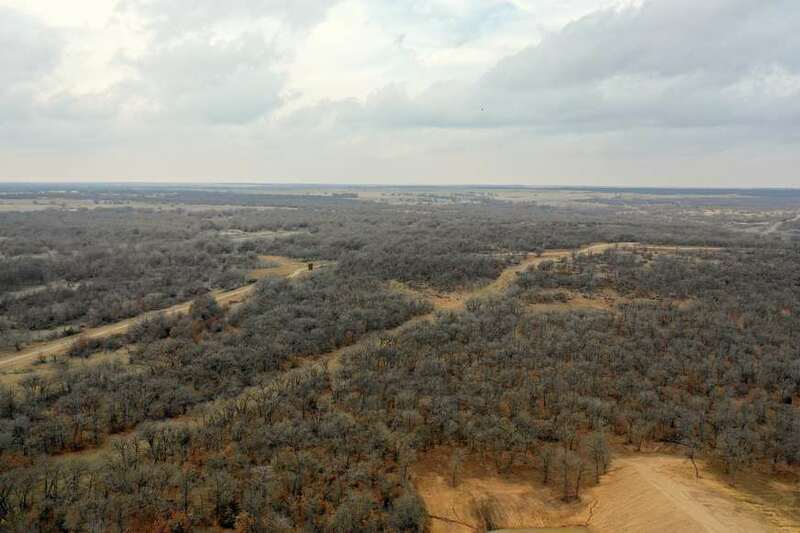 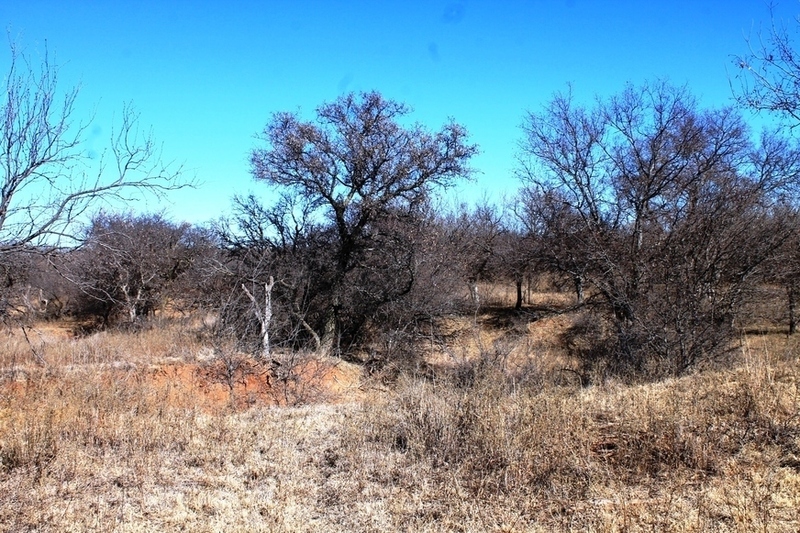 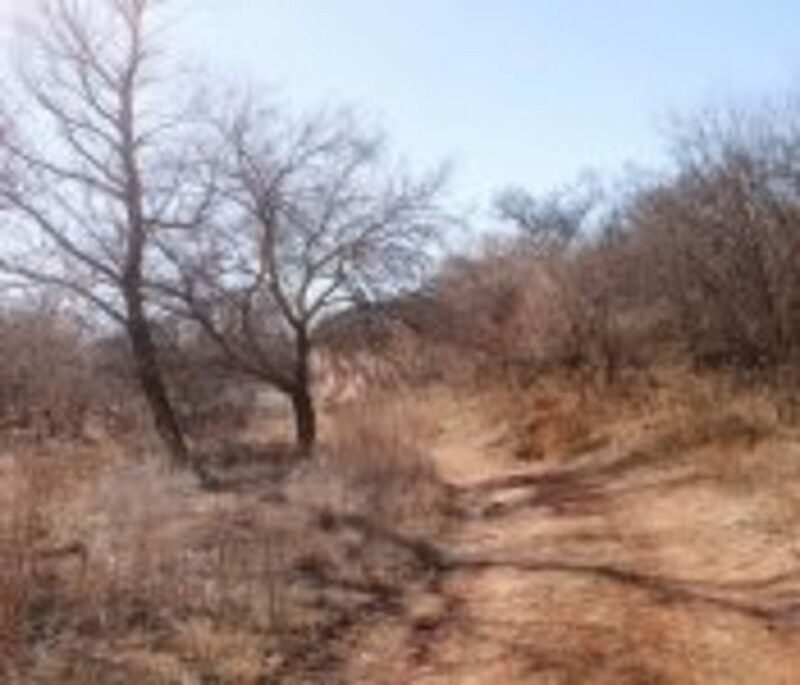 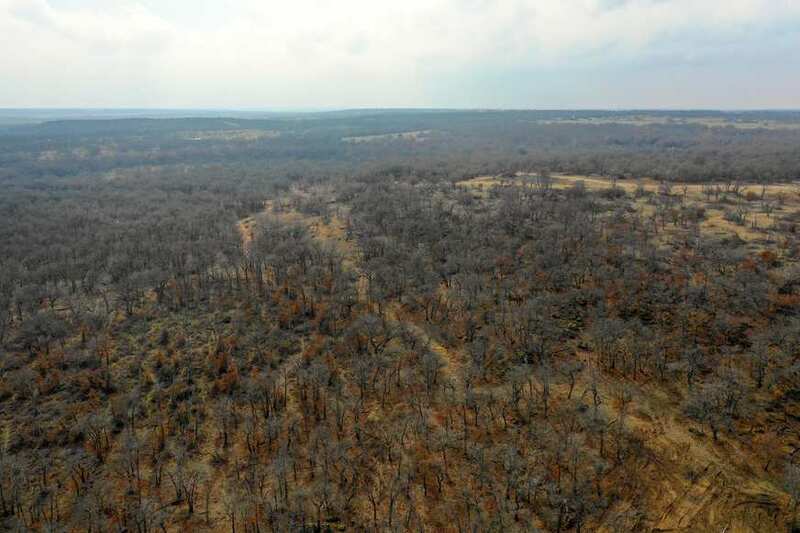 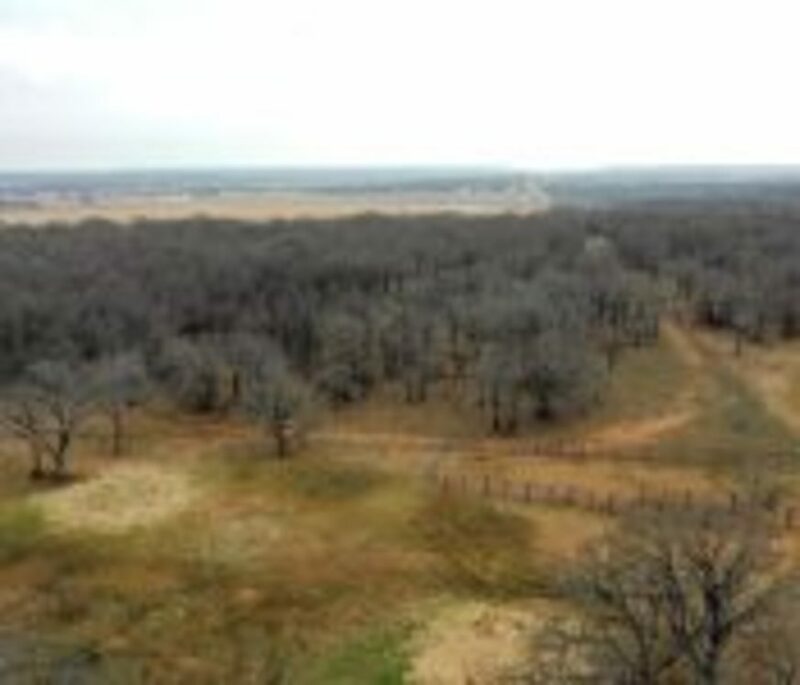 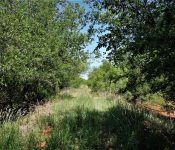 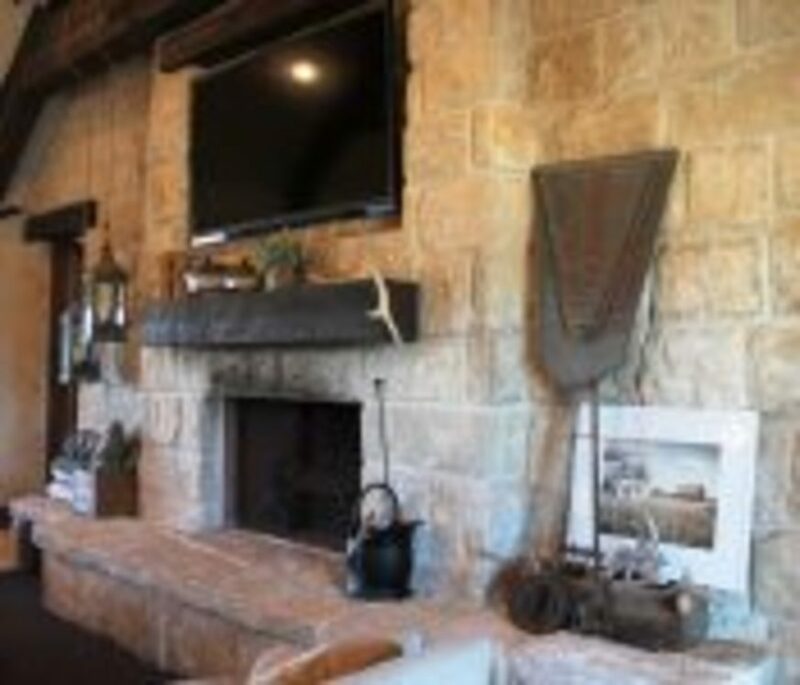 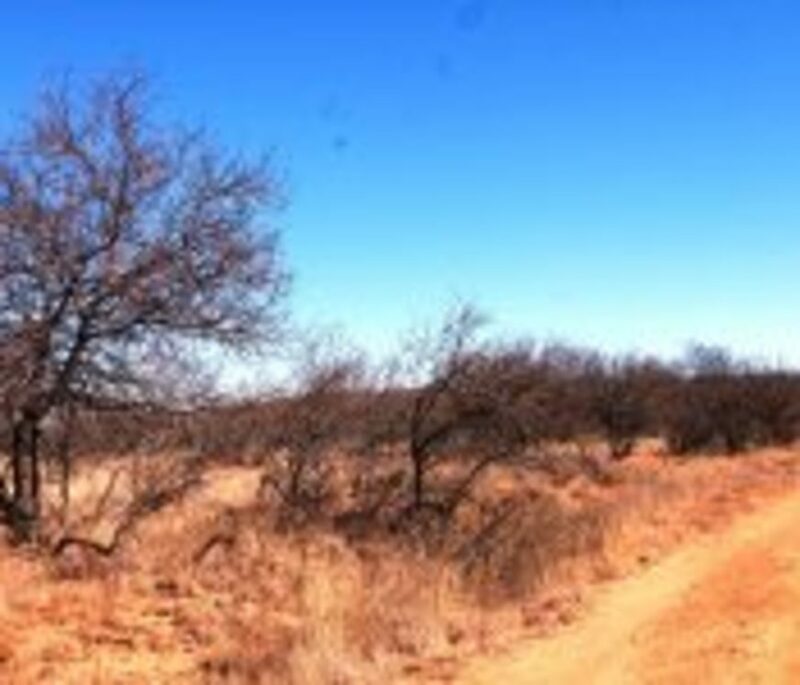 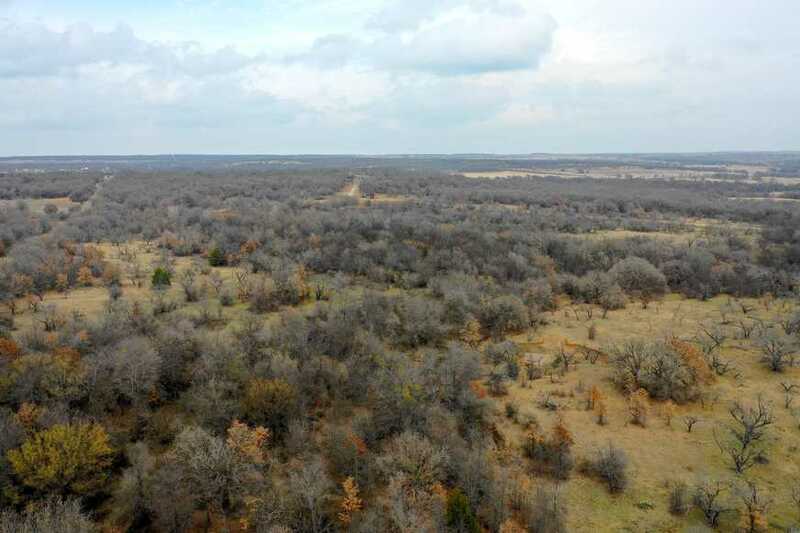 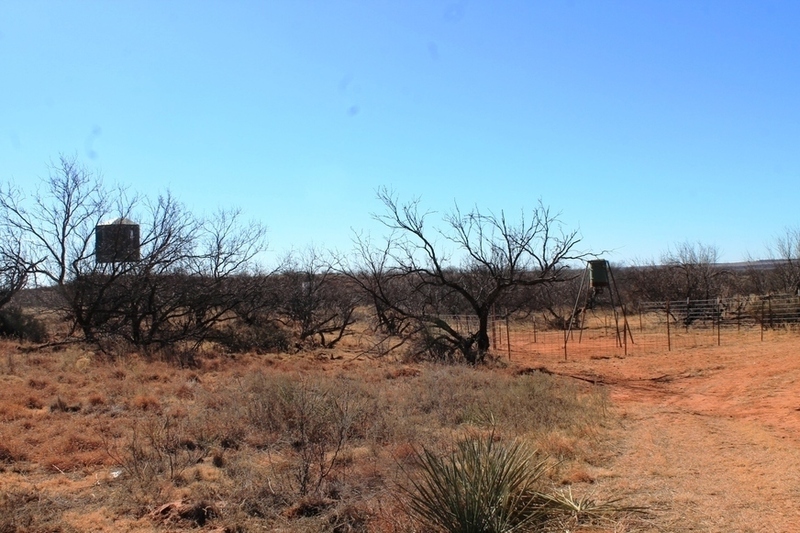 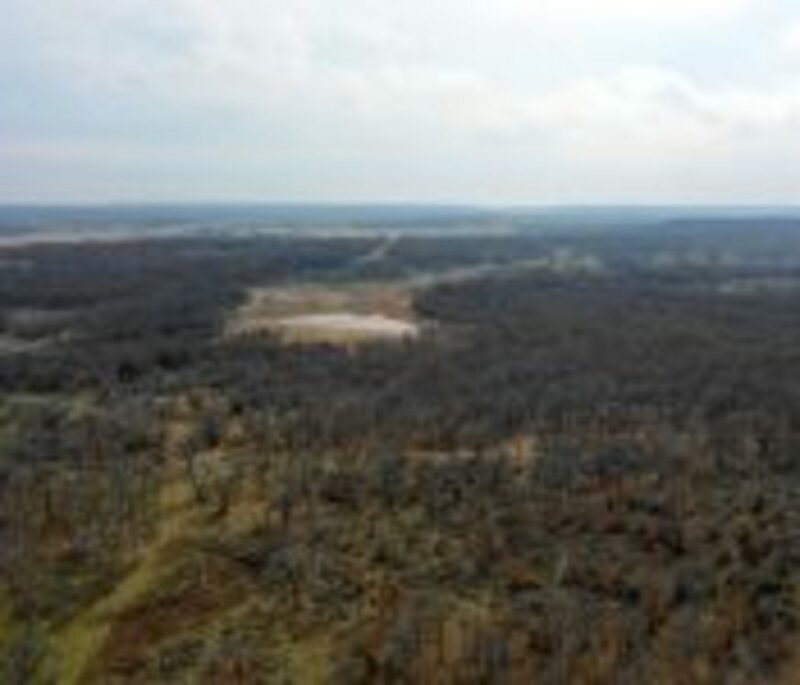 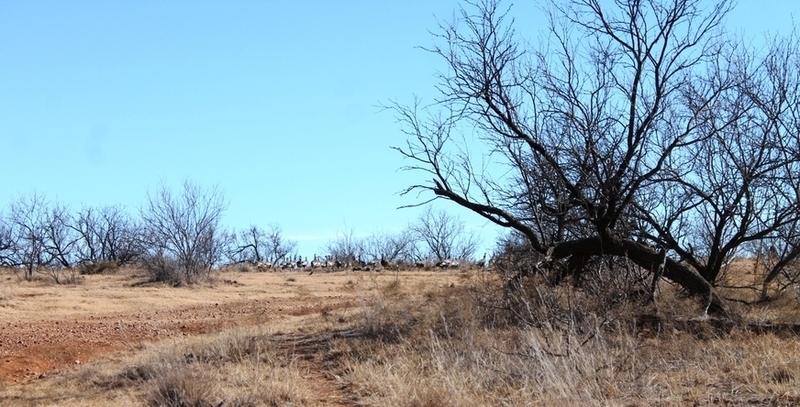 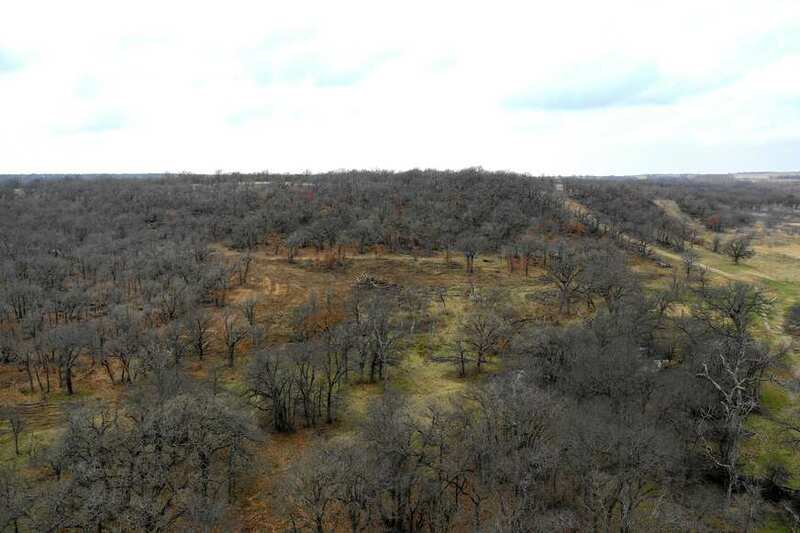 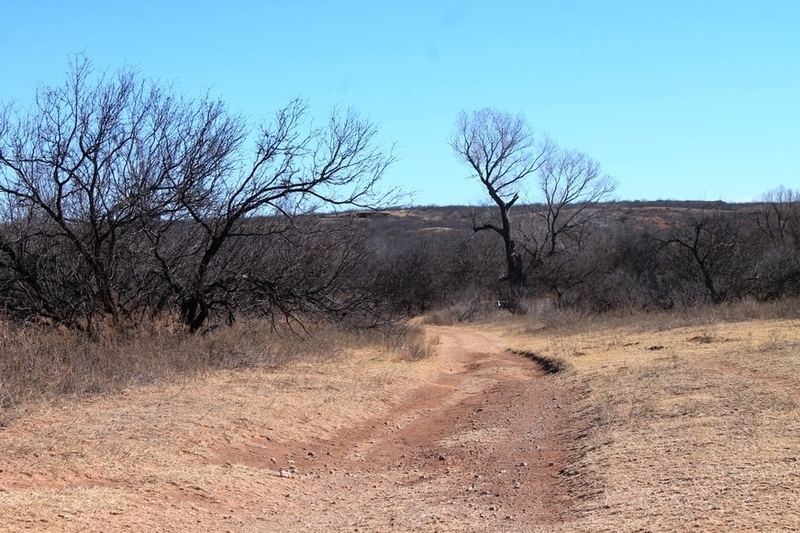 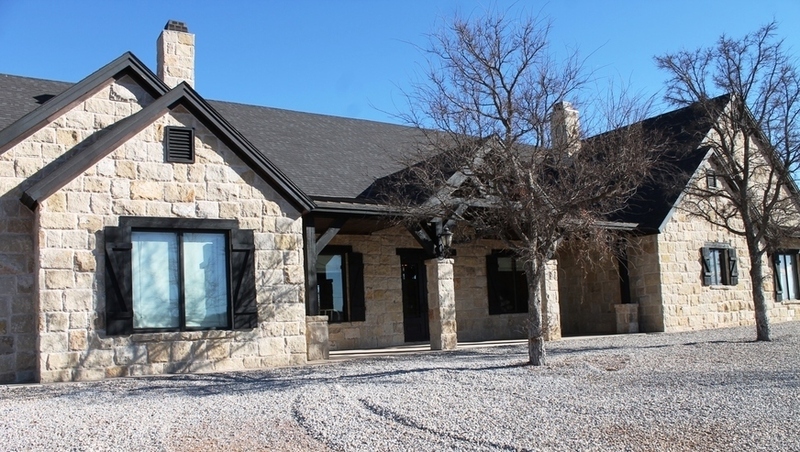 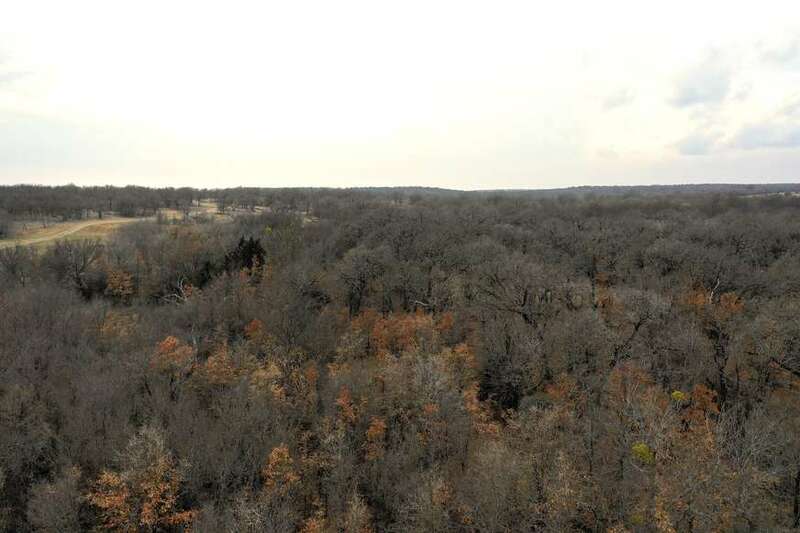 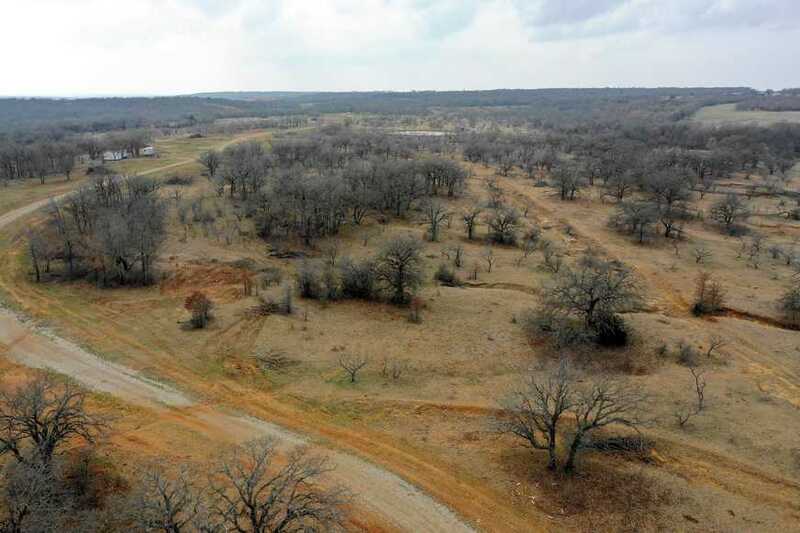 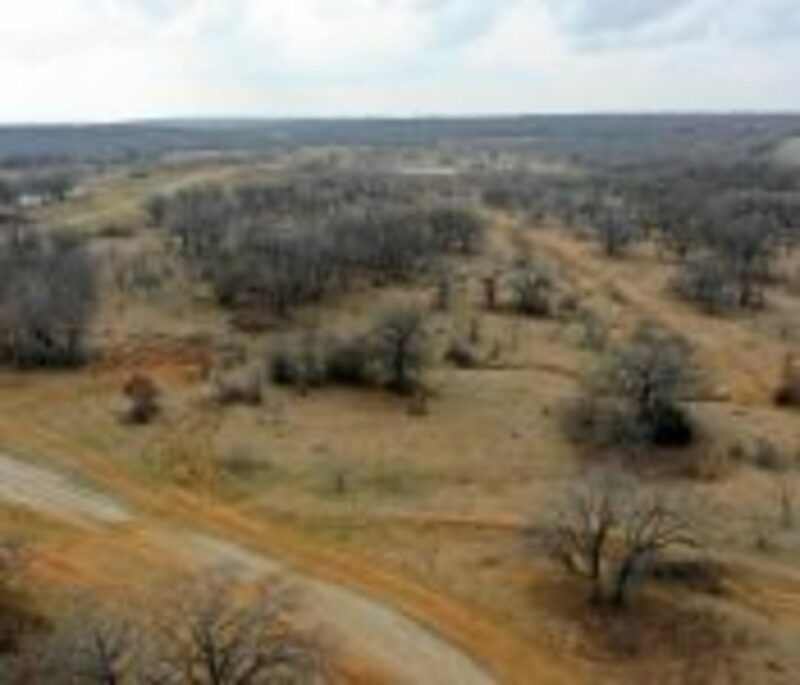 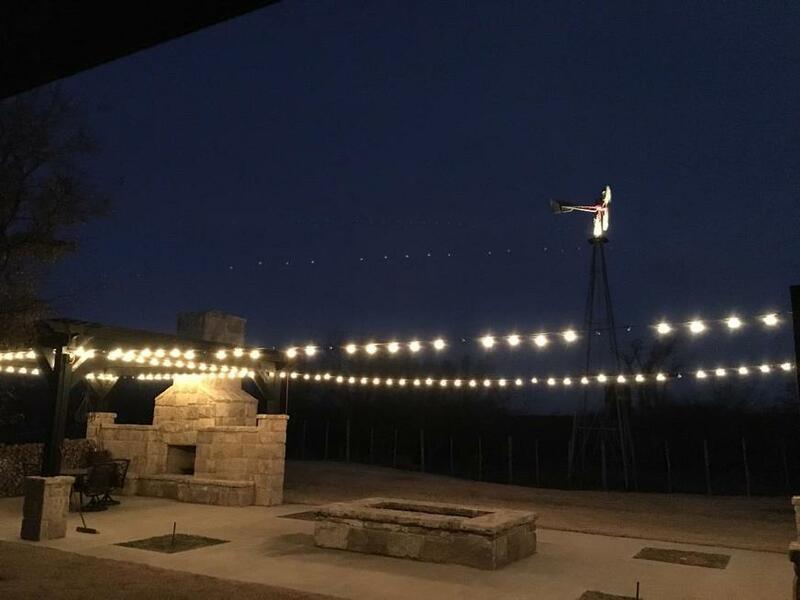 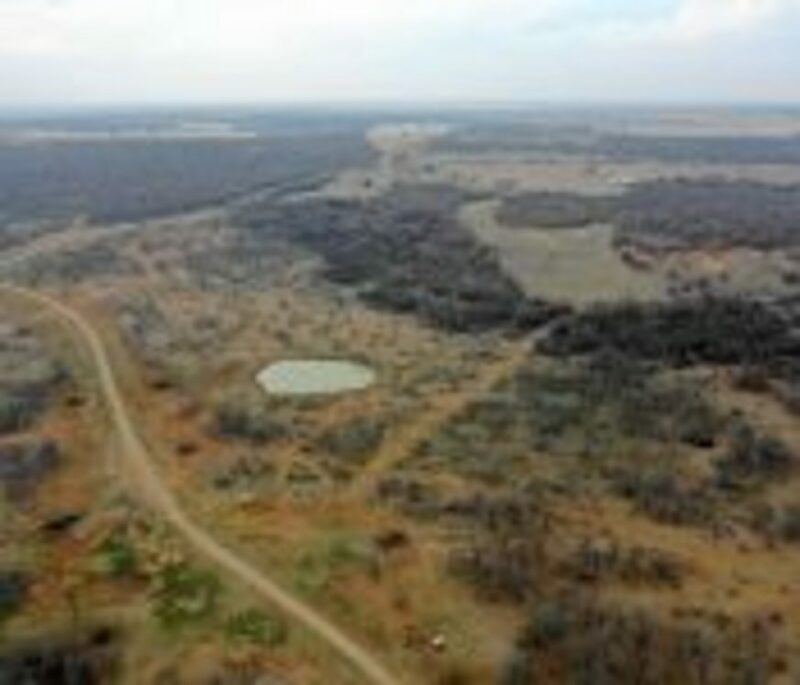 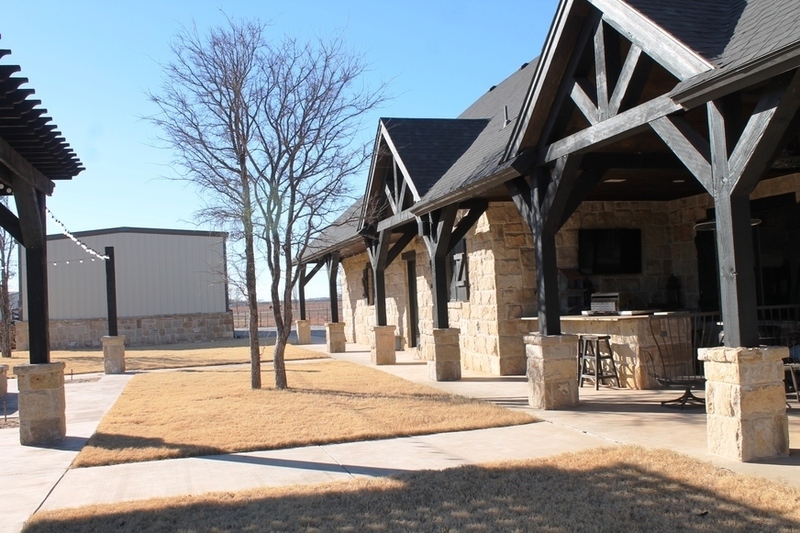 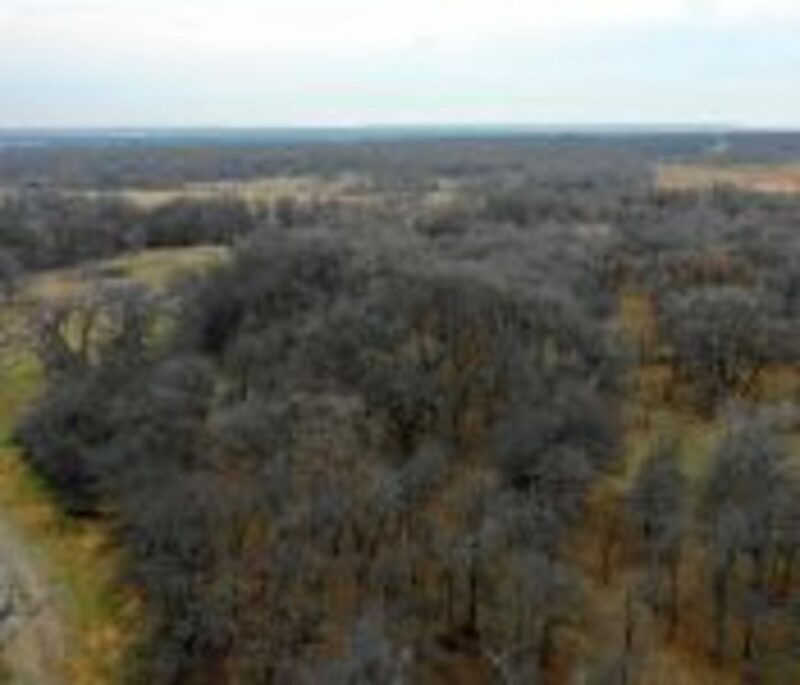 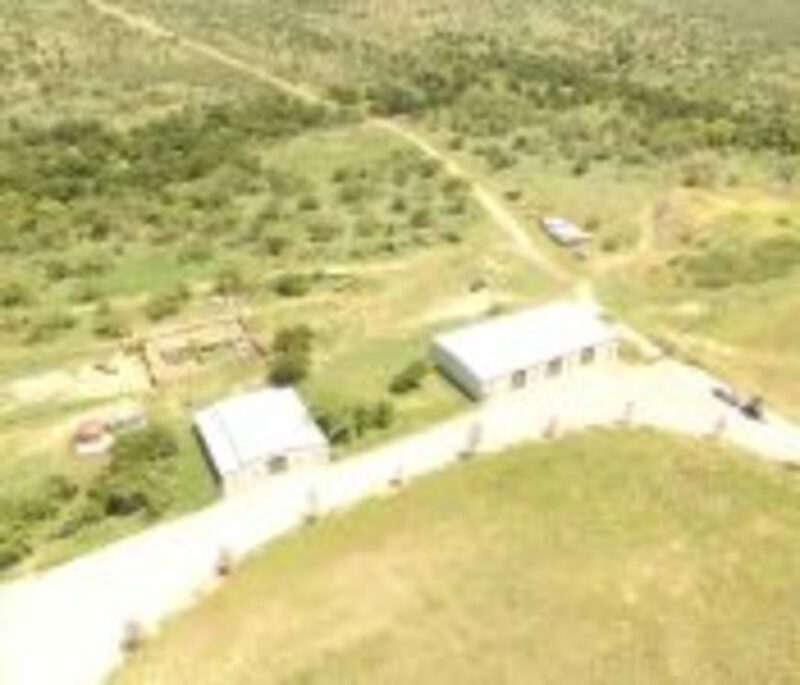 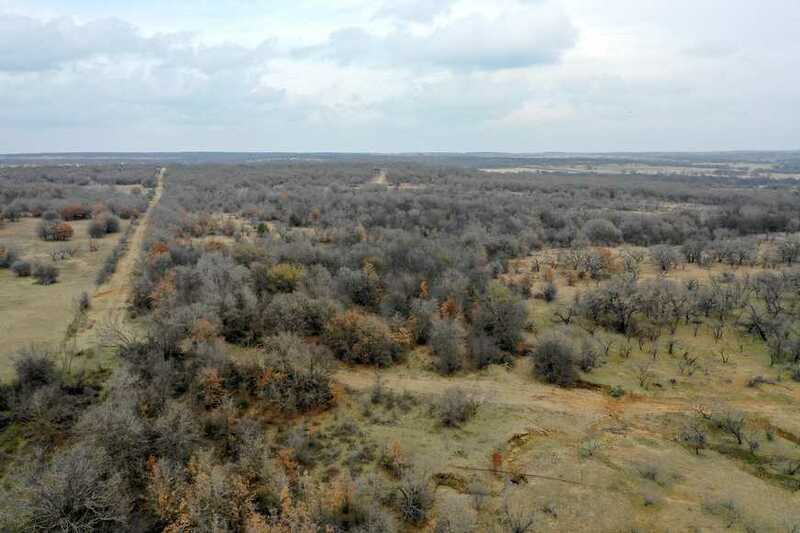 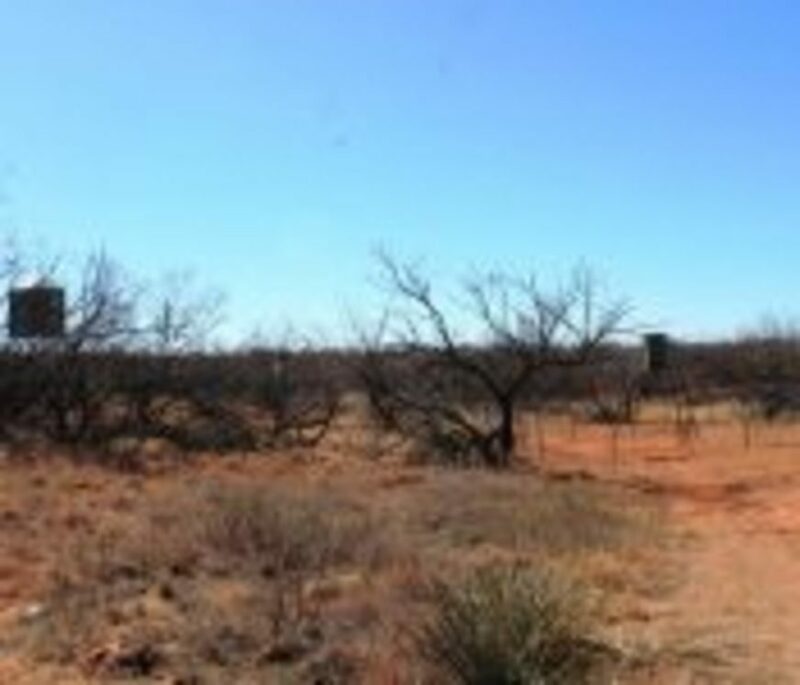 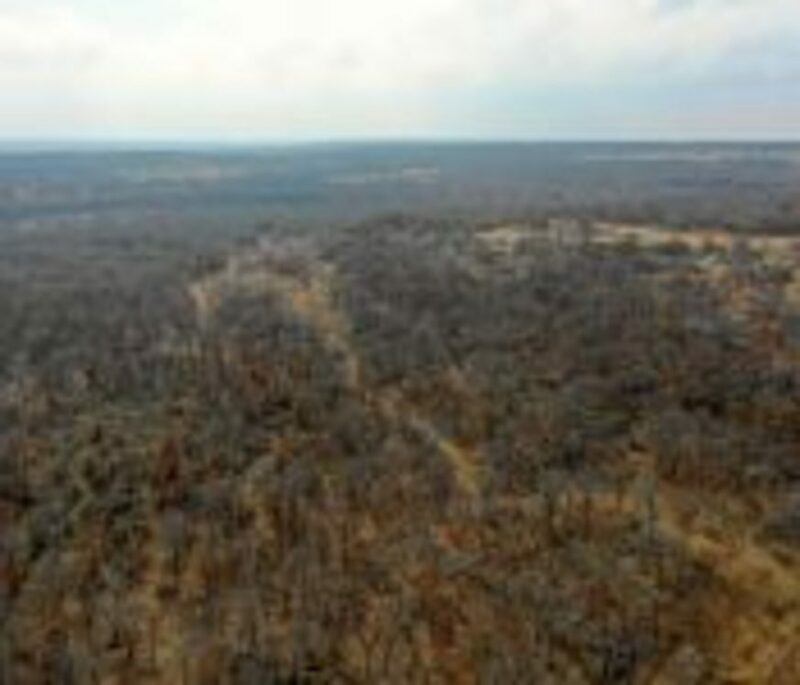 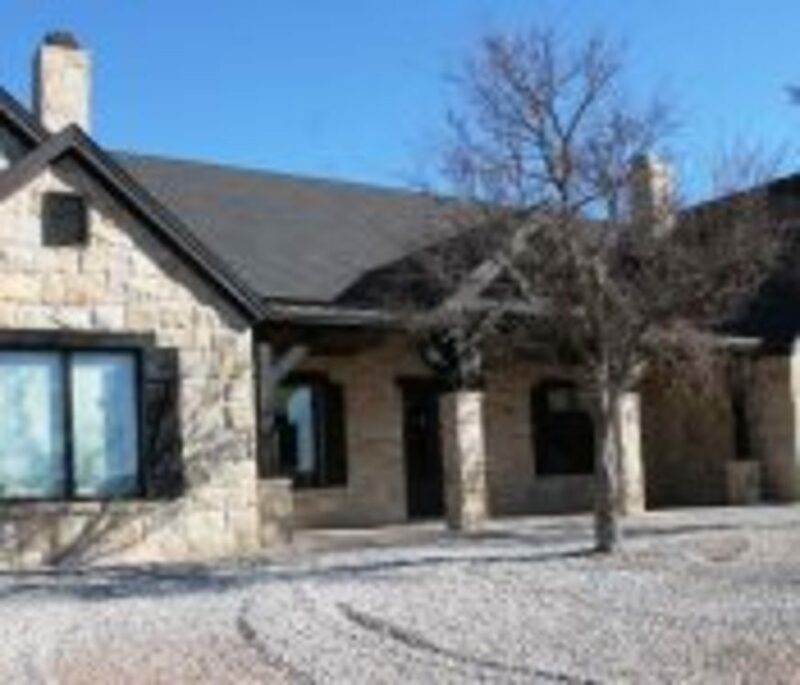 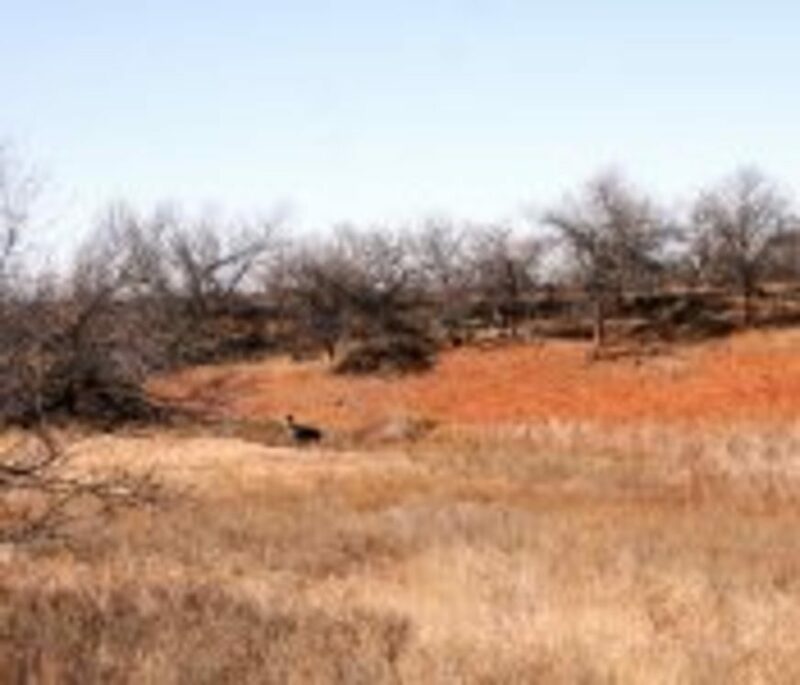 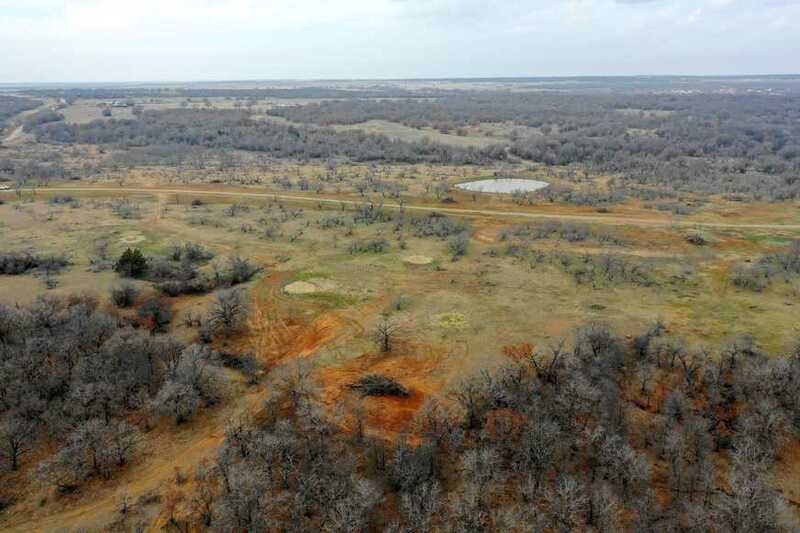 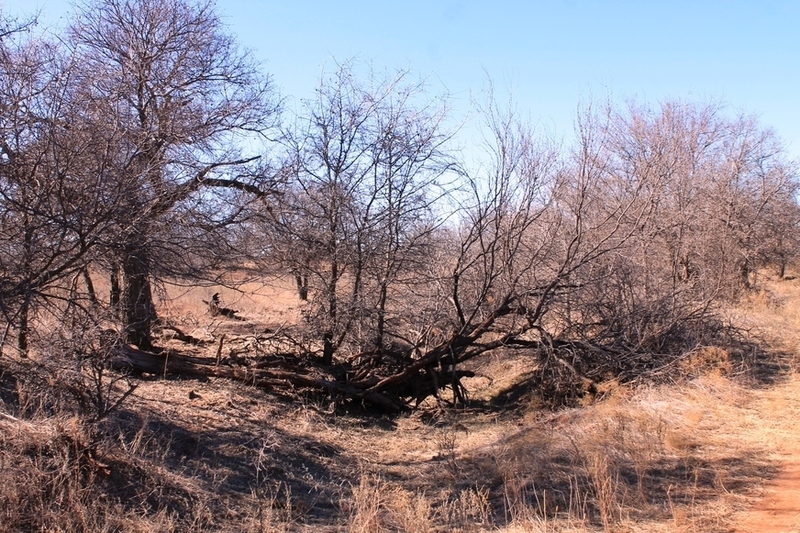 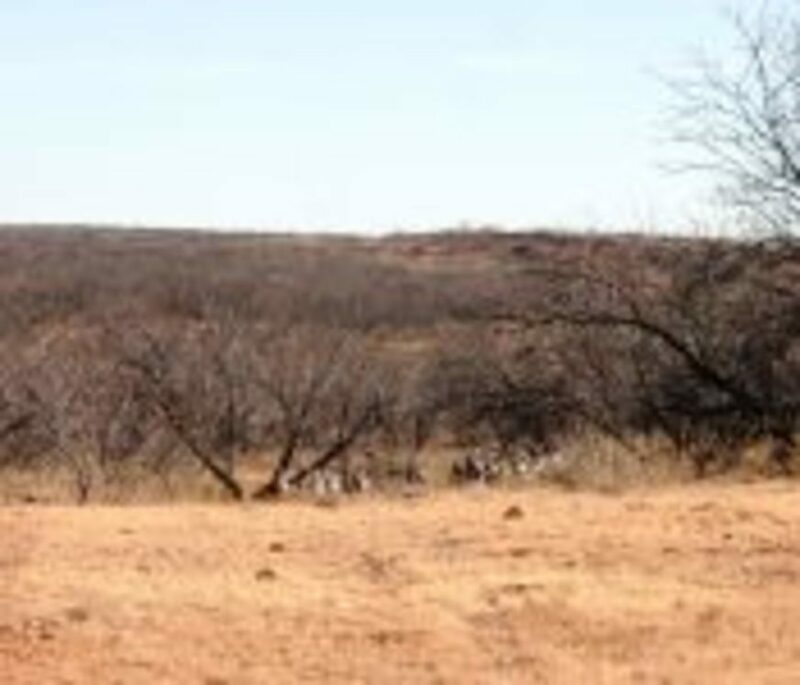 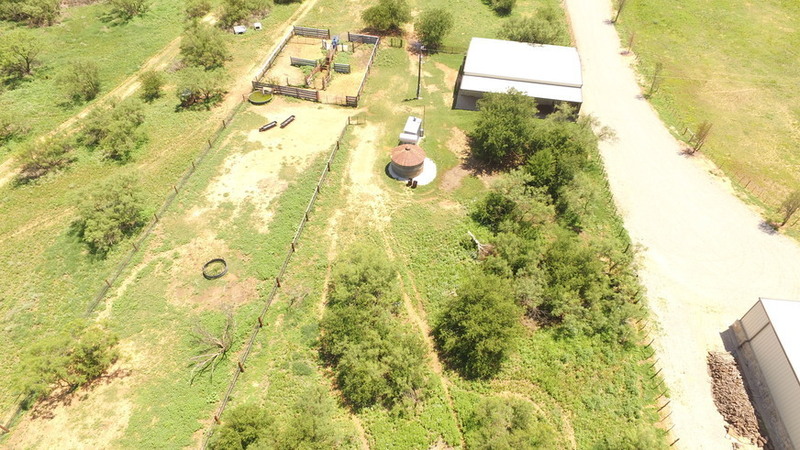 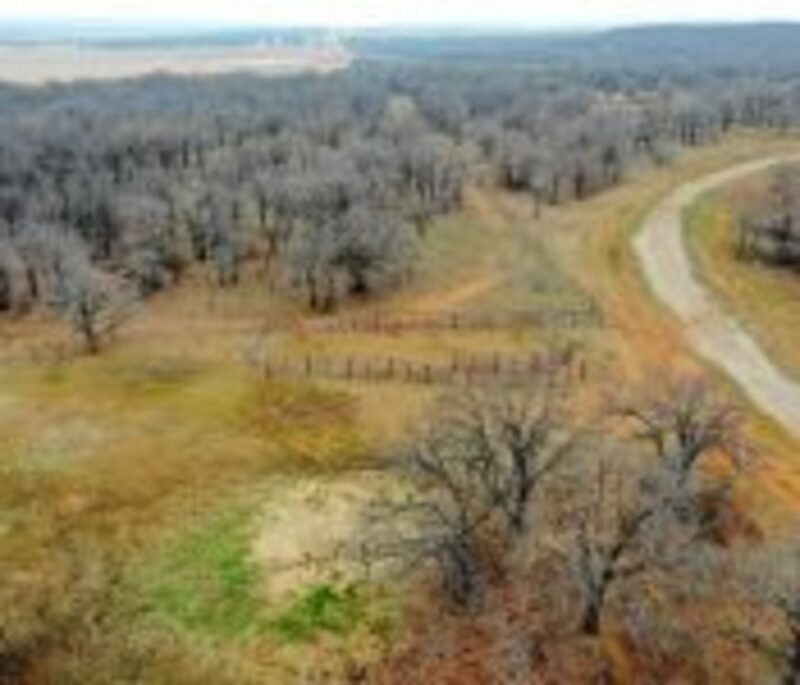 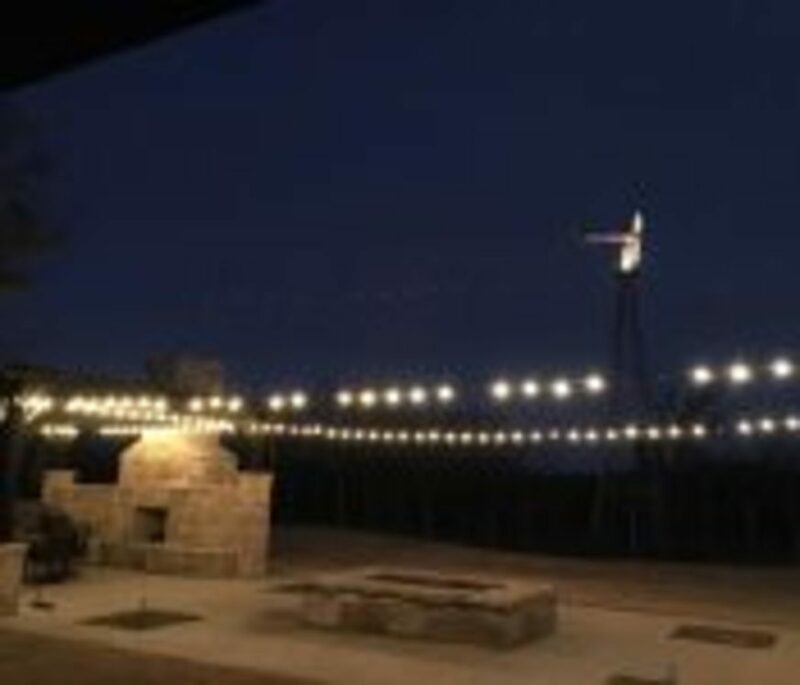 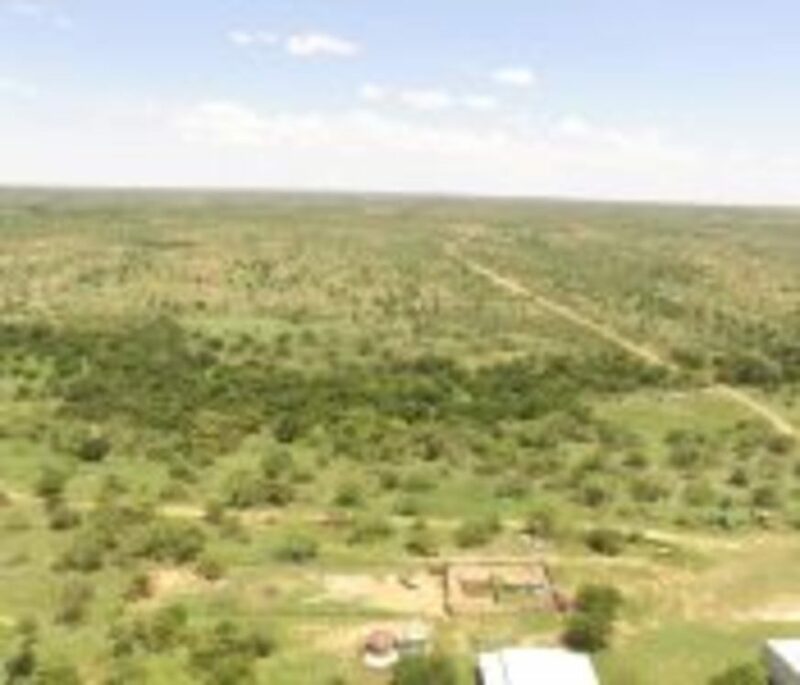 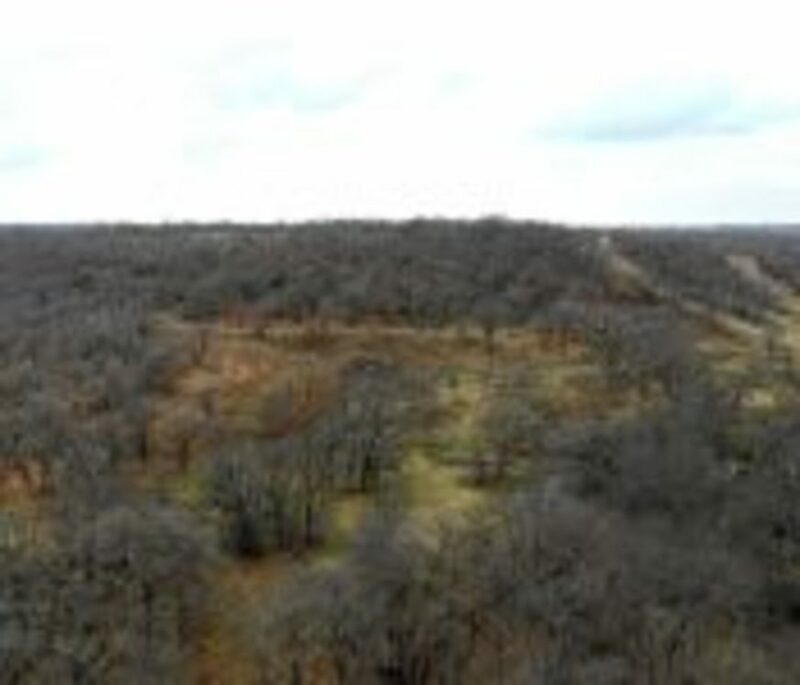 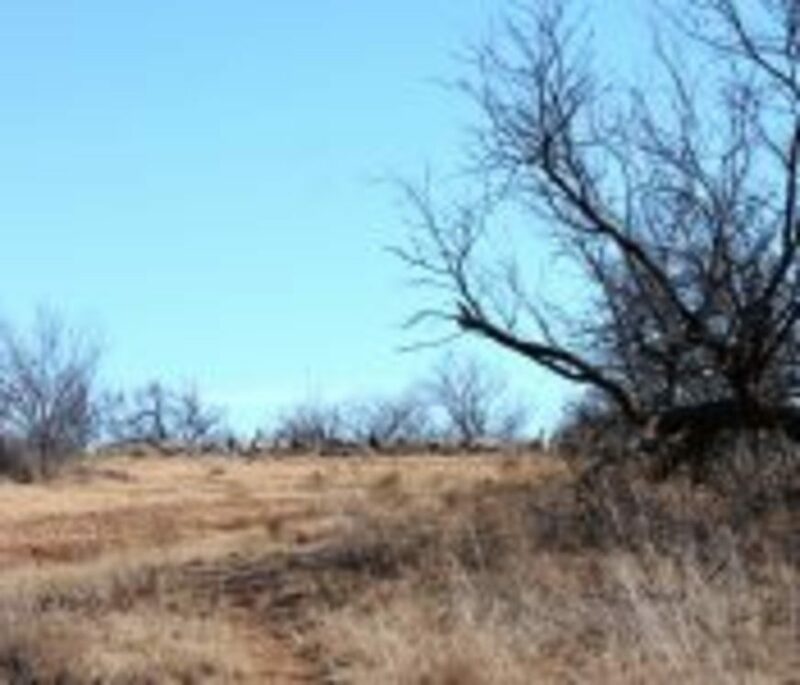 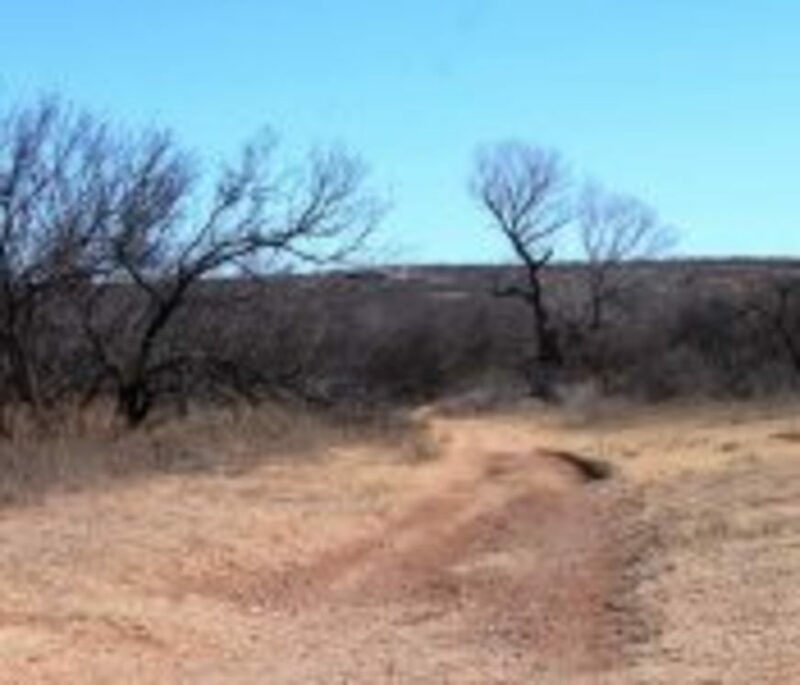 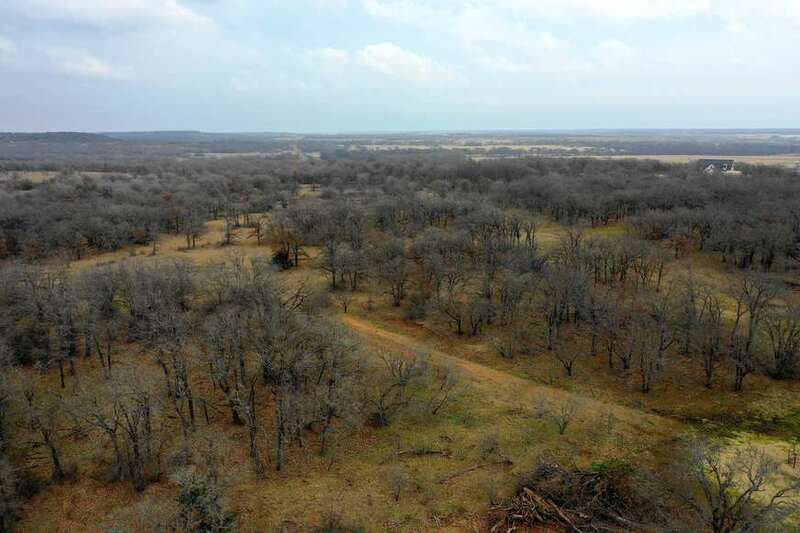 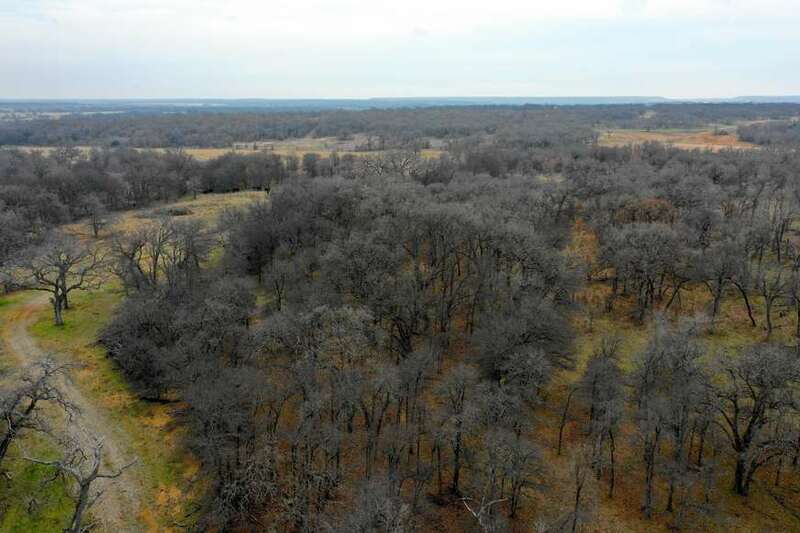 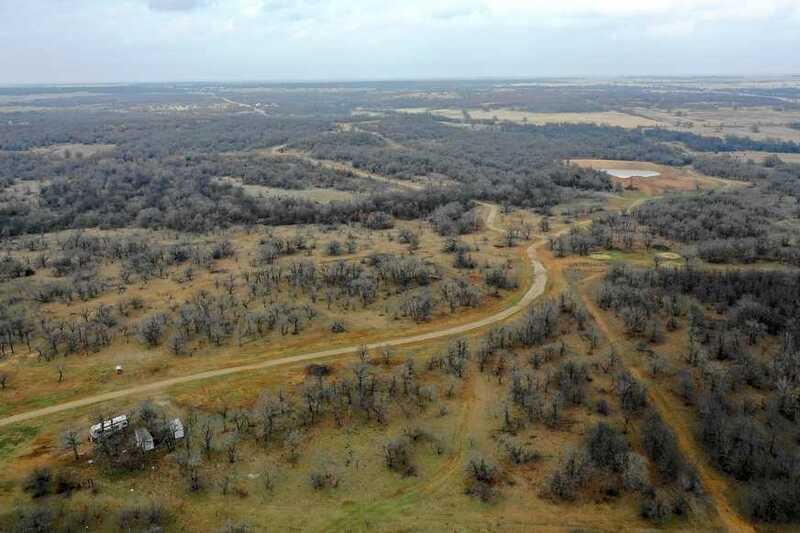 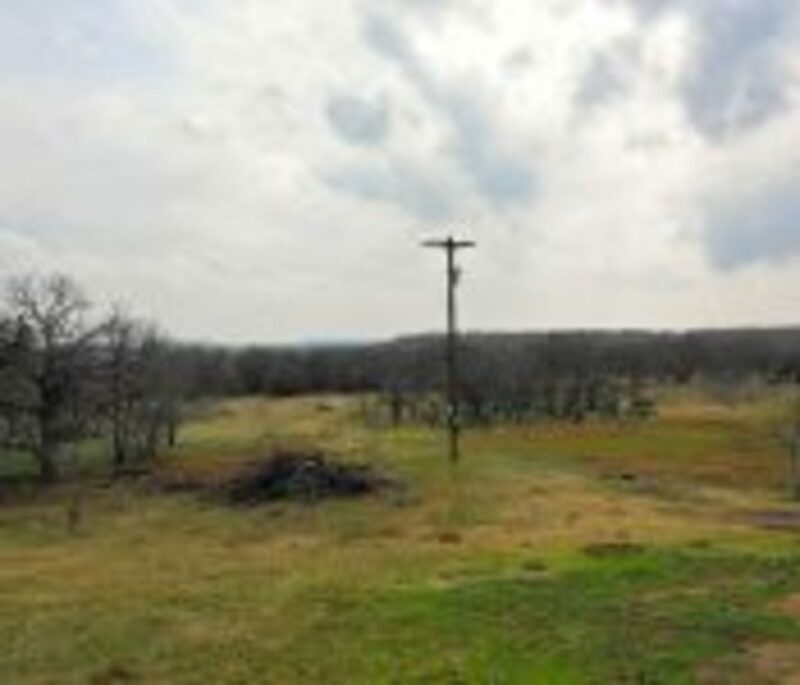 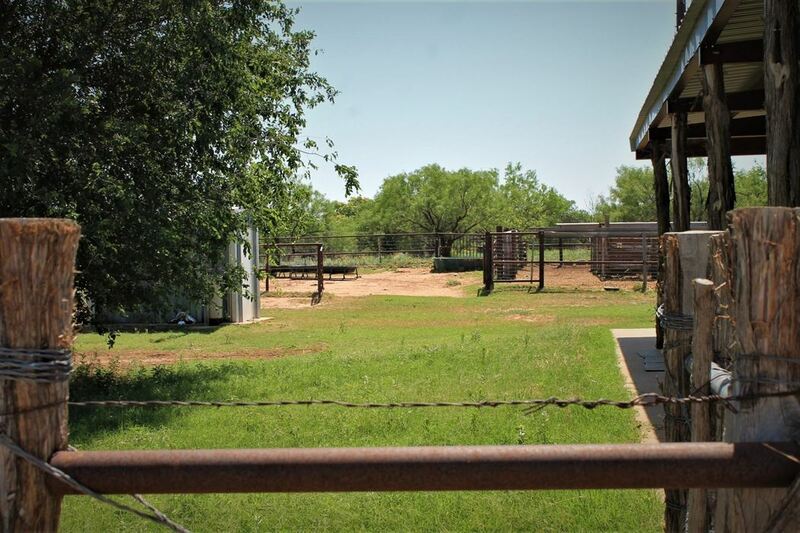 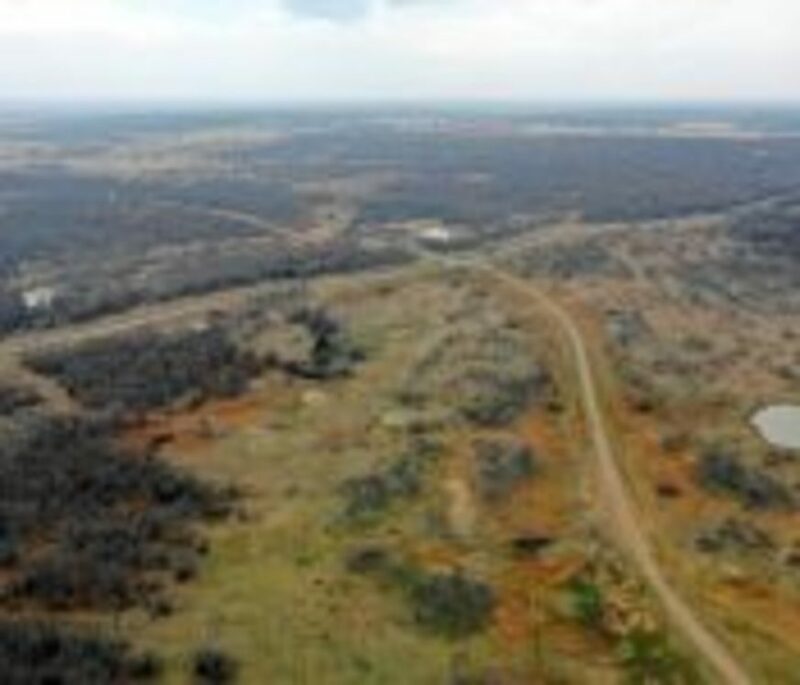 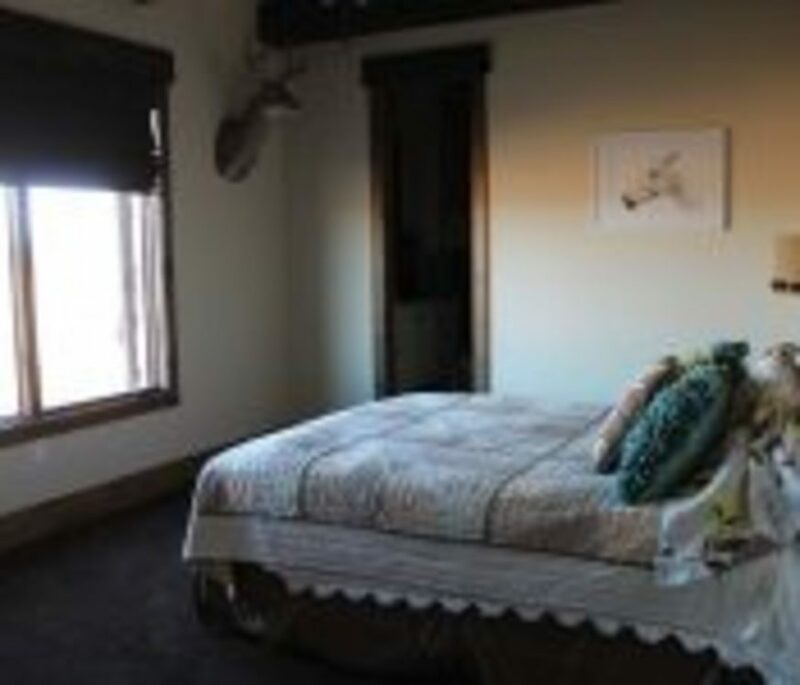 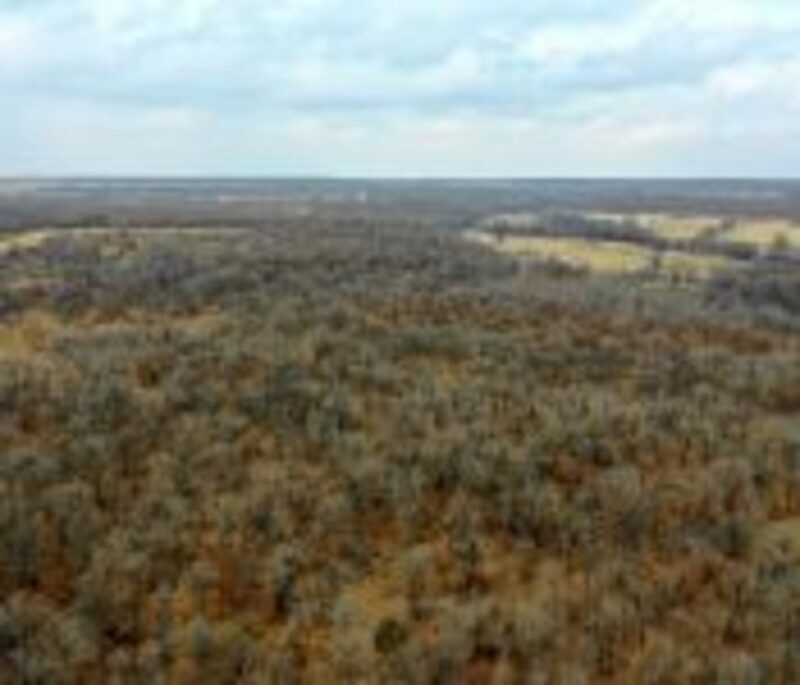 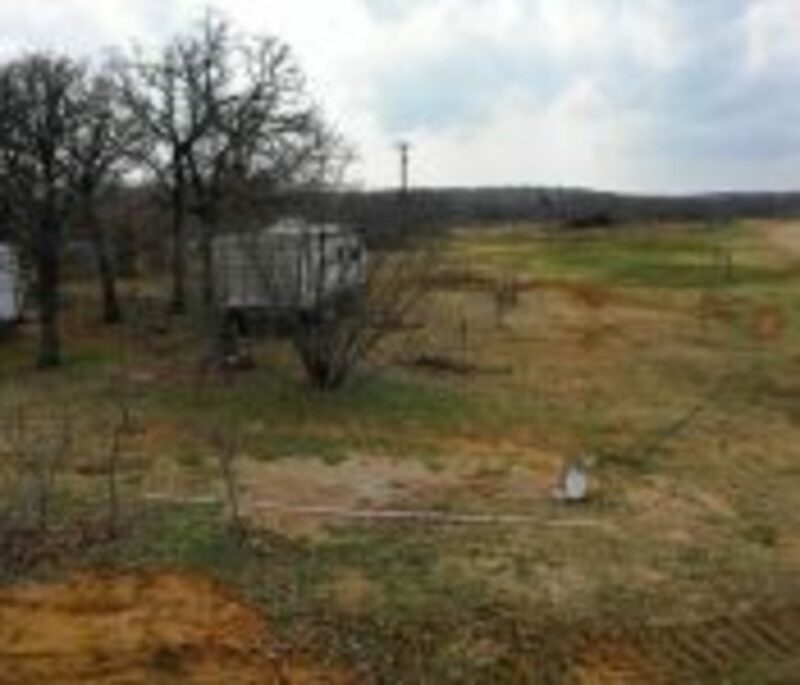 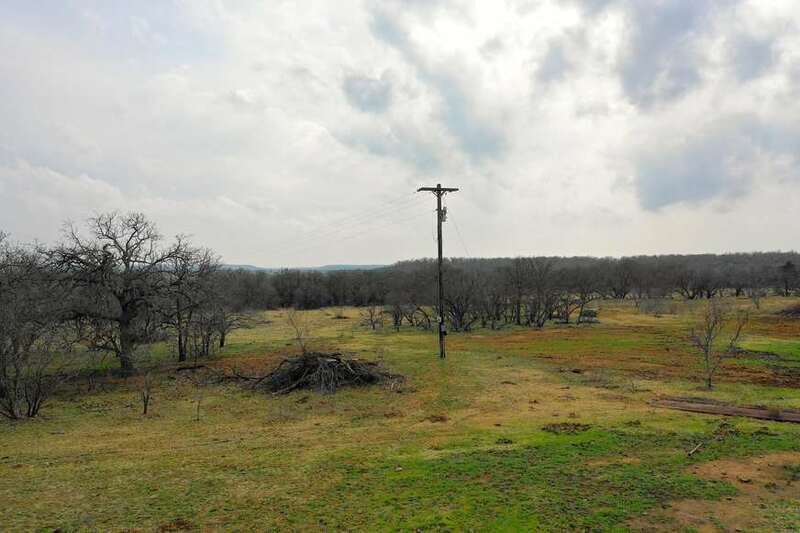 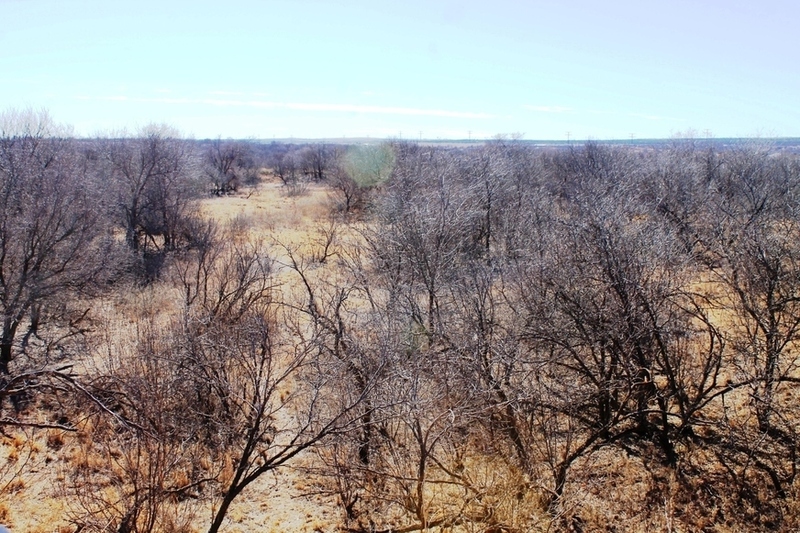 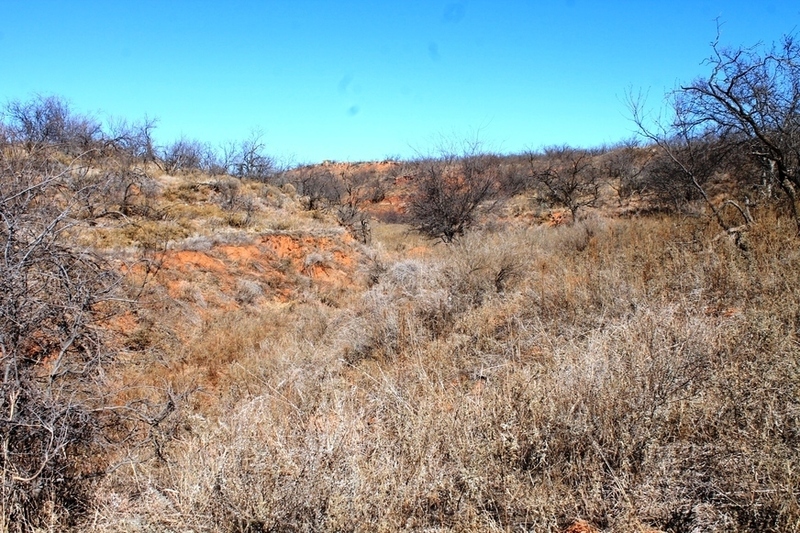 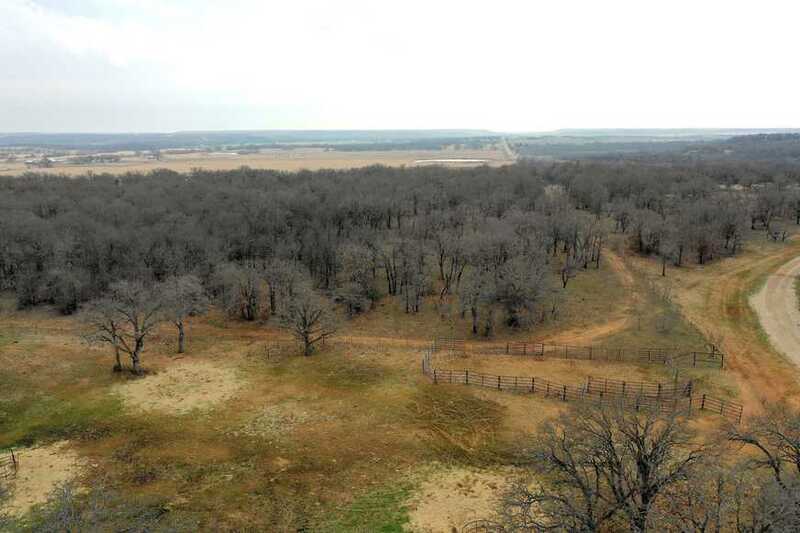 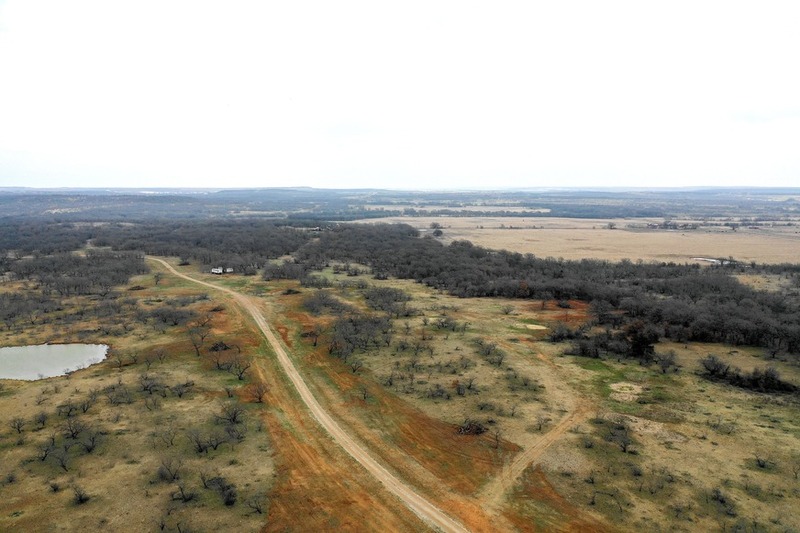 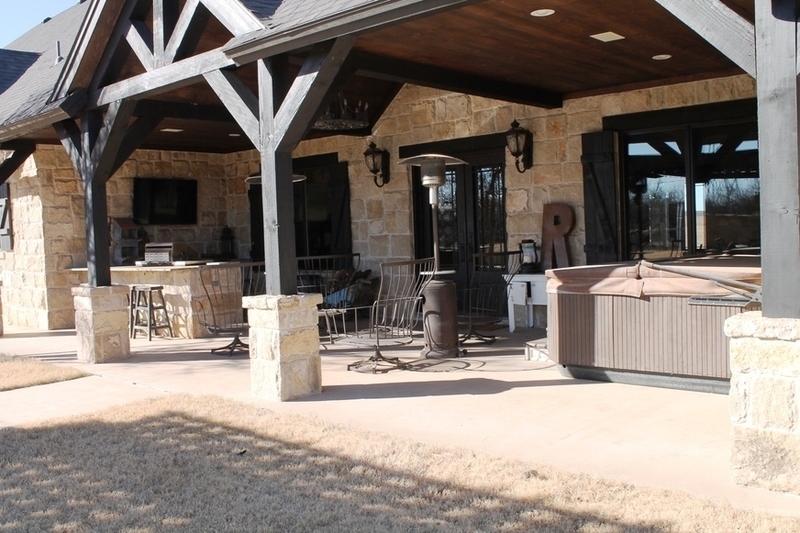 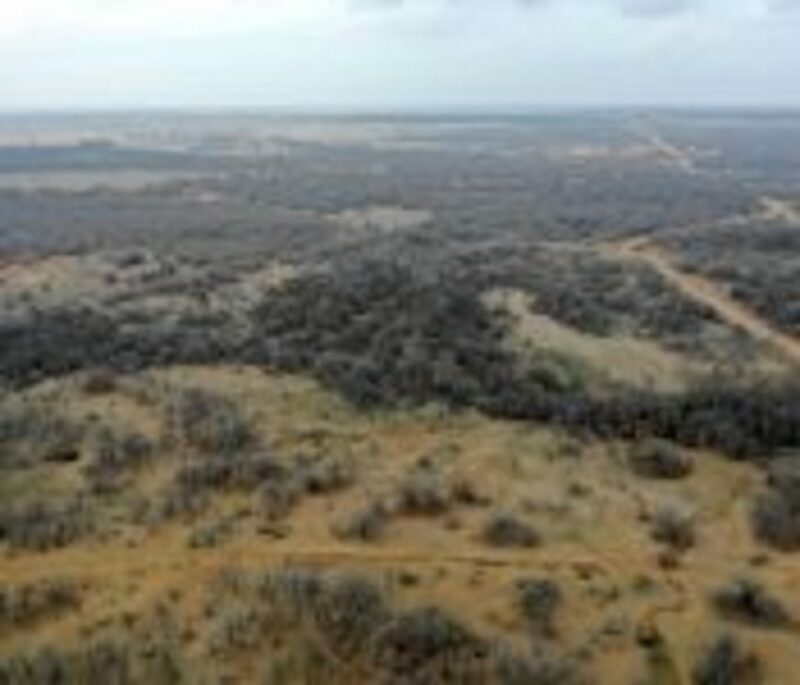 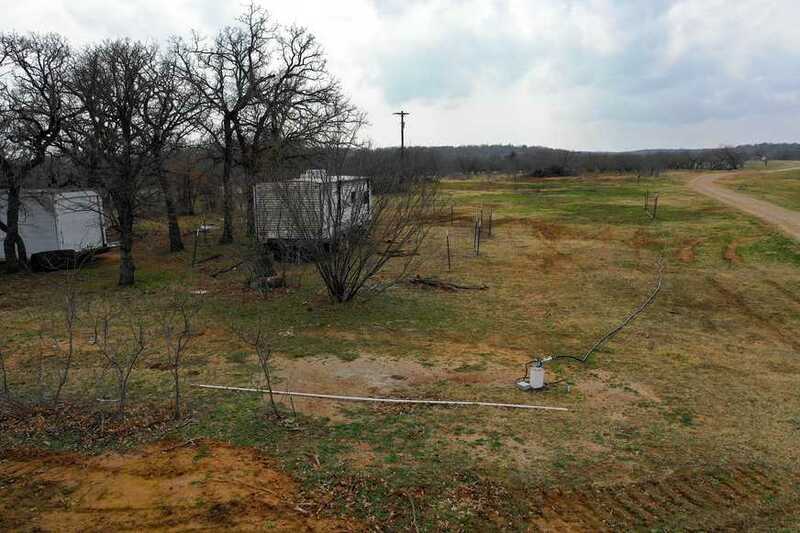 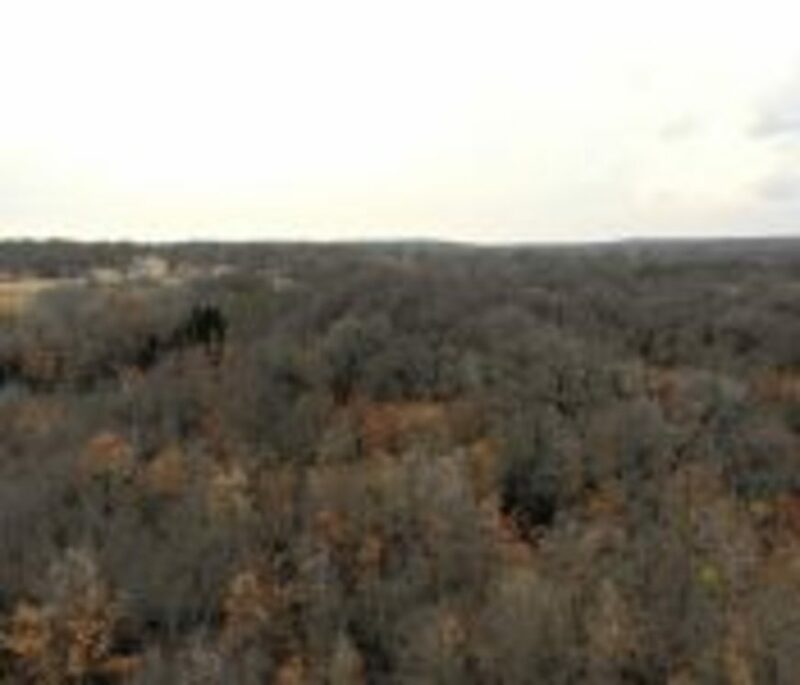 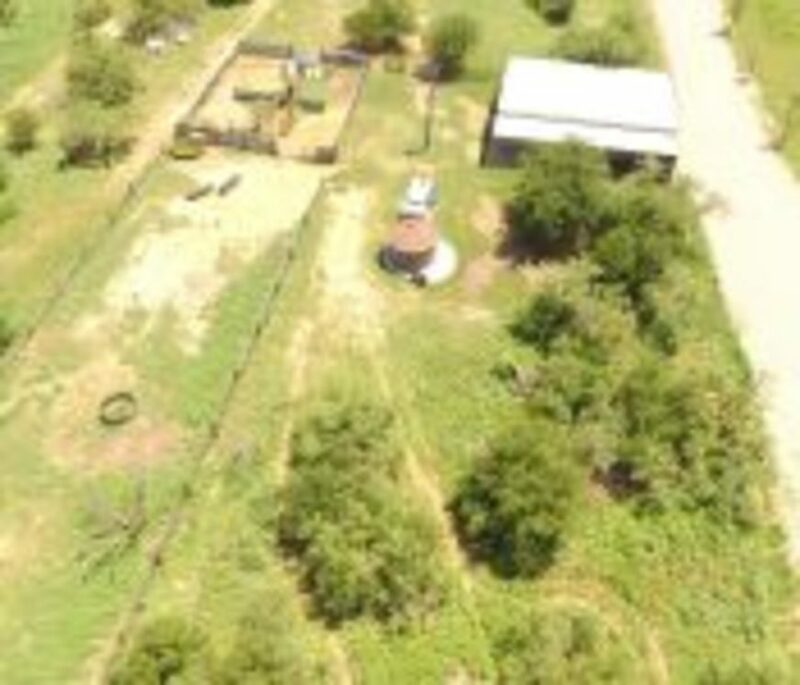 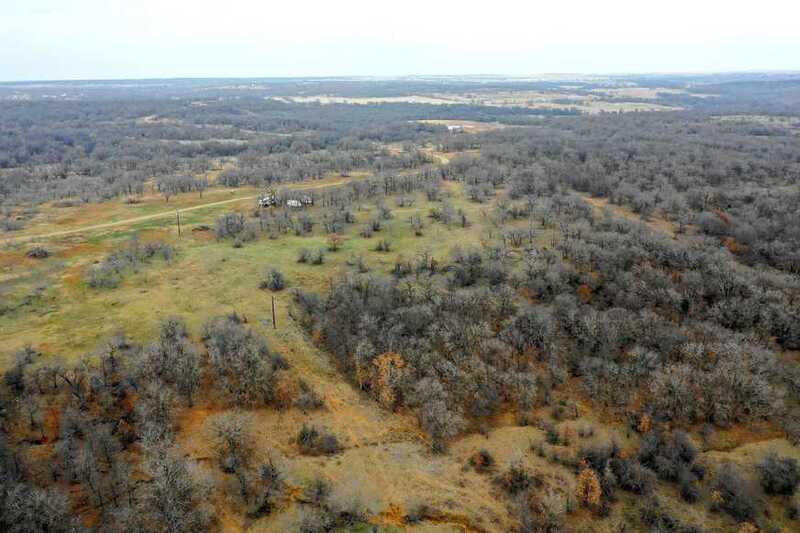 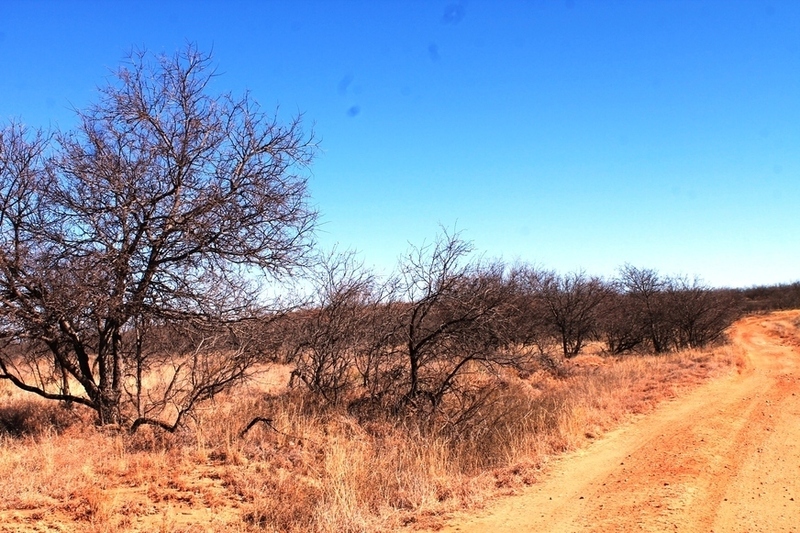 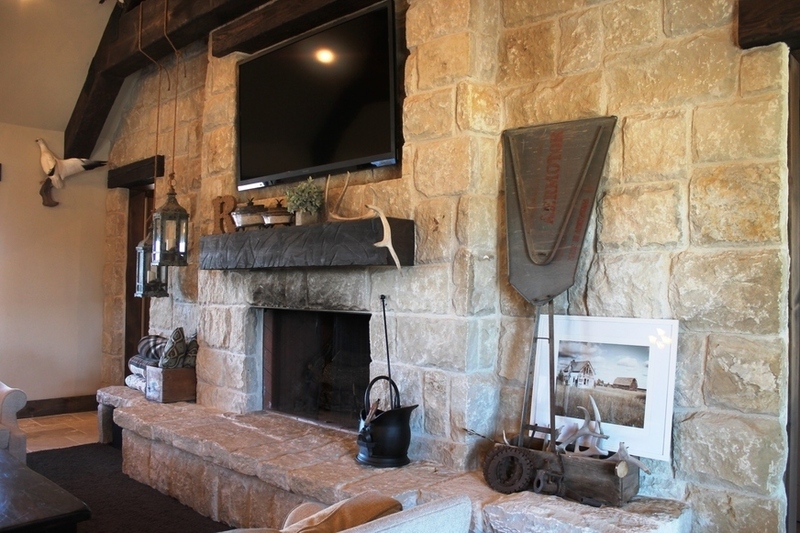 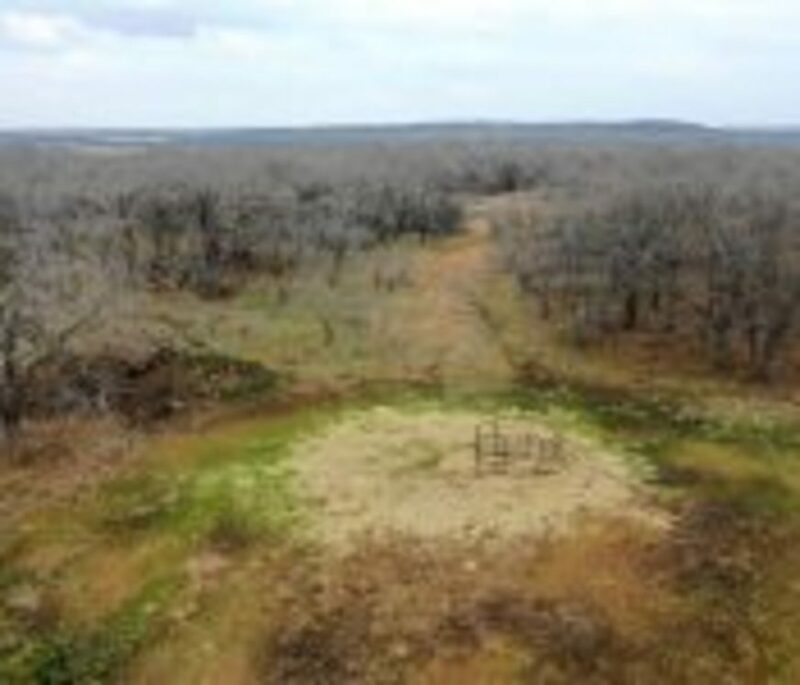 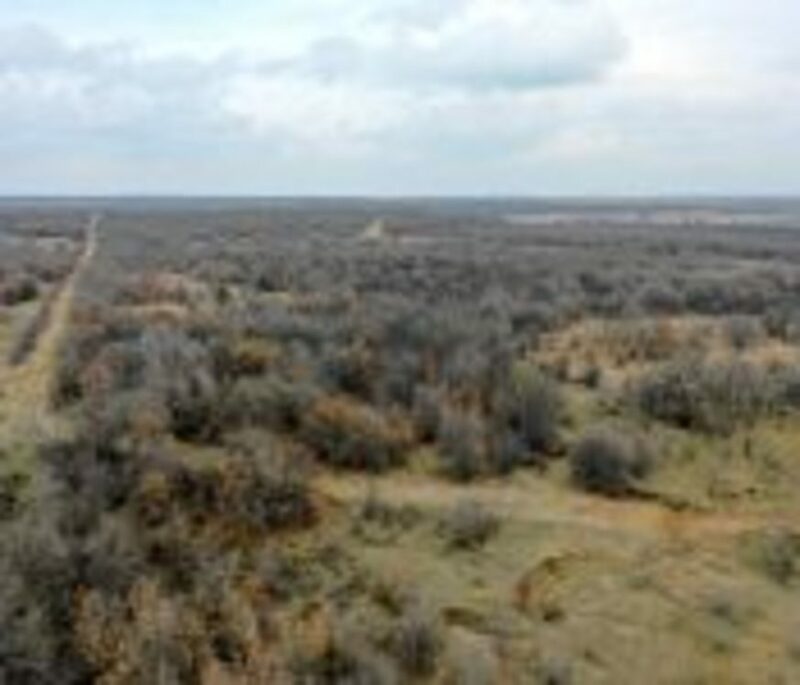 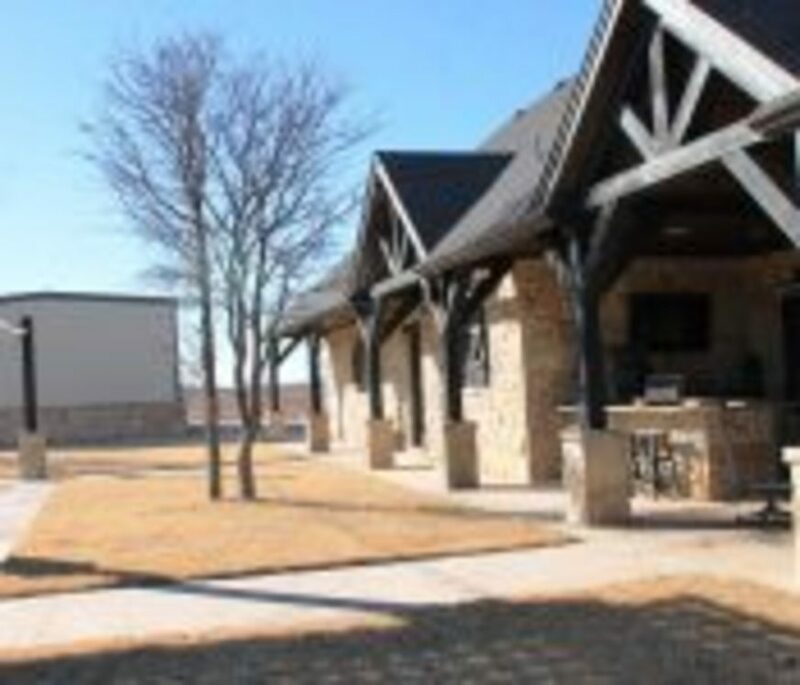 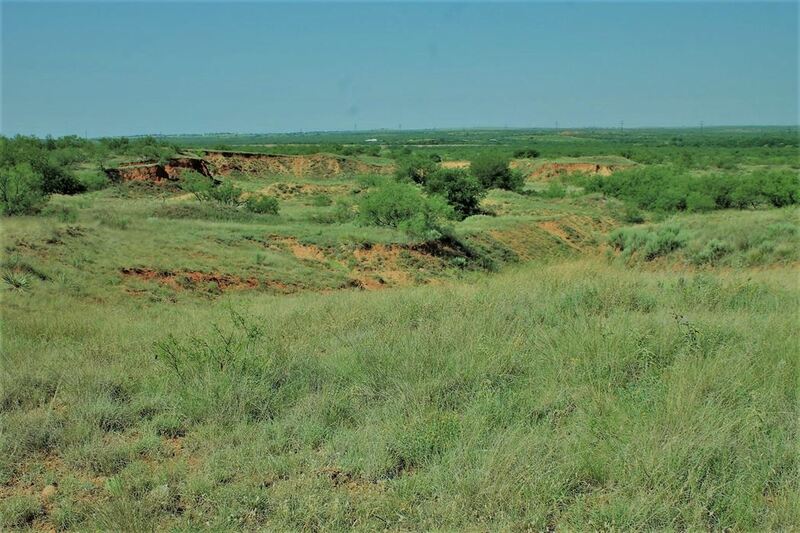 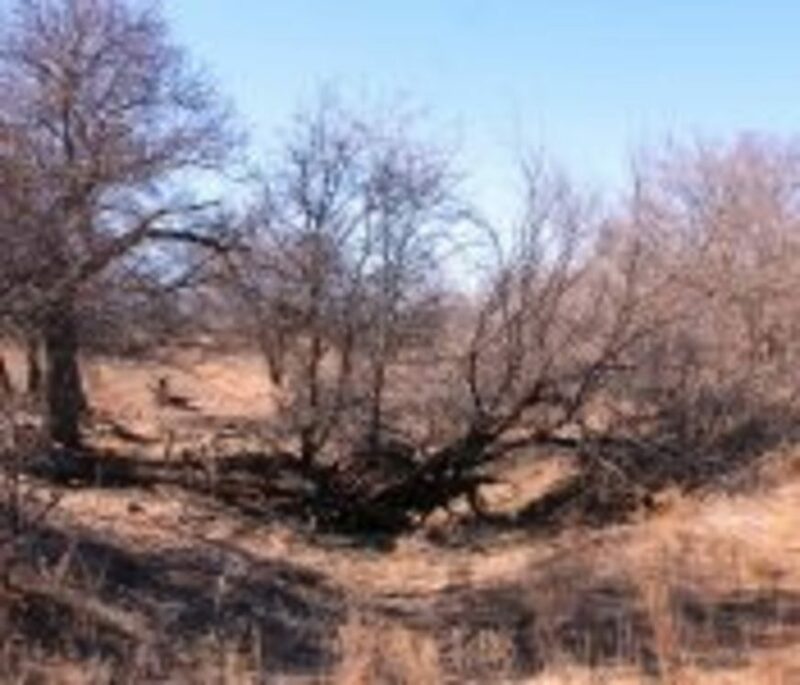 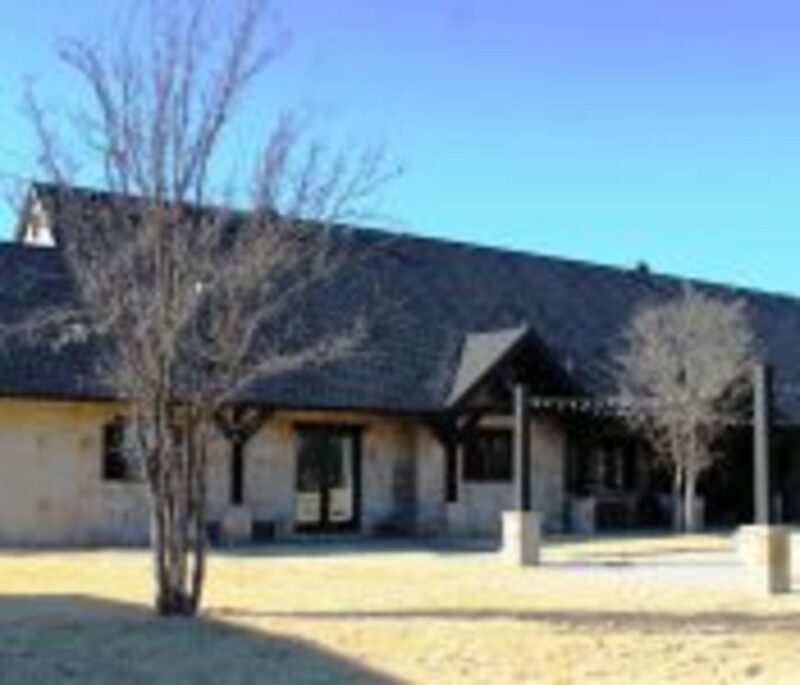 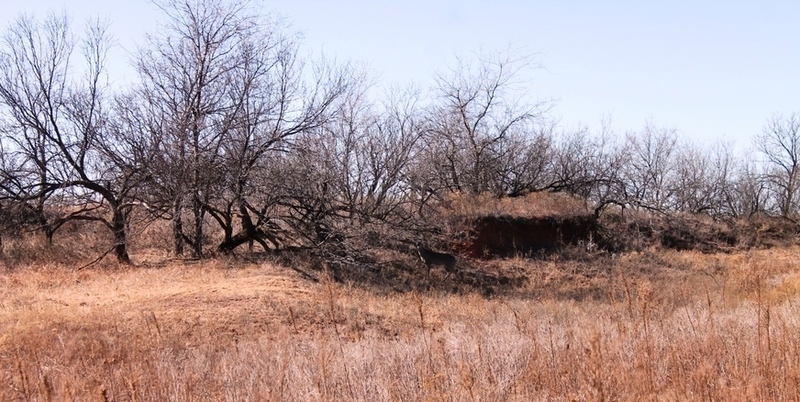 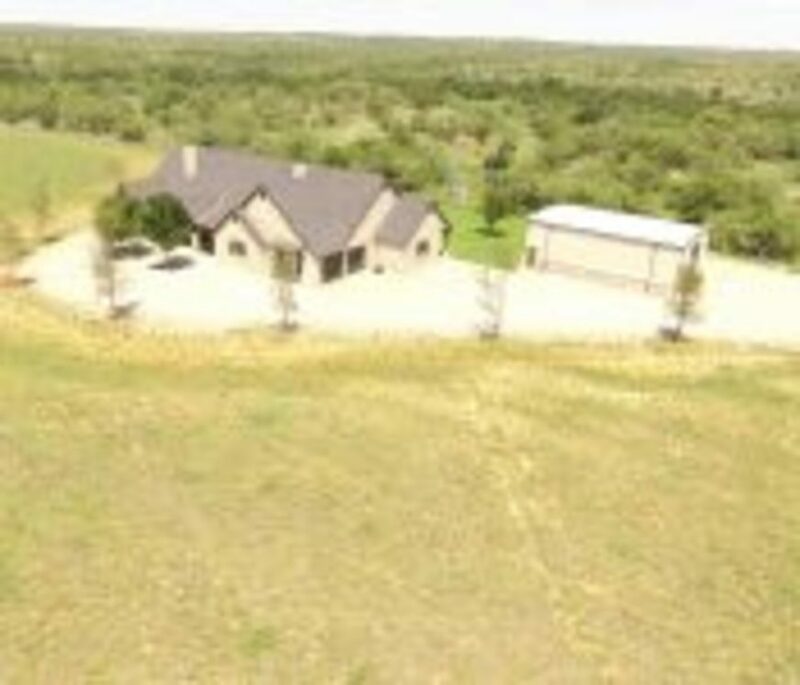 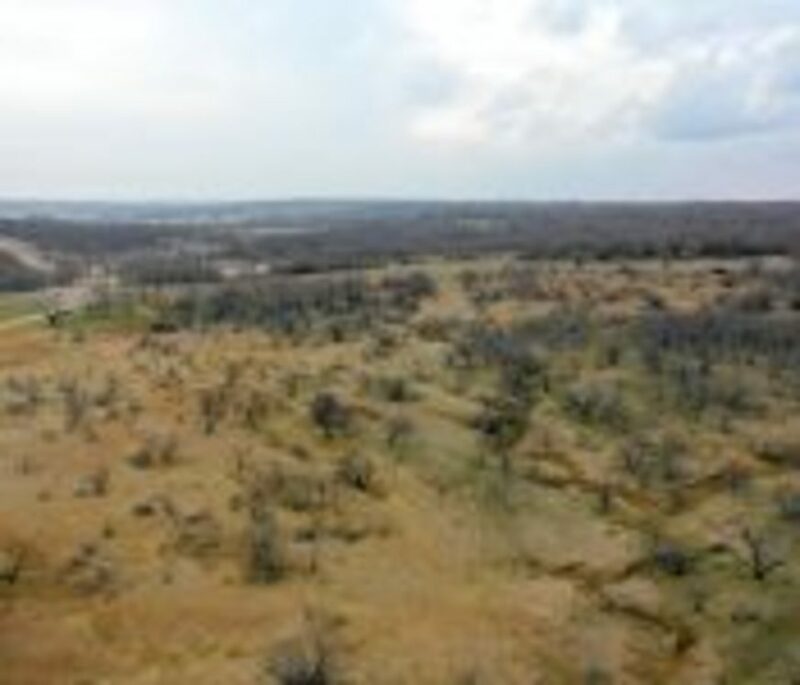 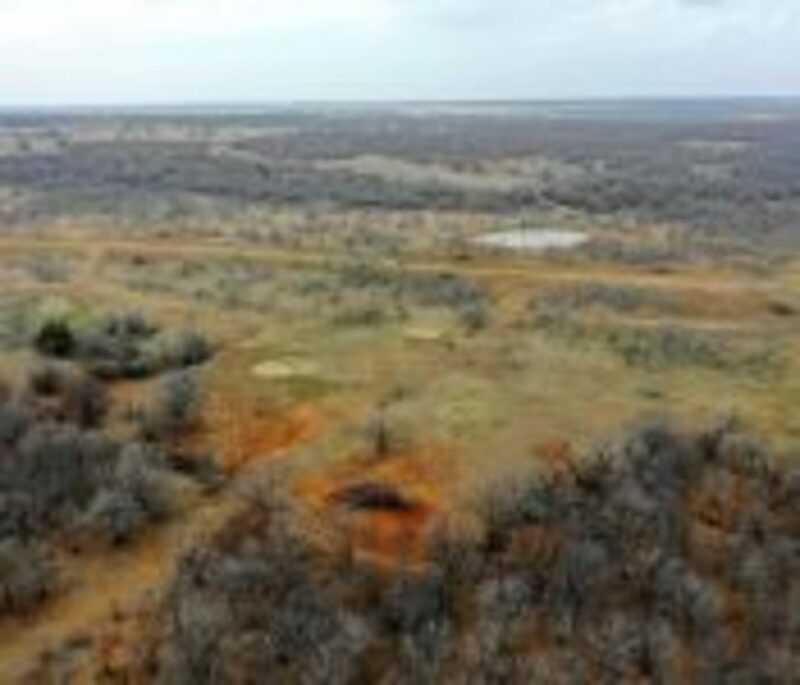 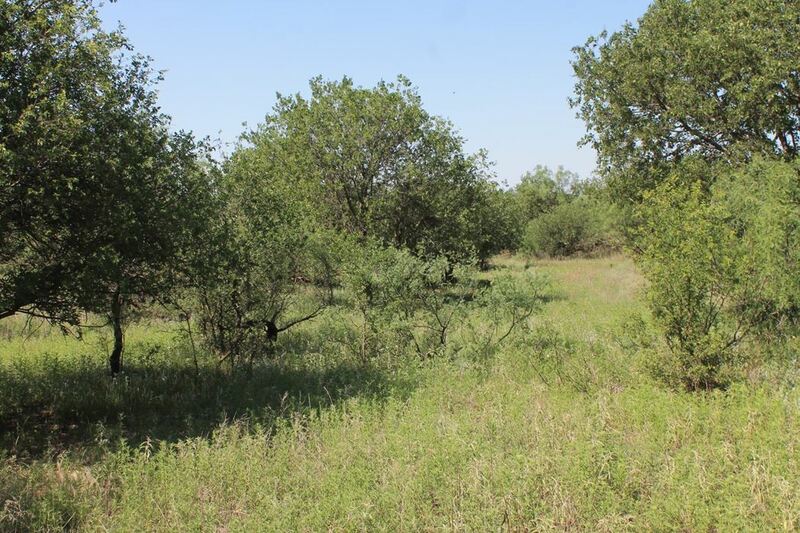 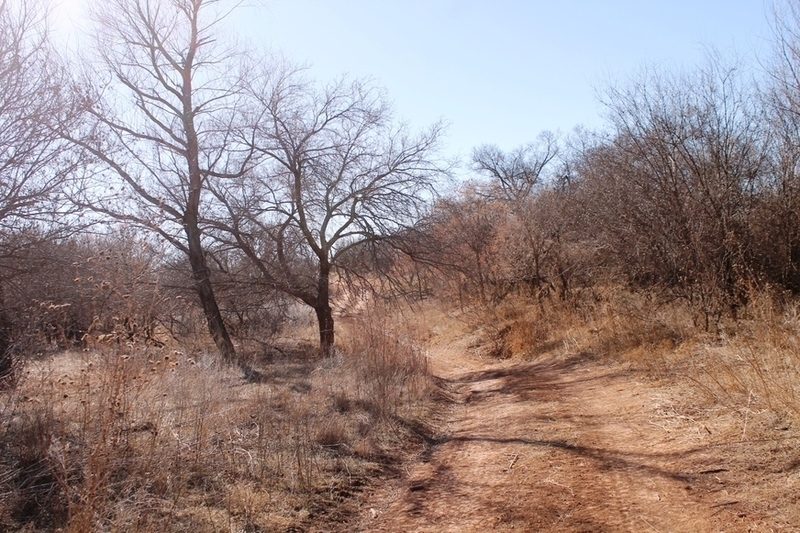 This property is a premium North Texas recreational, hunting, and cattle ranch!! 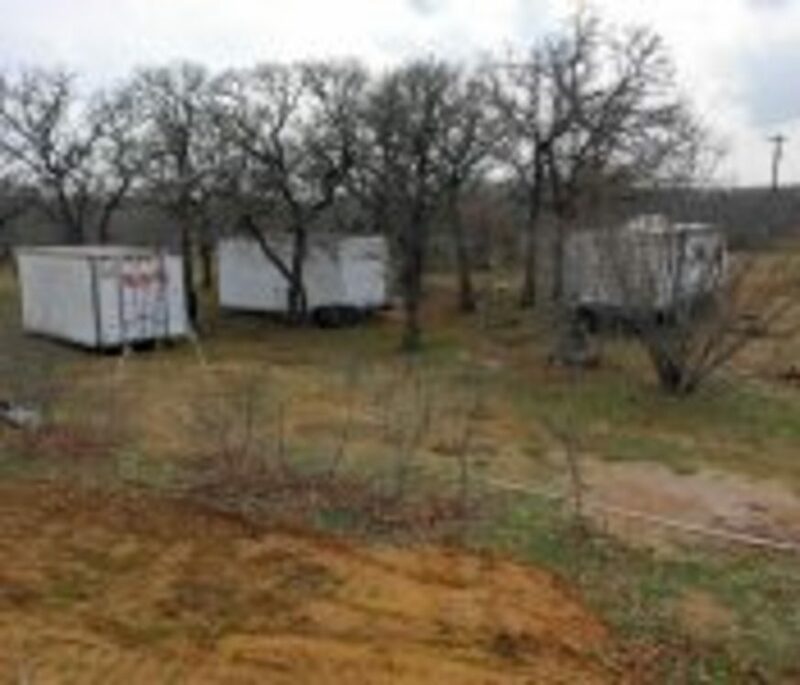 Location: Easy driving from the DFW area about 1 1/2 hours or 100 Miles. 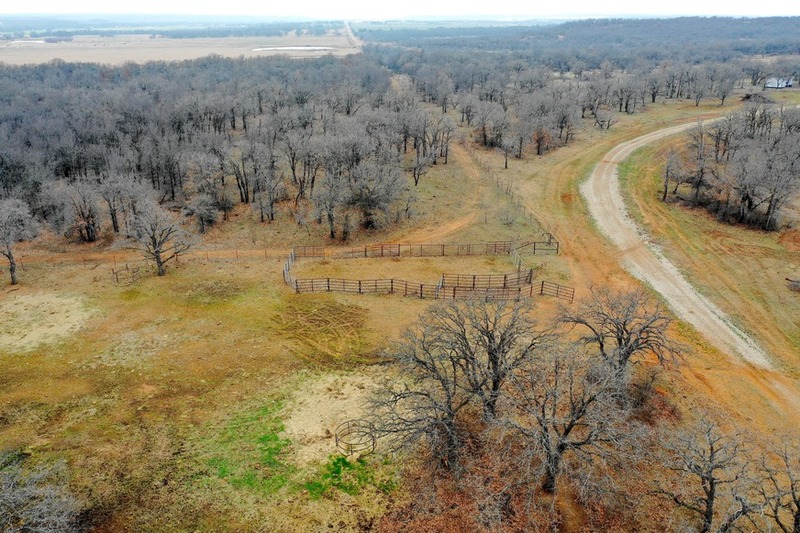 South of Henrietta East of Fm 148, south of about 4.5 Miles on Prospect road (west side of Lowell Scott Road) on the north side of the road at wide/inset double gates. 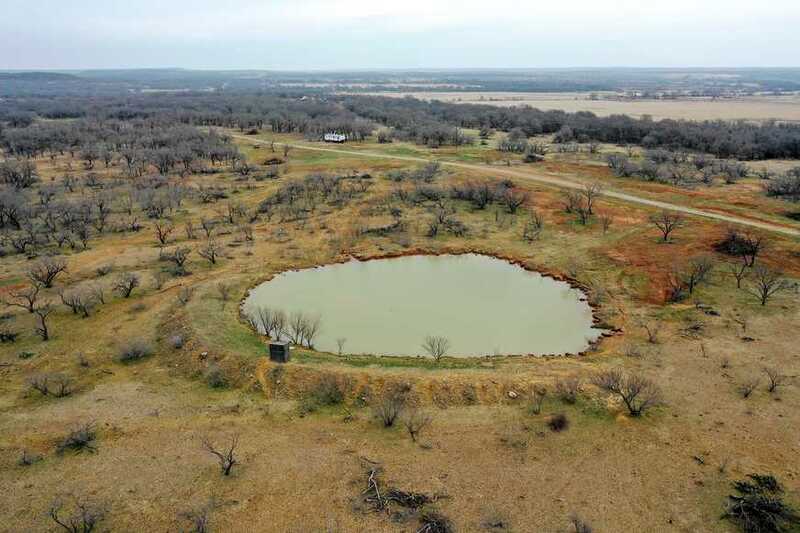 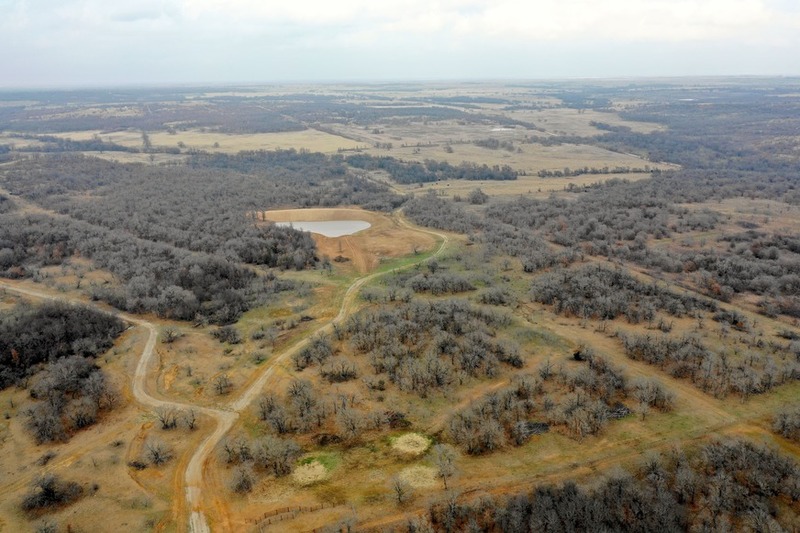 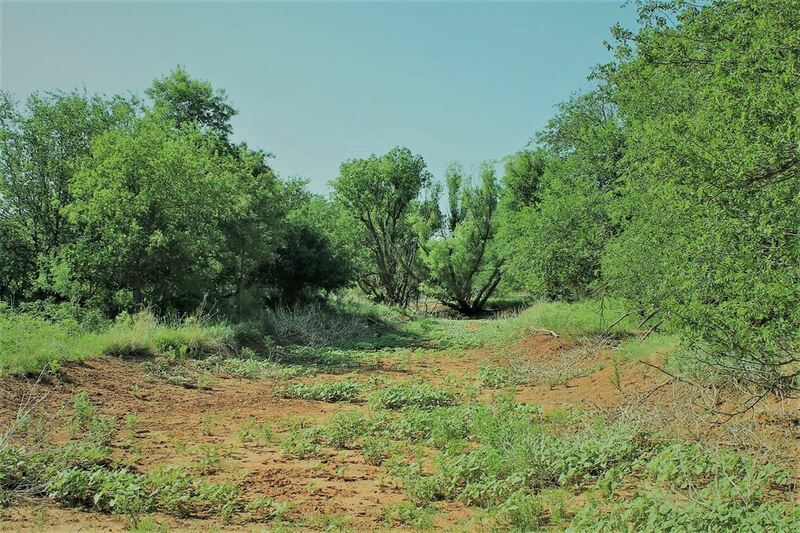 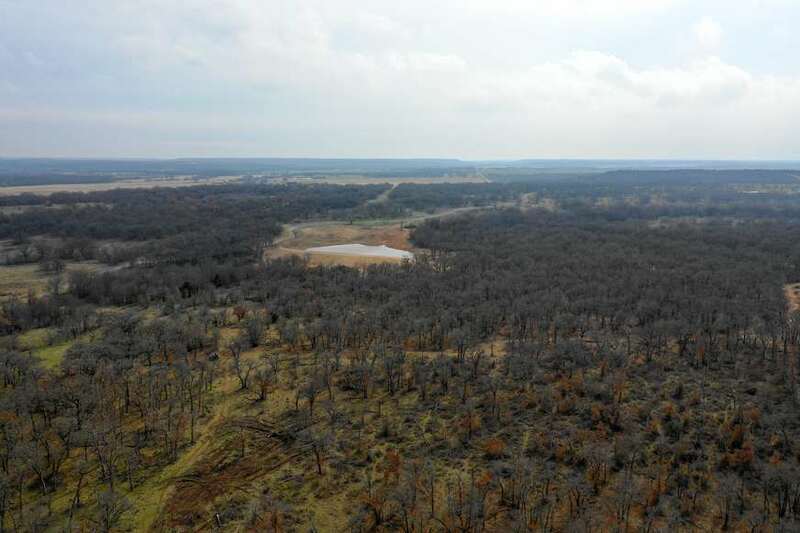 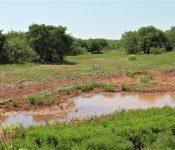 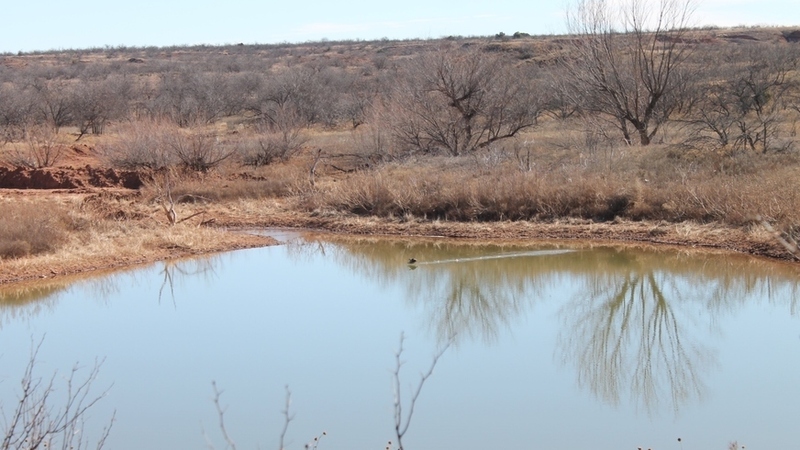 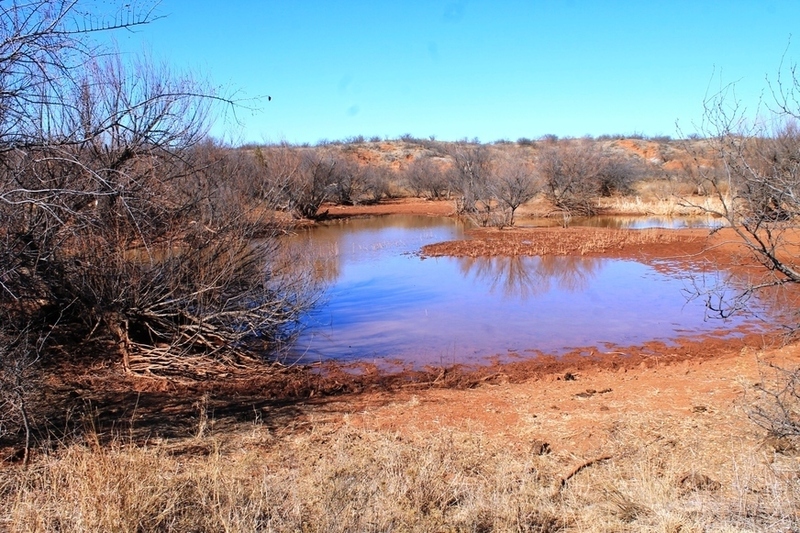 New Improvements: The property has improved the interior road structure, built new fences, a stock pond that is approximately 3 acres in size and a water well that can provide water for cattle and to the hunting camp. 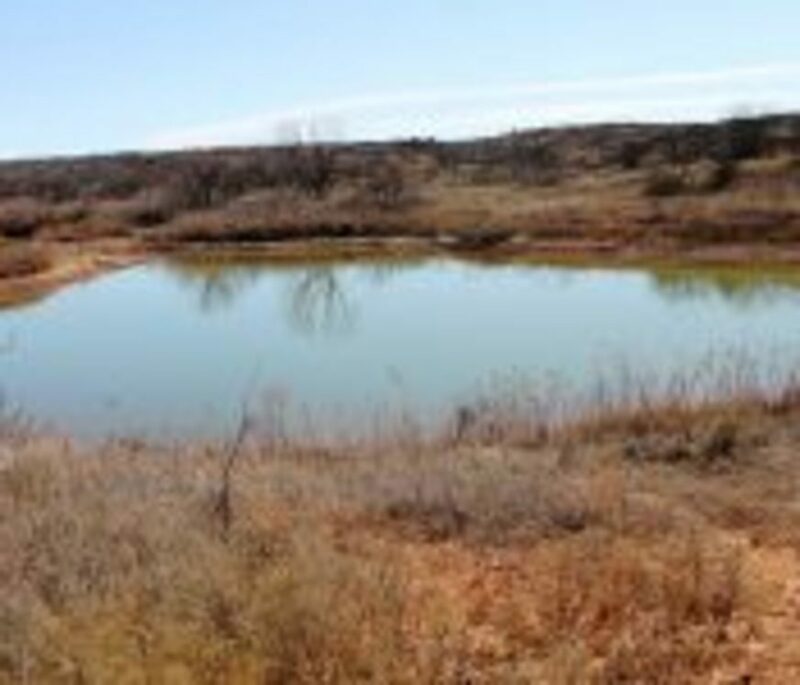 This pond has a depth of 12 ft near the dam side of the pond. 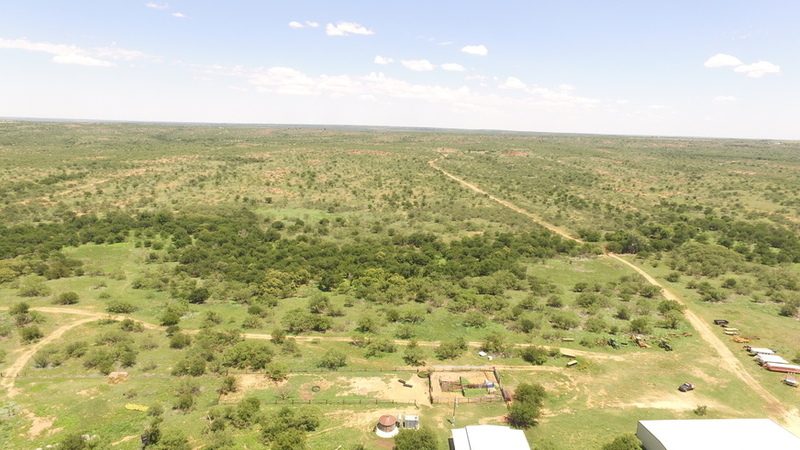 Ranching: This area of the county has sustainable grass for cattle and should run 15 acres per cow in a normal year of rainfall. 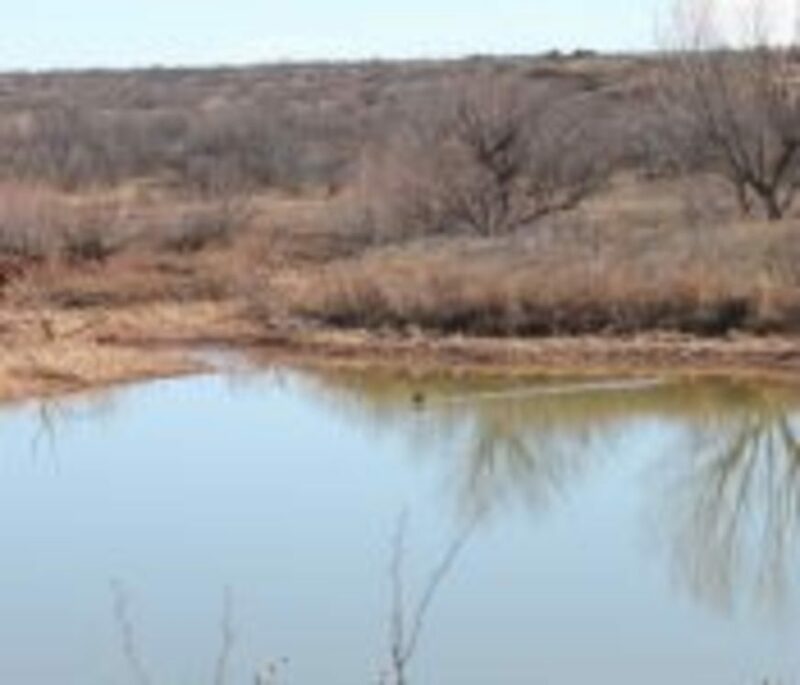 There are 2 stock tanks on the north portion and one on the south. 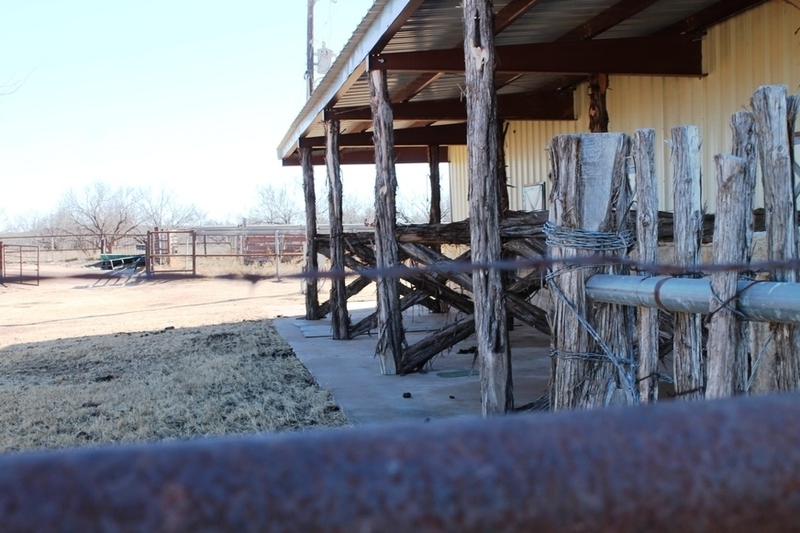 Fences are new along the road frontage with a fantastic double square tubing constructed gate system that is inset to allow trucks to be off the road. 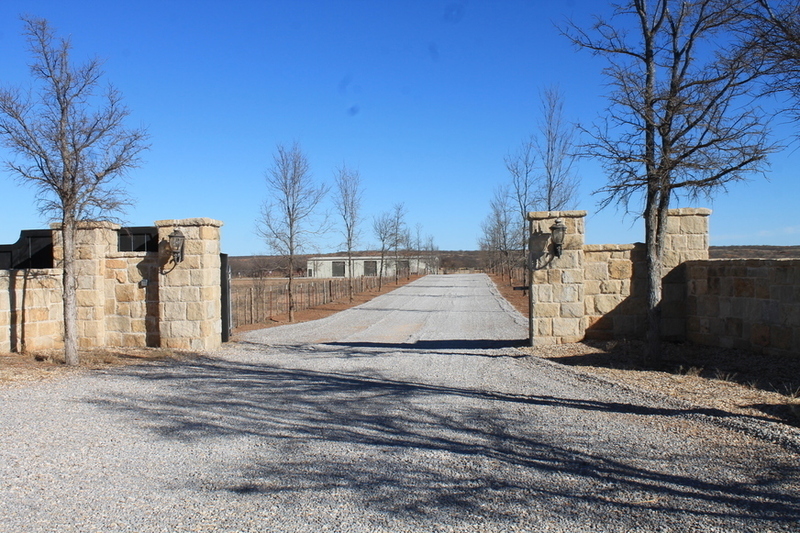 The north gate also has a swing gate near it to allow punching cows across the road to the other property gate. 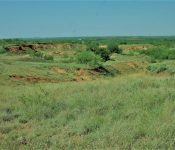 Some neighbors have planted wheat, and /or coastal which shows that the soil can support a hay crop. 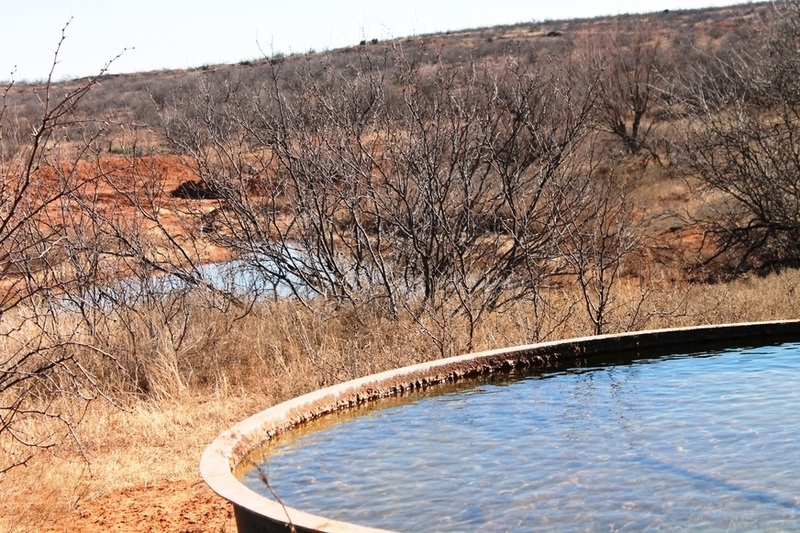 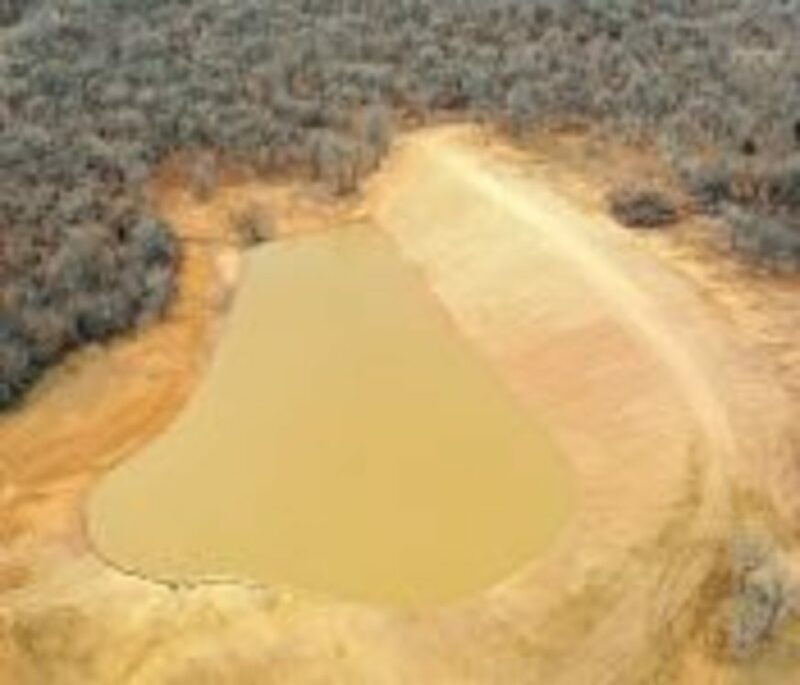 A WATER WELL RECENTLY INSTALLED CAN PROVIDE WATER FOR CATTLE DURING DROUGHT CONDITIONS. 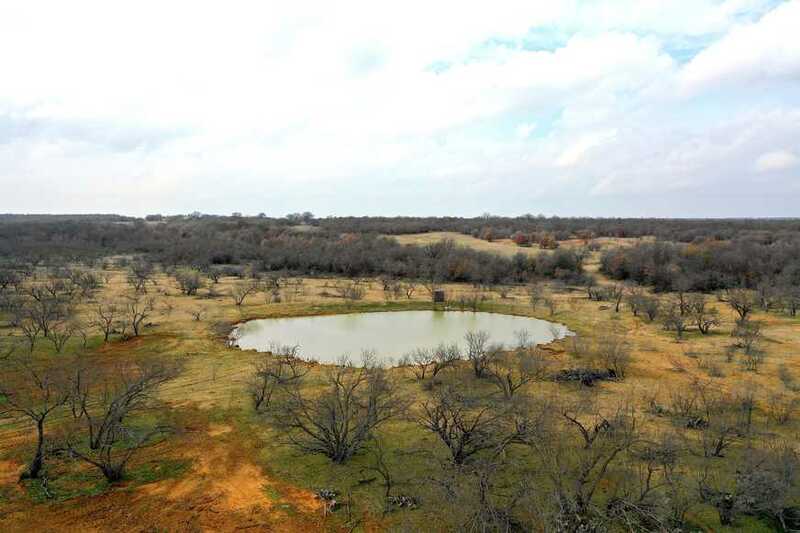 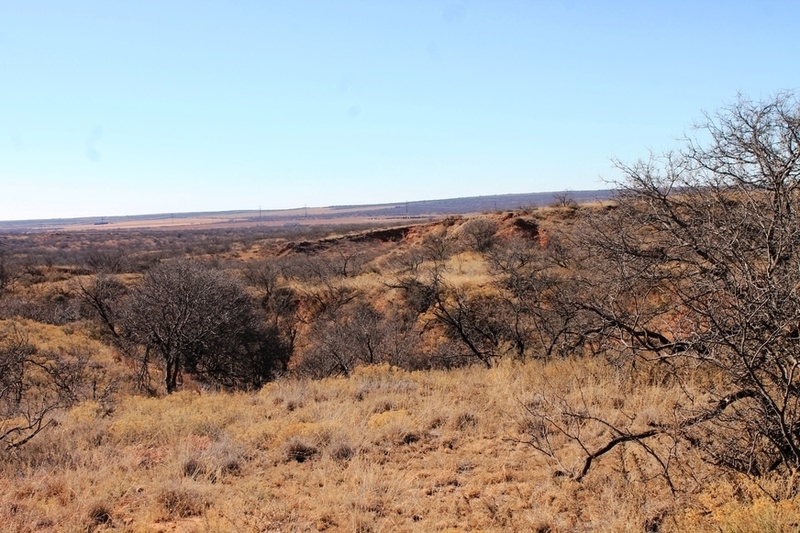 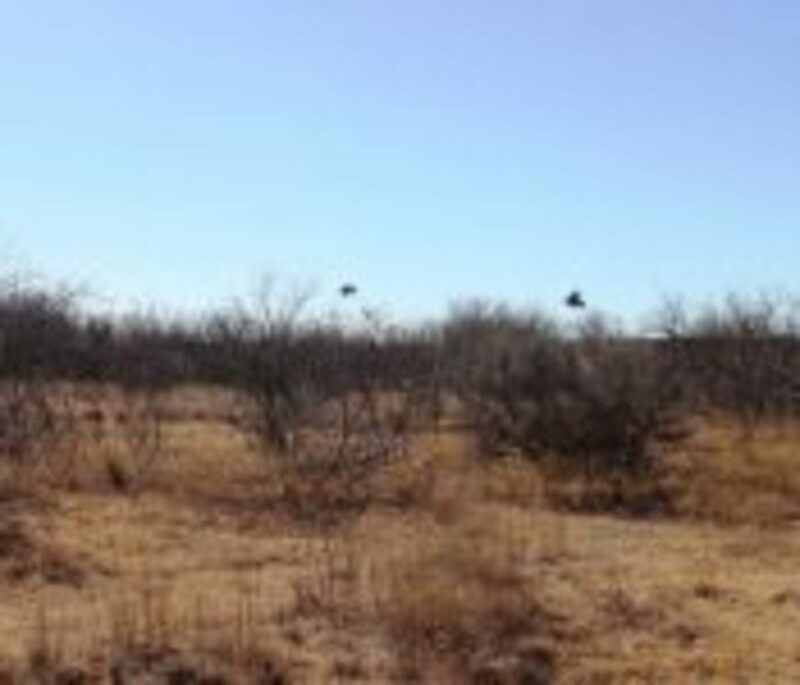 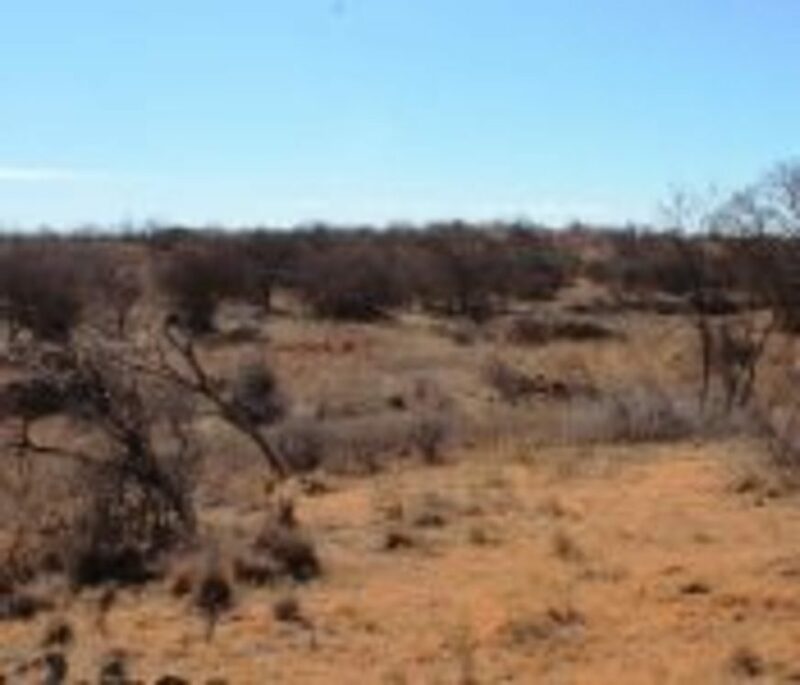 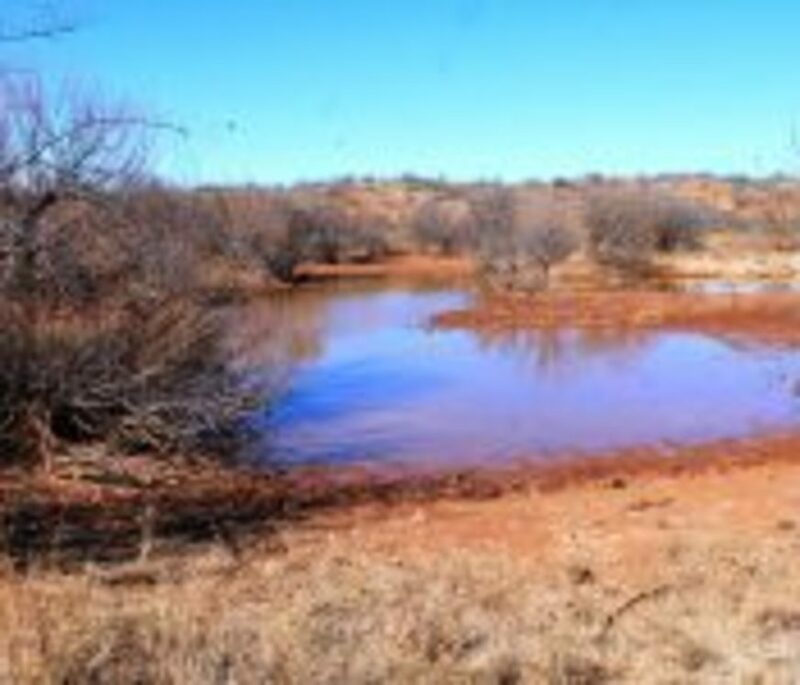 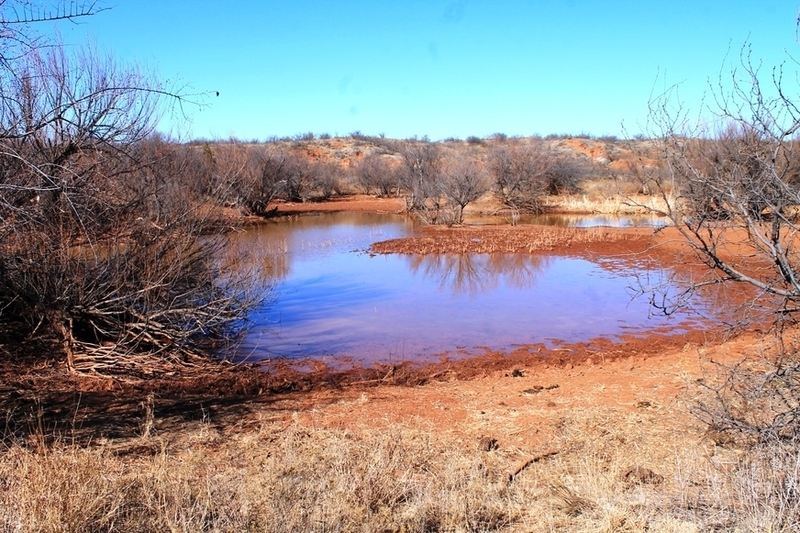 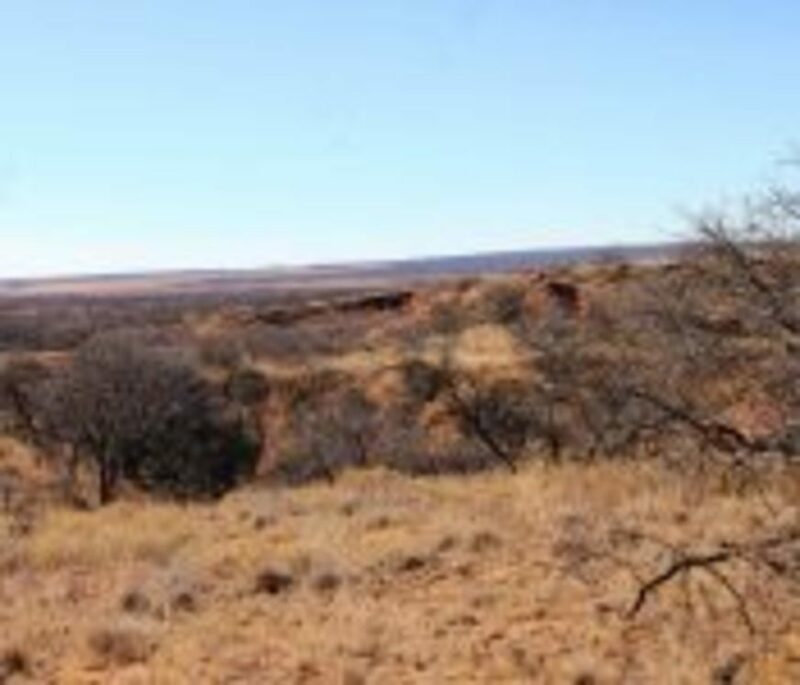 Wildlife: This Ranch is an excellent property for hunting. 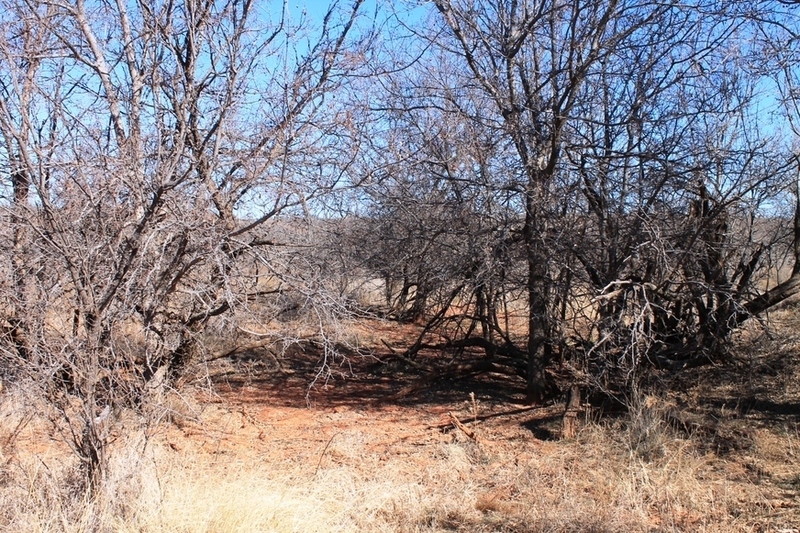 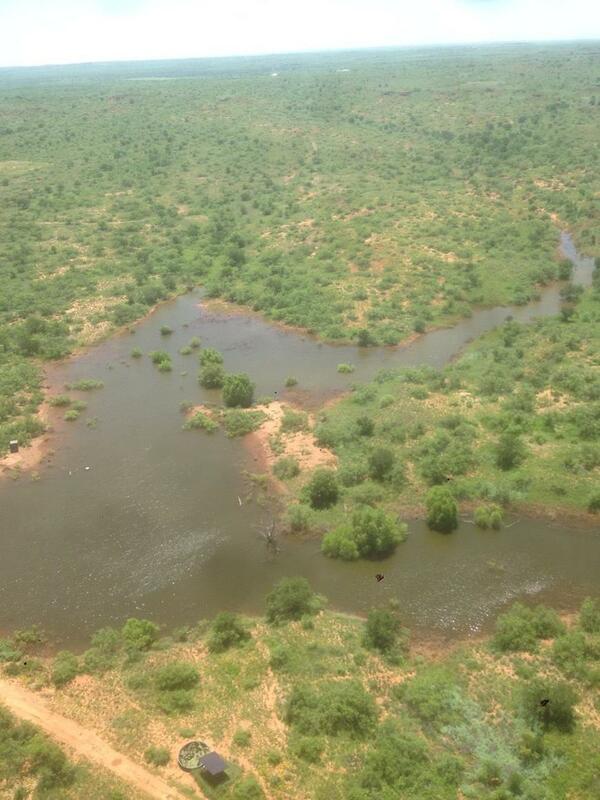 Plenty of cover along with lots of water and vegetation is a prime area for wildlife. 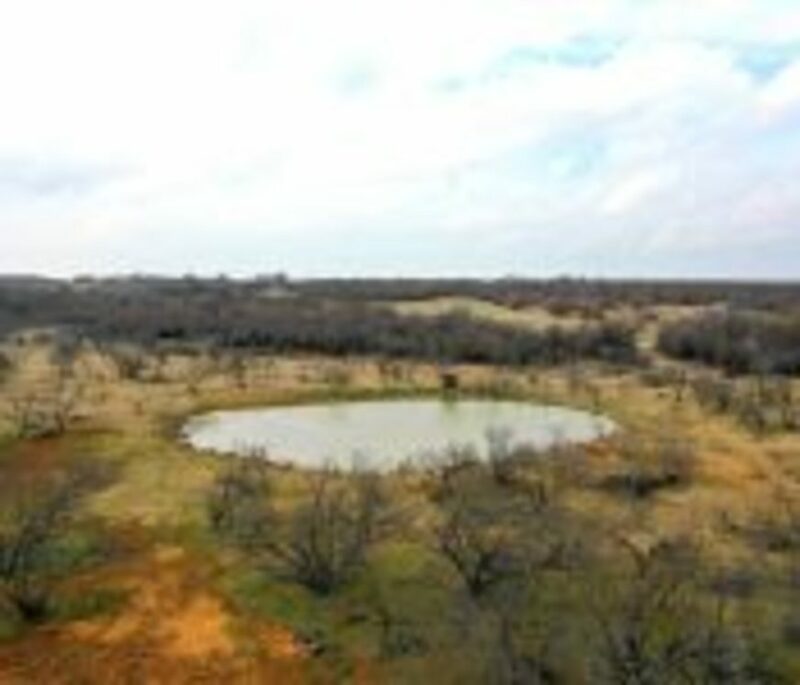 Wild Hogs, Dove, Quail, Ducks, and Turkey can all be found on the property. 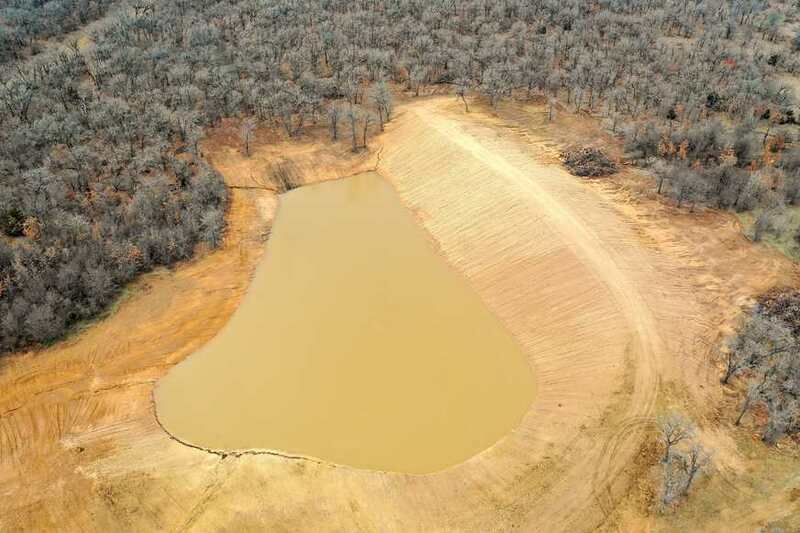 Water: There are three tanks. 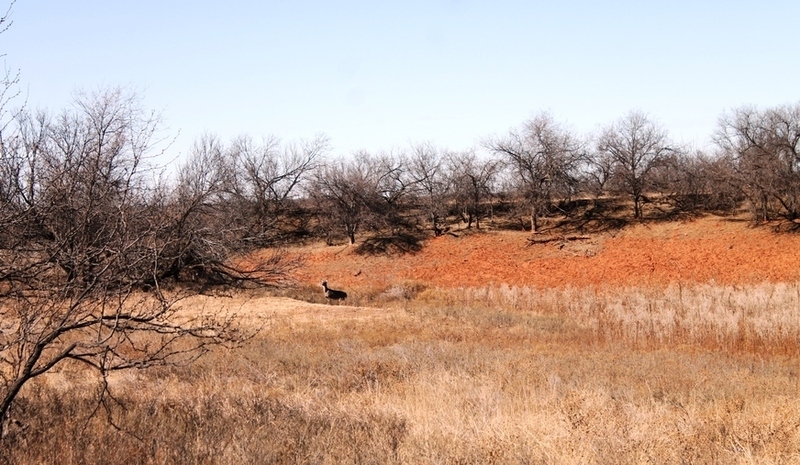 Two of them are just above average size and the other one is smaller. 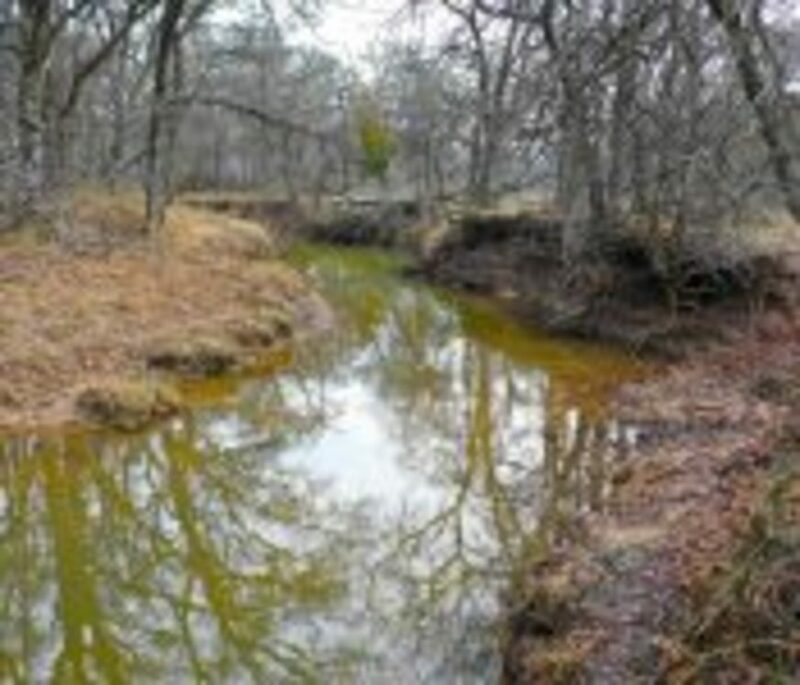 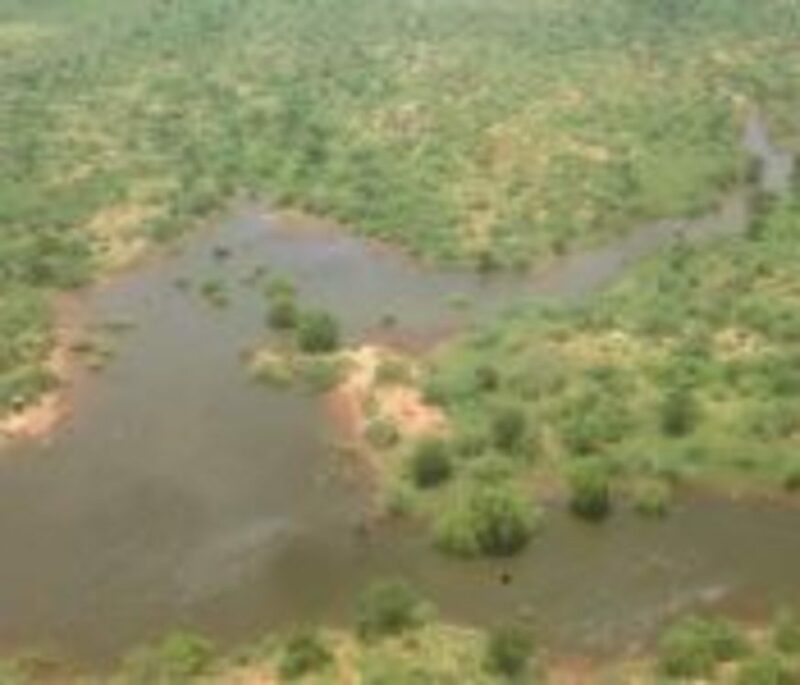 There is one large creek bed that runs across the North West corner that runs deep water when there are rains of 5+ inches hit because of the type of landscape around which has some changes in topography. 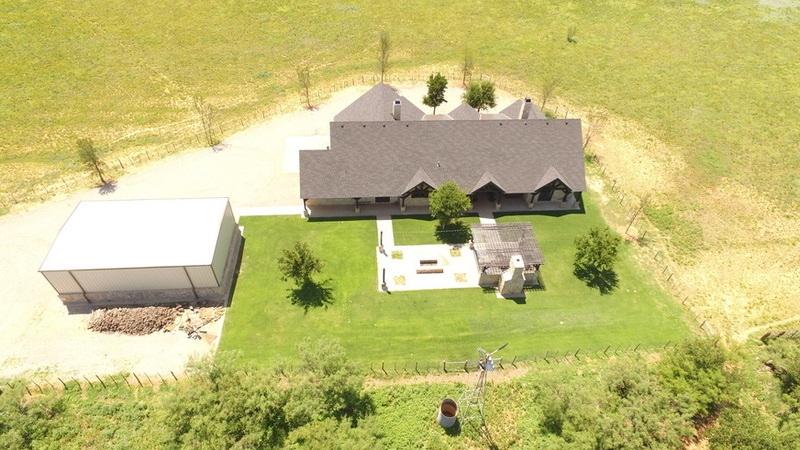 All the surrounding neighbors have a sustainable underground water supply for their homes. 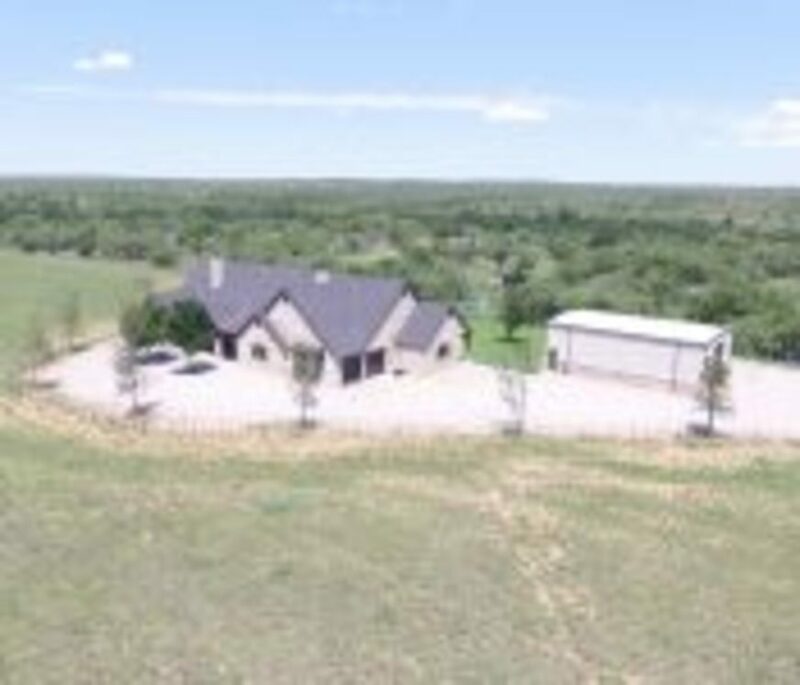 The largest home is a recently built 2 story home with more than 3,000 sq ft. on the east side of this property. 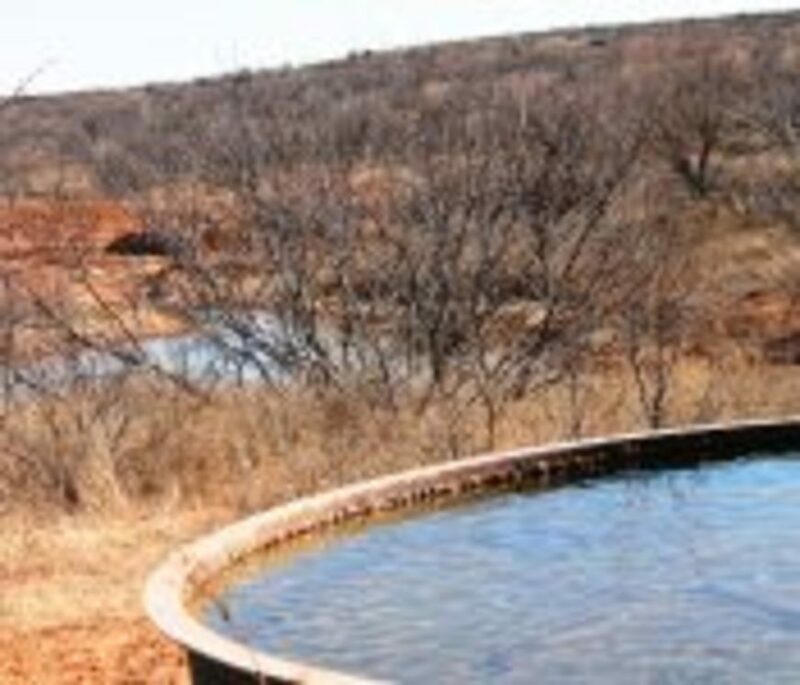 A NEW WATER WELL HAS BEEN DUG ON THE PROPERTY. 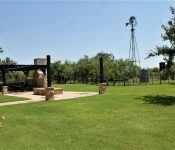 Community Facts: There is a convenience store about 5 miles north of the property with gas, cattle feed, meat & cold food for sale. 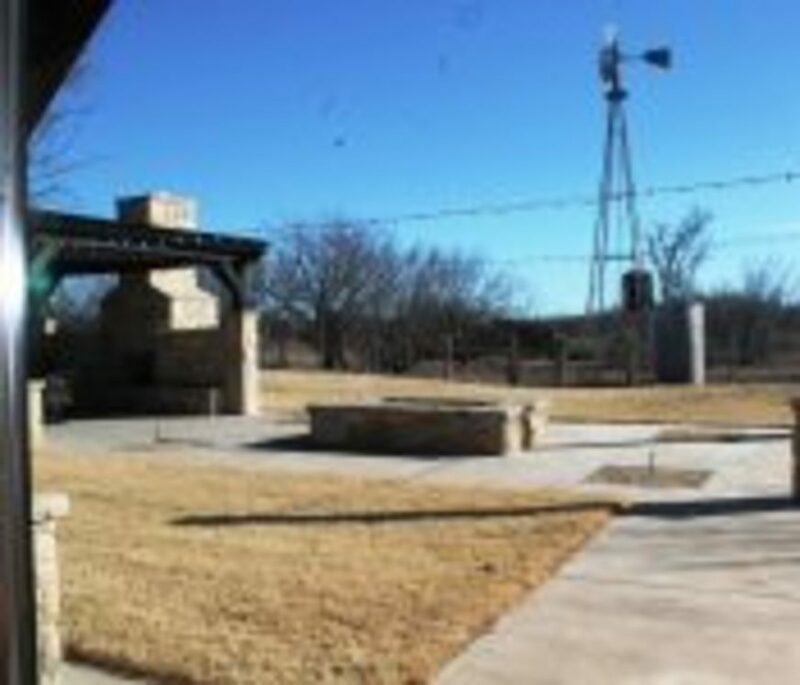 Newport is about a mile away for that has a fire station and church or up to Buffalo Springs for community events. 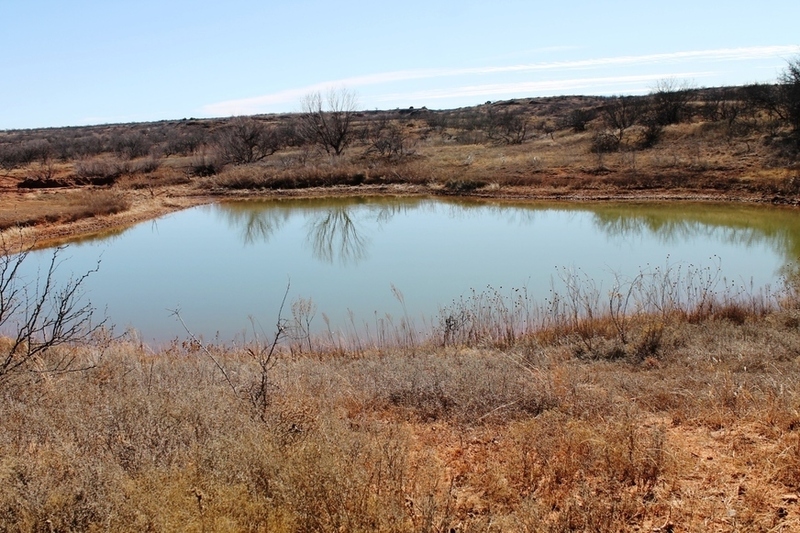 Bowie and Jacksboro are 12 miles and 15 miles respectively. 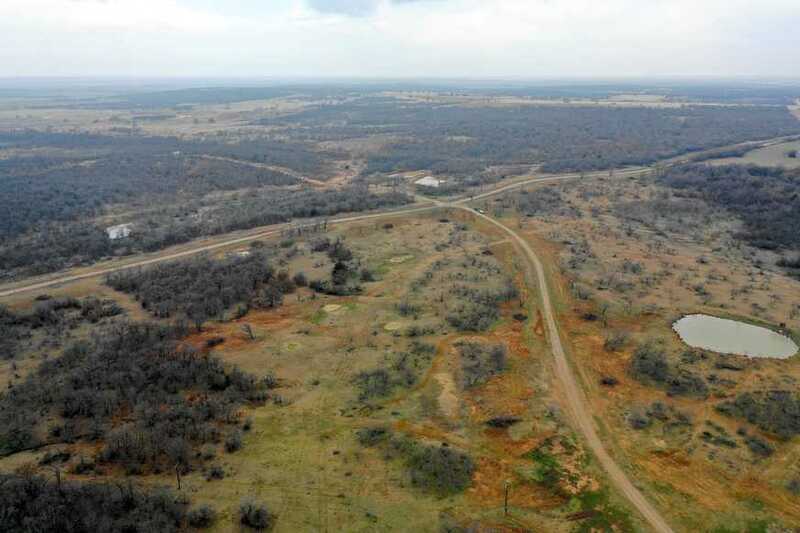 From Bowie Tx take HWY 59 south 11.5 miles to Newport TX, take FM 2127 for 7 miles to Post Oak, TX take the curve to the left and in 200 ft. turn right onto Chapel rd. 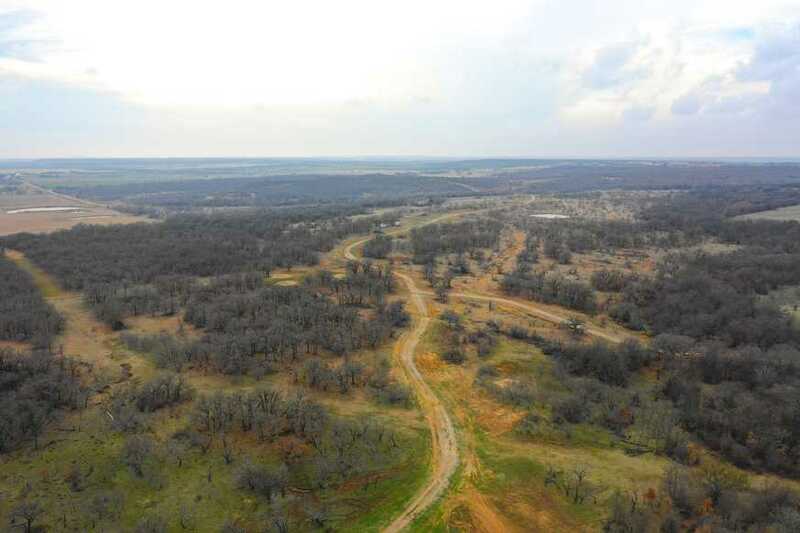 travel west 900 ft to Old Post Oak rd. 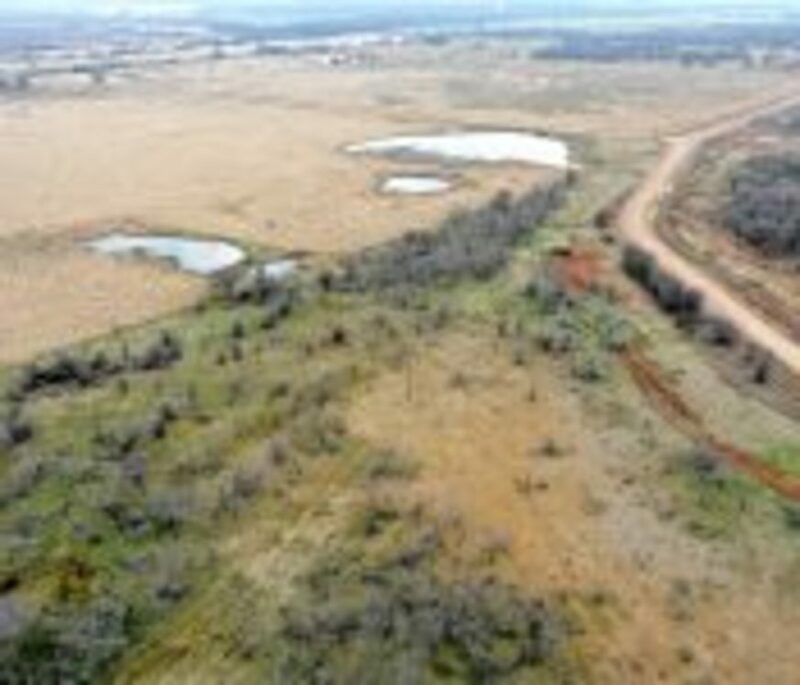 then turn North (right) travel 1 mile to the corner of Prospect rd and Lowell Scott Rd. 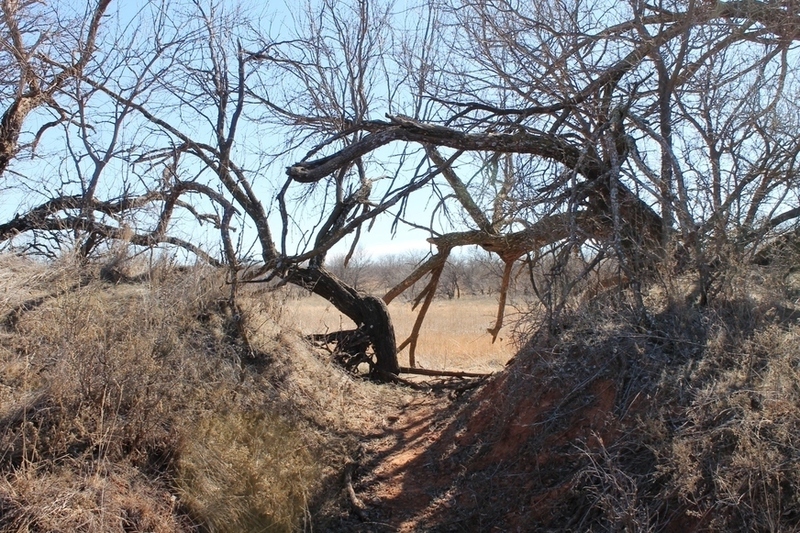 You can see the SE corner of the property from this corner. 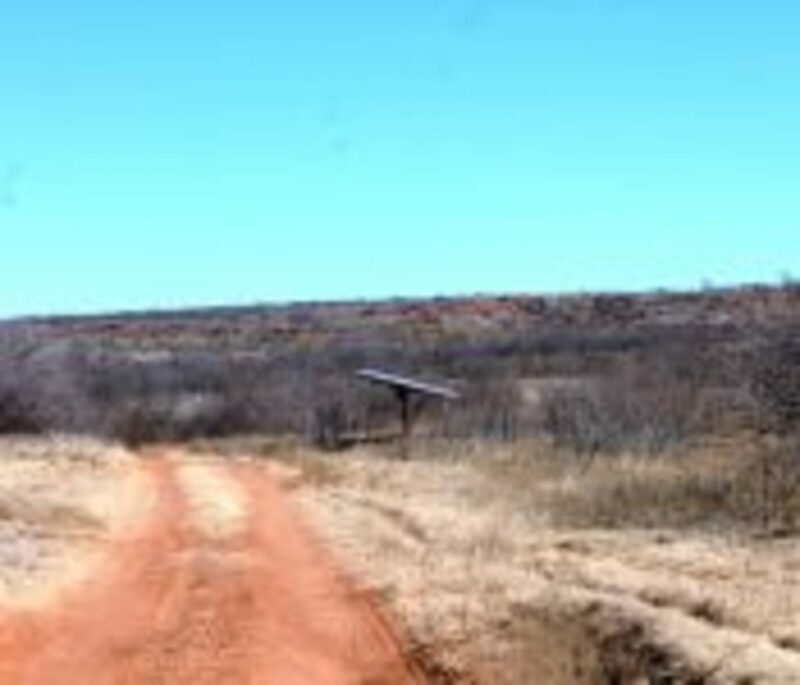 Travel NW .46 miles on Prospect rd. 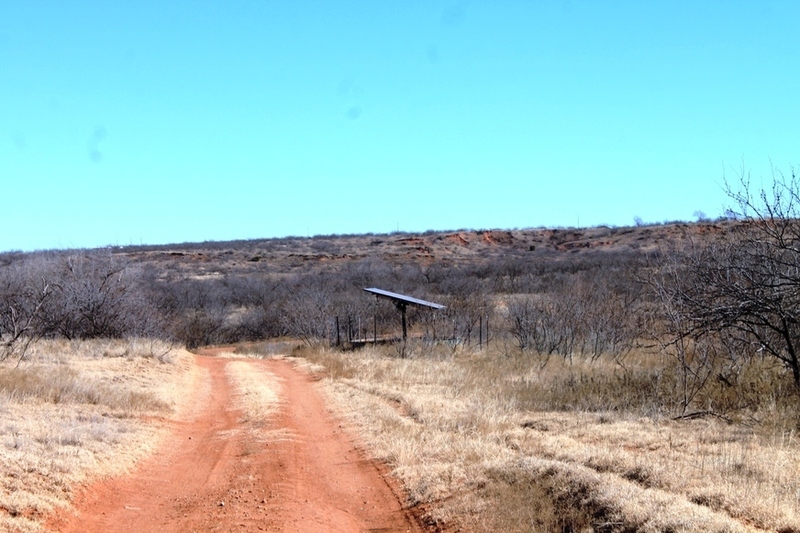 to the gate on the north side of the road which is a wide double gate. 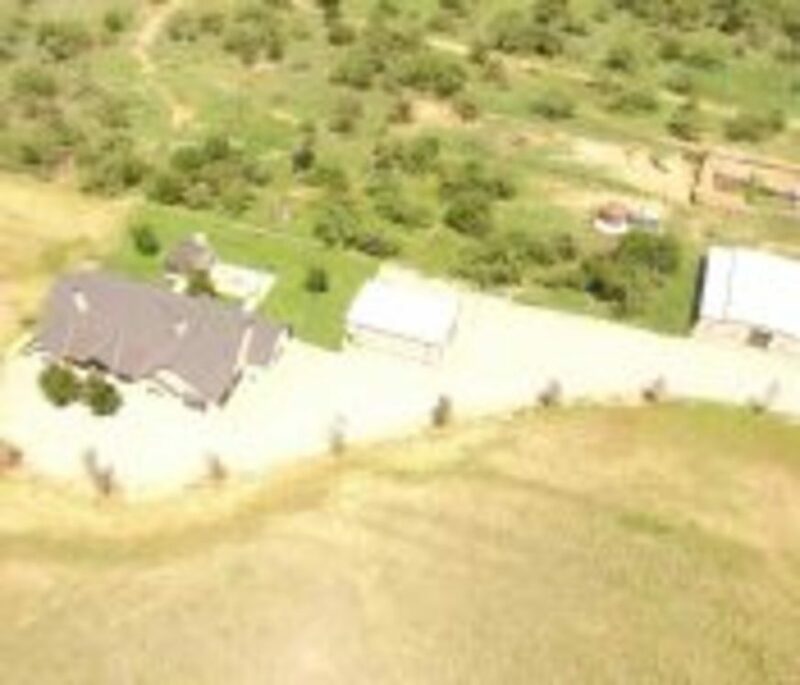 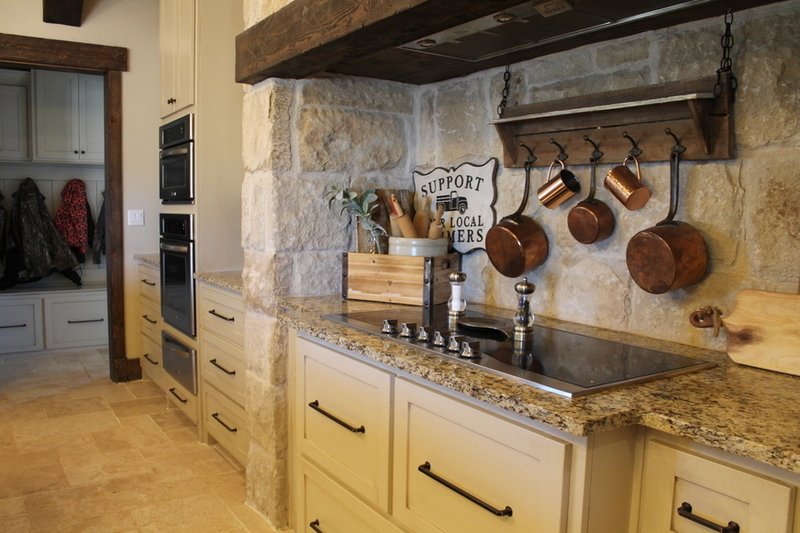 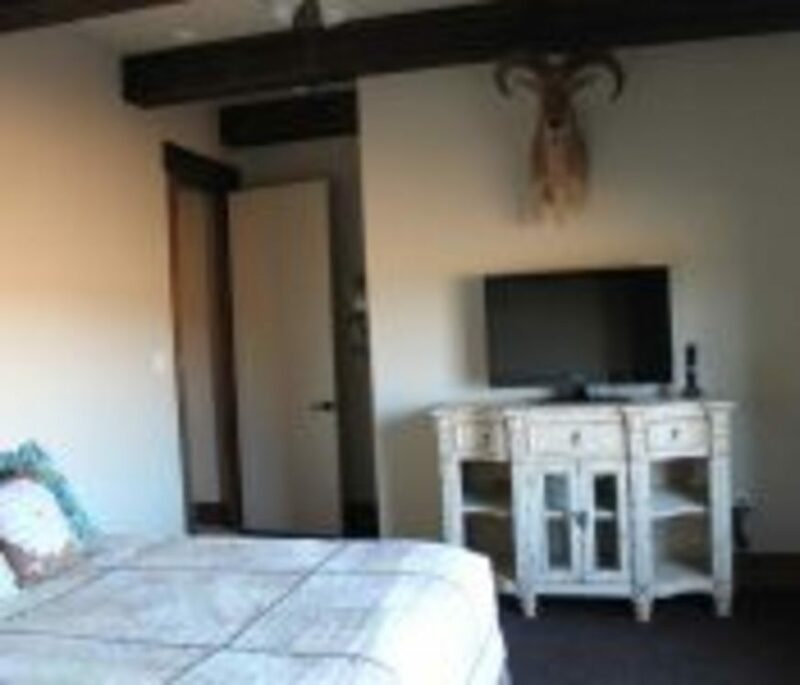 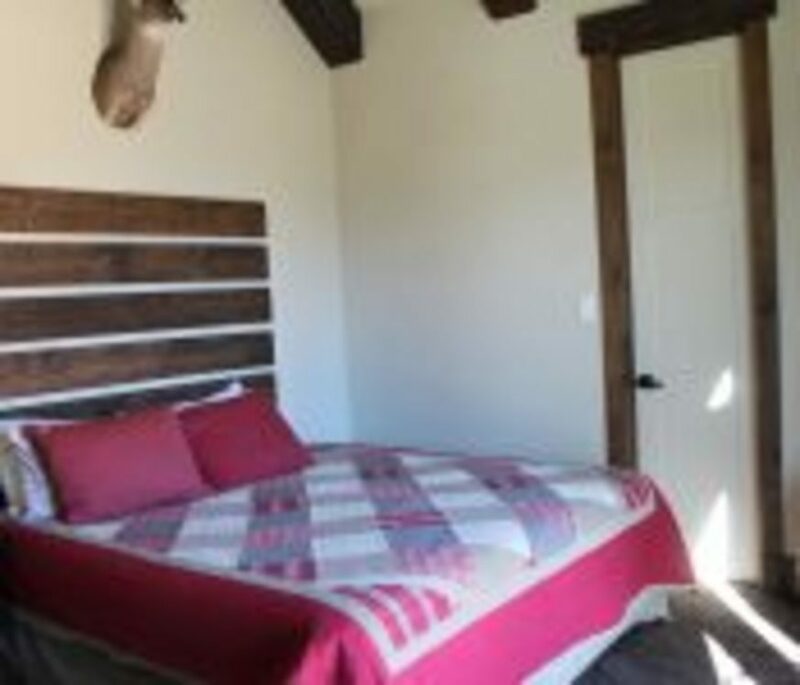 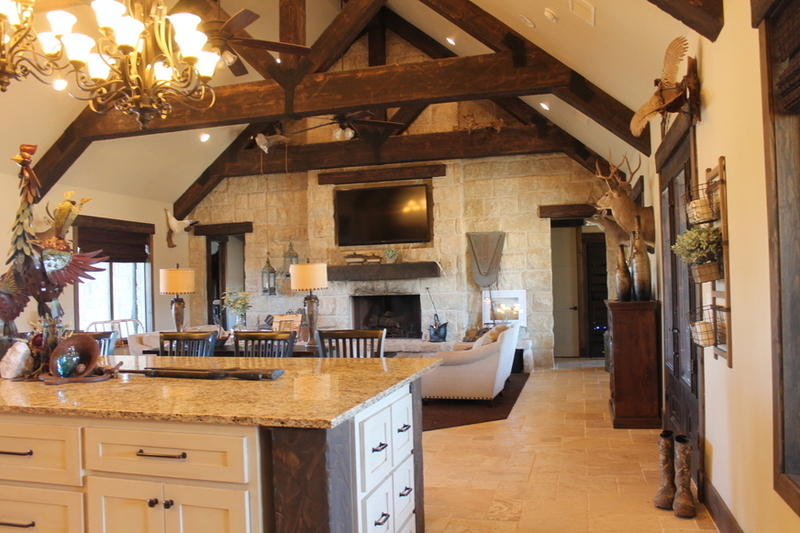 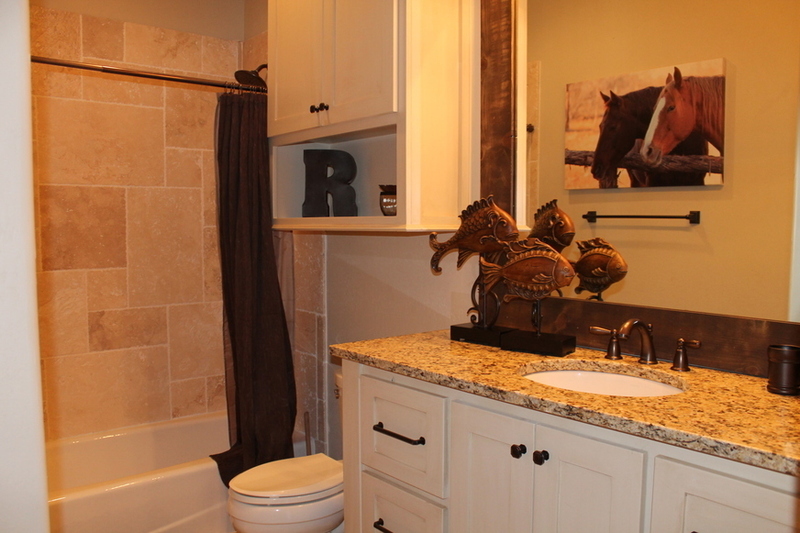 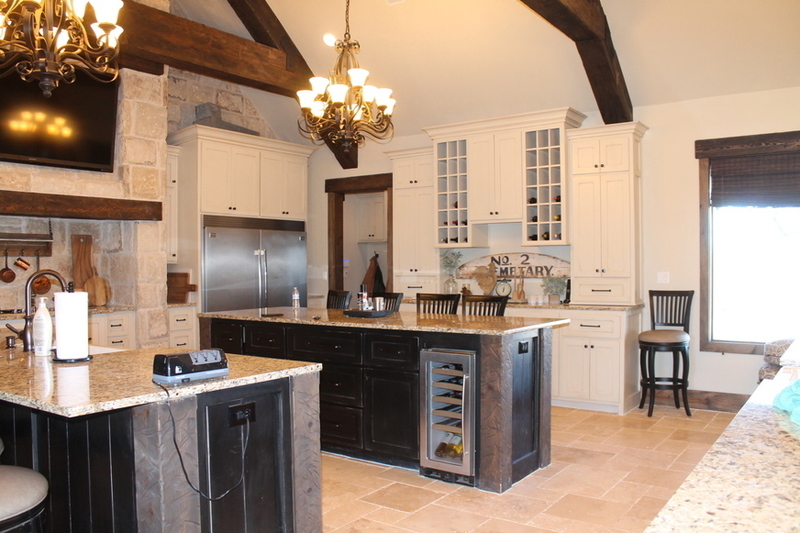 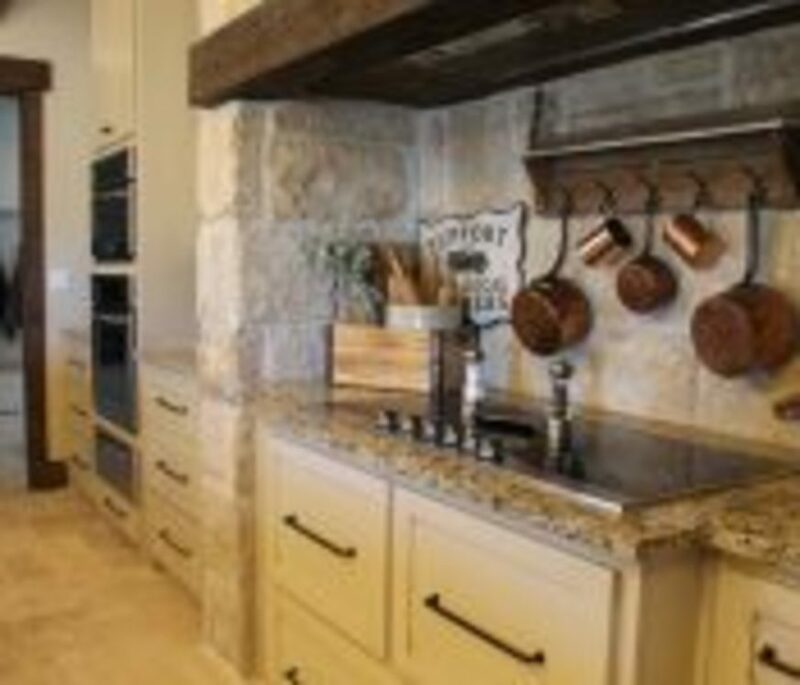 This entry was posted in Featured - Top, Ranches on August 3, 2015 .